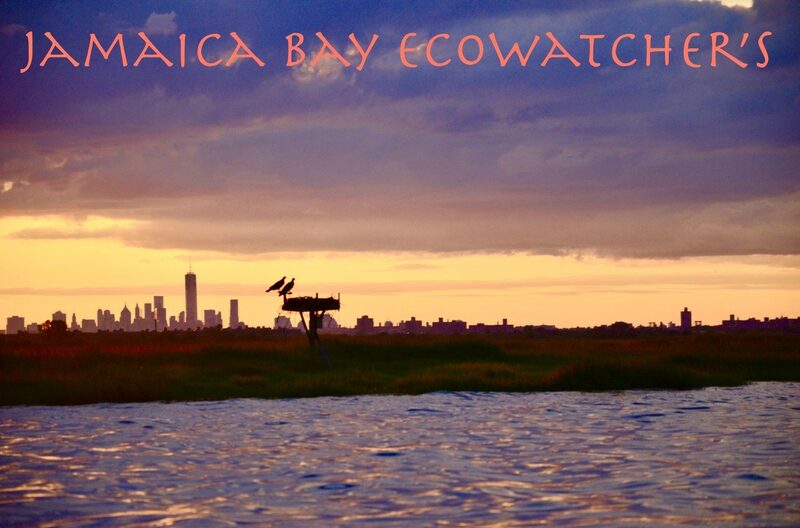 The Jamaica Bay Ecowatchers are dedicated to the preservation, protection, enhancement and restoration of the fragile ecosystem of Jamaica Bay. We have been and will continue to serve as the advocacy organization for the environmental concerns for Jamaica Bay. Most critical fish in the sea must be protected! 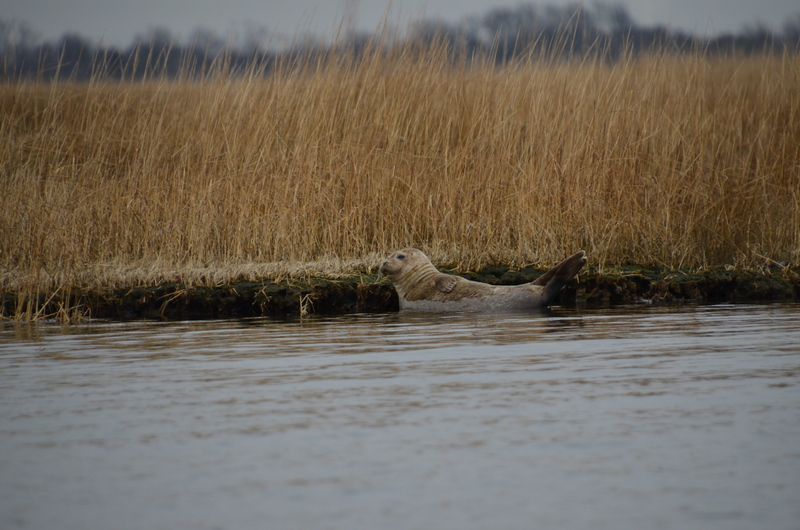 …“Mundy says a big contributing factor to seeing more seals is the unique depths of Jamaica Bay. 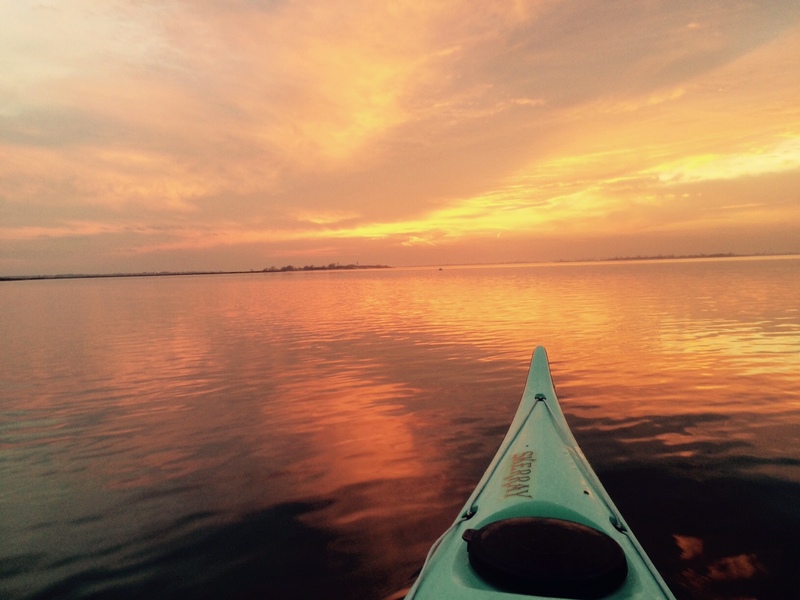 “Jamaica Bay isn’t like the Long Island Sound with shallow waters. We have some areas that are 60 feet deep and these areas support this massive amount of bio-life like herring and large mammals that come into the area like seals. 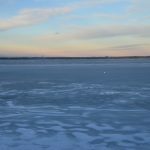 This is a great indicator for the bay and the health of the water, but it’s also possible because of the deep areas,” Mundy said. 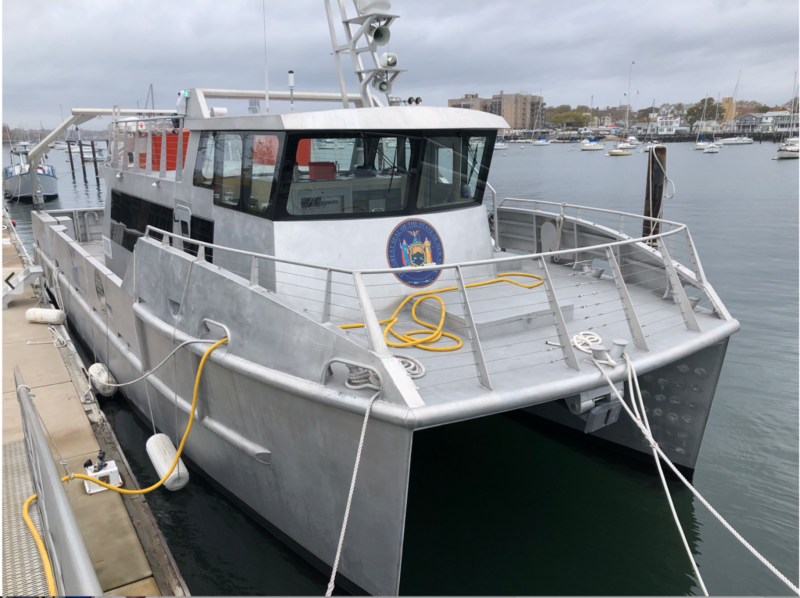 The vessel above is the CUNY-1 which is the research vessel built for the SRIJB-( Science and Resiliency Institute at Jamaica Bay) and is used at times for scientists to conduct research on.However much of the time it sits idle. The Ecowatchers have partnered with Adam Parris , SRIJB Director, and Councilman Constandide NYC Councilman -Astoria ( and chair of the NYC Council Environmental Committee) to propose having the NYC Council fund operational costs so that it could be used to take out classes of school children to explore the bay and conduct research experiments. There is not such opportunity at this time and it would be a wonderful experience for children to partake in. We will be conducting a pilot trip this spring and then hoping to go full scale over the summer and then into the fall. Great way to educate children and create our future Environmentalists!! The fall Jamaica Bay Task Force Meeting saw a full house attendance for a number of very interesting presentations about Jamaica Bay. Below is a summary of the night with links to most of the presentations. FIrst presentation of the night was by Major Amelia A. Smith USPS, Commander, NY. Field office . Major Smith along with Capt Closs gave an update on the overall operations and focus of the NPS police in Jamaica Bay. They highlighted the actions that they have taken over the last year in particular with a focus on poaching activities , a big concern for environmental stakeholders. Different feed back was obtained from those present about particular areas that needed attention in regards to this issue. They assured all that they would take this information back and act on it. In addition the contact phone number for their dispatch station was noted…it is 7`8-338-3988. They urge anyone who notes illegal behavior to call in and report it. 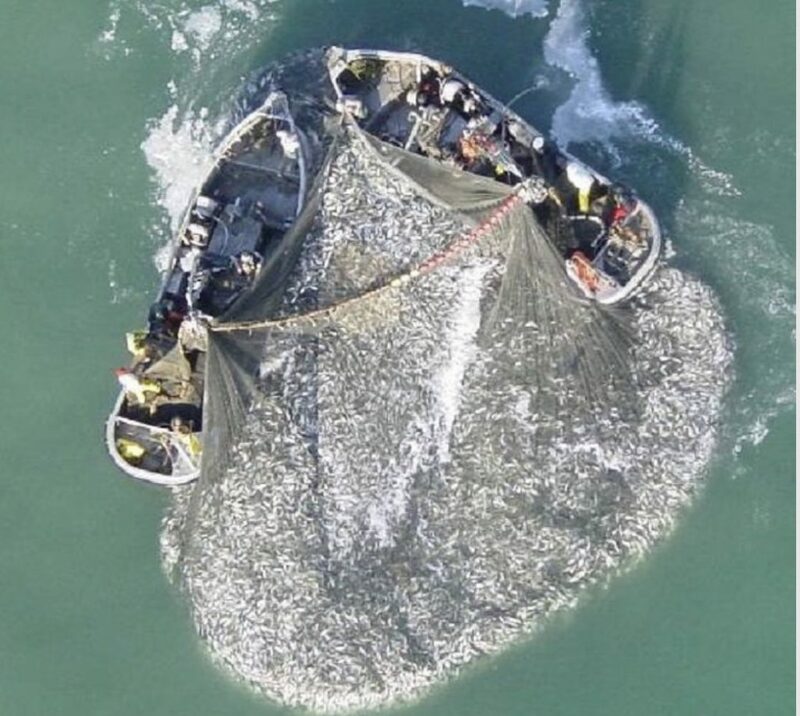 The issue of Seine Netting from the shoreline with very large nets was brought up as an activity that is having a very negative impact on marine life. Peter Weppler, Chief Environmental Planning Branch U.S. ACOE gave the second presentation of the night focusing on the future ACOE plans for storm protection for Jamaica Bay and the communities that surround this estuary . 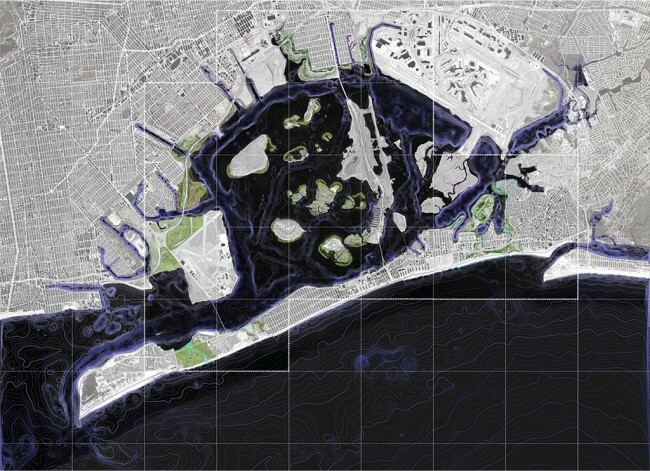 As Pete noted the plan has changed since its first draft and now has a nuumber of potential proposals from on action to a storm gate only for Jamaica Bay ( located just east of the Marine Parkway Bridge) to a massive plan that would see a storm gate from Breezy Point all the way to Sandy Hook New Jersey. The full plan can be reviewed HERE. 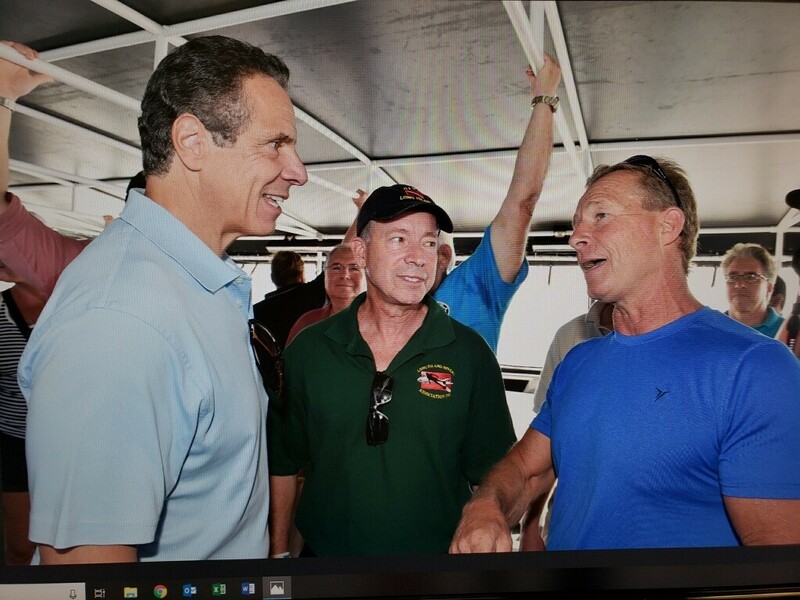 Today the Ecowatcher’s were invited to join Governor Cuomo and small group of environmentalists, divers and fishermen as the state deployed more material from the Tappan Zee Bridge in the waters off of Long Island as part of the largest artificial reef enhancement in state History. 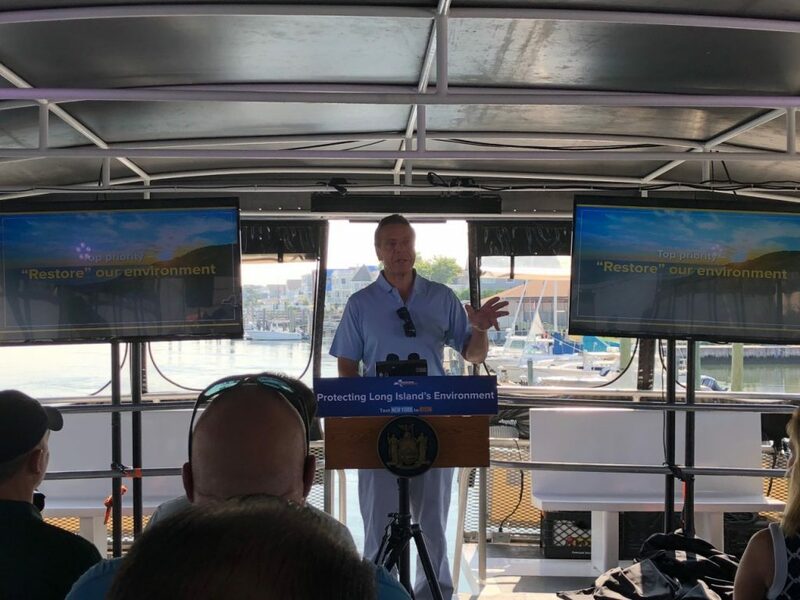 After the Governor spoke of the amazing positive impact this type of reef building has on the marine waters the group was shown a video of the goals of this program. This included video and still photos from artiifical reefs. Most of that video was taken by the Ecowatcher’s during their dive operations conducted off of the coast of Rockaway Beach. The full presentation can be seen here. SUNSET COVE PROJECT IS UNDERWAY !! The Sunset Cove project is fully underway after many years of effort to get it funded , designed and approved.! — When completed the 15 acre site will see an entrance plaza, walking trail along a raised berm, a maritime forest,restored wetlands and wetlands creek, and finally a boardwalk out over the wetlands created out of the restored Rockaway Boardwalk Lumber. The Boardwalk will lead to a covered viewing/outdoor classroom area. This project, at the southern end of Broad Channel, will provide access and views that do not exist anywhere in the city. The area will also host an Eco dock for local school children to visit and conduct studies. BIg thanks to Borough President Melinda Katz, Dan Brown, Assemblywoman Amato, Senator Addabbo, and Councilman Ulrich for all of your support on this project and to Mayor Deblassio for the commitment of the additional and crucial funds of 7 million dollars!! NYC Councilman Constantinides ( 22nd District) serves as chair of the Council’s Environmental Protection Committee he has a long history of fighting for environmental protections. 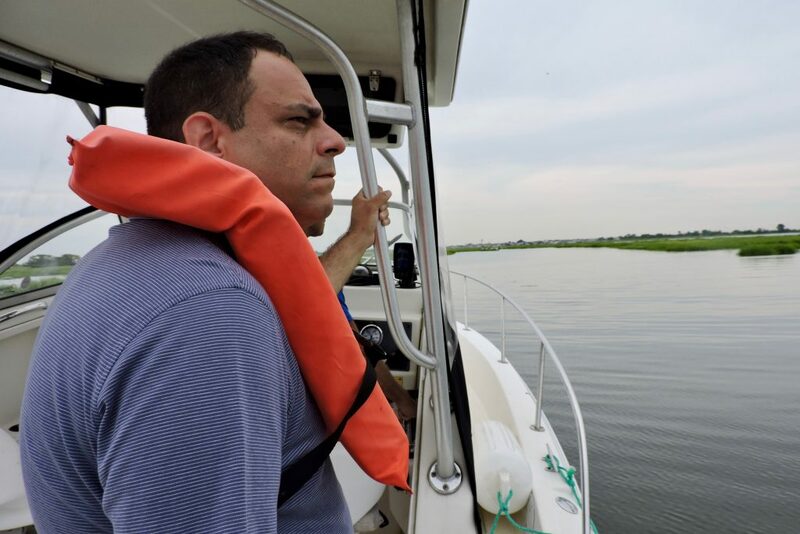 Today the Councilman took a tour of Jamaica Bay with the Ecowatcher’s to get an up close look at the bay and to see the progress and learn of the outstanding issues affecting this great natural resource. Great to see chair of the environmental committee giving up his time to get the local stakeholder perspective on Jamaica Bay ! 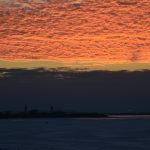 The New York City Department of Environmental Protection (DEP) today announced that work began this month on a $23 million upgrade to the Rockaway Wastewater Treatment Plant that will reduce the amount of nitrogen released into Jamaica Bay and help to improve the overall ecology of the waterway. The project is anticipated to be completed in 2020. This project complements the $460 million in upgrades that have already been completed to reduce nitrogen discharges from the Jamaica and 26th Ward Wastewater Treatment Plants, which similarly drain to Jamaica Bay. “Jamaica Bay is home to hundreds of plant and wildlife species. 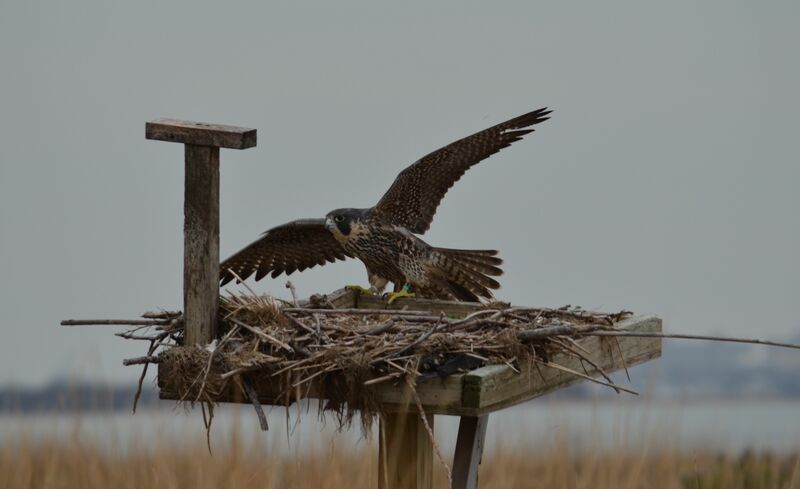 I applaud DEP for making this investment, which will protect the bay’s ecosystem and ensure that visitors can enjoy this local treasure for years to come,” said Council Member Eric A. Ulrich. In total, New York City produces, and DEP collects and treats, an average of 1.3 billion gallons of wastewater each day. 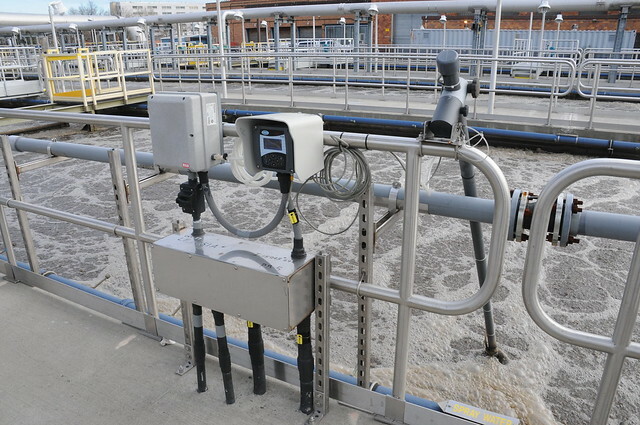 The wastewater travels through the City’s 7,500-mile sewer system until it reaches one of 14 wastewater treatment plants, where it is treated to federal and New York State water quality standards in accordance with the Clean Water Act, before it is discharged into local waterways. 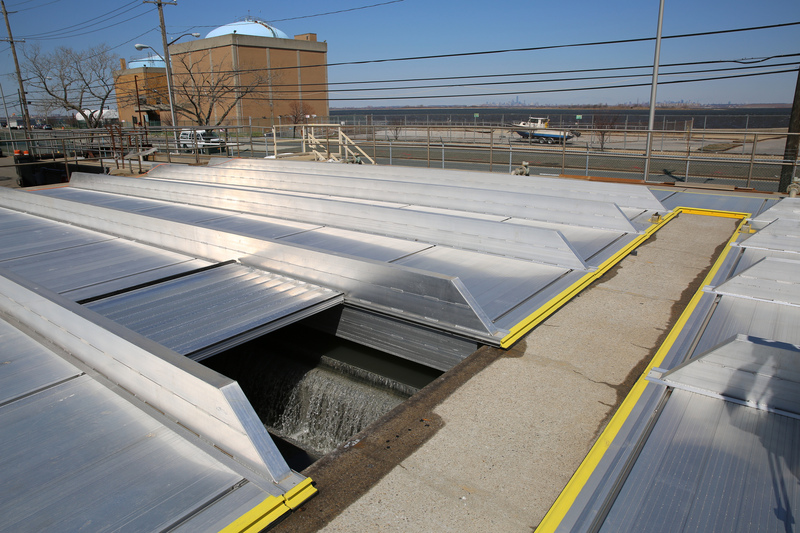 The Rockaway Wastewater Treatment Plant currently removes approximately 45 percent of the nitrogen present in the treated water. The introduction of new, enhanced nitrogen removal technology, which converts the organic nitrogen present in wastewater into inert nitrogen gas that is released harmlessly into the atmosphere, requires significant upgrades to much of the plants’ supporting infrastructure. Work at the Rockaway plant will include the installation of baffles and hyperbolic mixers, new process air distribution piping and local isolation valves, new foam spray pumps and strainers, a new polymer feed system and storage, the repair of existing concrete and tank joints, and replacement of tank ground water pressure relief valves as well as the electrical support system. Great discussion at the task force meeting tonight with a full room of folks representing so many groups that are working hard around the bay to protect this great natural resource. Thank you to the presenters who worked hard to put together these presentations and to all who came out to listen and participate. After a brief introduction of groups represented we heard from the Superintendent of the Gateway National Park-Jen Neresian of the recently announced plan to see the National Parks Service and the NY state parks co manage the Penn and Fountain avenue landfill parks as they are now looking to bring amenities to the parks and make them accessible to visitors who would like to hike or bike ride thru this unique area that offers spectacular views of Jamaica Bay.Exciting renditions of what the park will look like were offered and the full presentation can be seen here. The second presentation of the night was made by Steve Zahn the NYSDEC region 2 director. 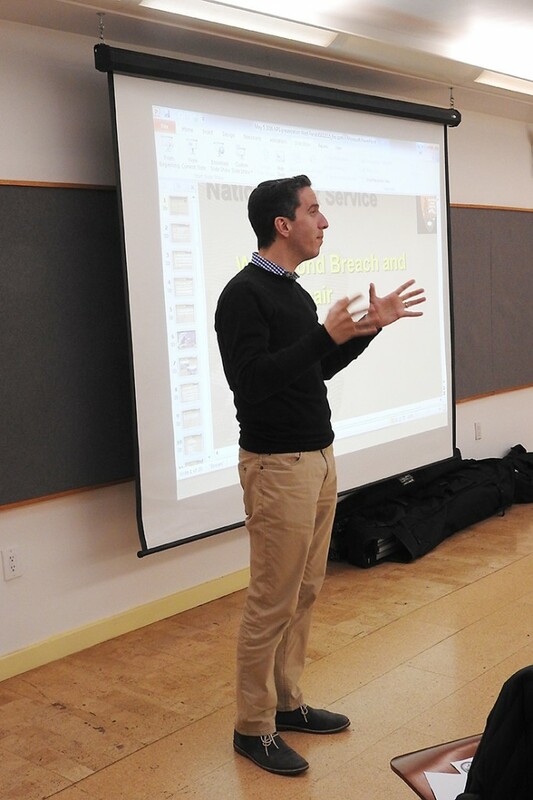 His presentation was an update on the plan to implement the HMGP-federal Hazard Mitigation Grant Program to conduct an environmental restoration project at Spring Creek south which will double as a storm resiliency project to protect the Howard Beach neighborhood.Steve’s presentation can be viewed here . The third presentation was made by Distinguished professor Jeff Levinton of Stony Brook University . Professor Levinton has been conducting studies in the bay for years focused around Oyster restoration and water quality. Professor Levintons presentation titled- Nitrogen Input and Spatial and Historical Variation in Water Quality can be seen here. 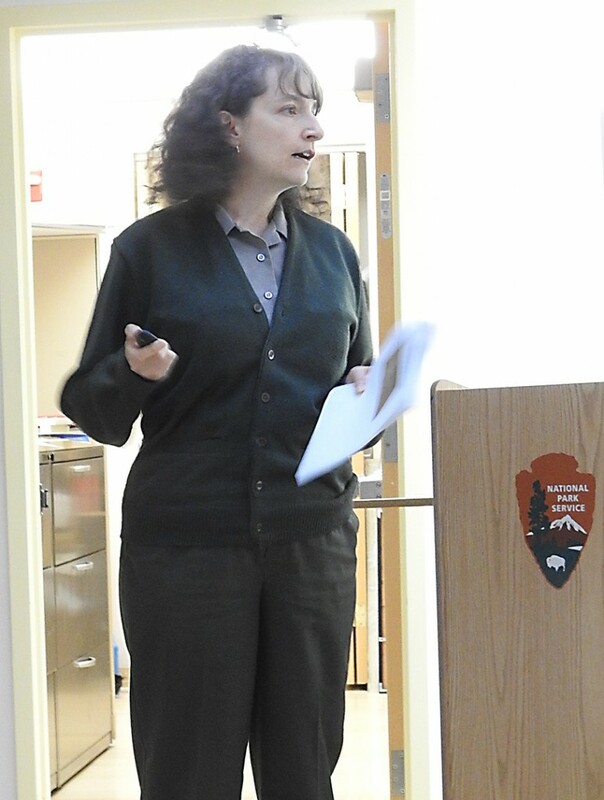 Elizabeth Jordan, Ecological Restoration Manager, NYC Parks was the fourth presenter of the night . Elizabeth presented details on the next major restoration project to take place in Jamaica Bay.. the Sunset Cove wetland and maritime forest project. Tremendous interest involves this 14 million dollar restoration project which is set to break ground next month. See Elizabeth’s presentation here. It was a great night with a number of interesting q and a sessions. The meeting highlighted the tremendous interest in Jamaica Bay and the progress that is being made in protecting and understanding this unique natural resource. 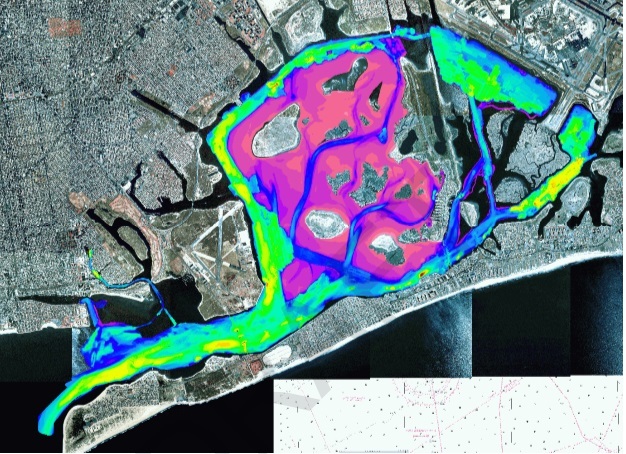 DEEP AREAS OF JAMAICA BAY-HARMFUL OR BENEFICIAL TO THE BAY ? The history of accurately understanding Jamaica Bay as well as recognizing critical changes to the bay is one where the local knowledge and input has far outpaced that of Academics and Agencies. When the Marsh loss was occurring throughout the bay at a rate of 40 acres per year it was not the agencies tasked with managing or protecting the bay, namely the National Parks Service or the New York State Department of Environmental Conservation, that first recognized this. Rather it was the local fisherman, divers, kayaker’s and bay enthusiast’s who make up the Jamaica Bay Ecowatcher’s who identified and documented this occurrence. The exact same thing happened when the city began to discharge massive amounts of nitrogen into the waters of the bay and fish die offs and “brown tides” were observed …again it was this local group that led the warning cry on what had happened. Time and again it is local knowledge that is first to identify a change or concern or to better understand what takes place in the bay throughout the various changing seasons. Ask a local fisherman and he can tell you when the striped bass will move in and when they move out and why that occurs when it does . 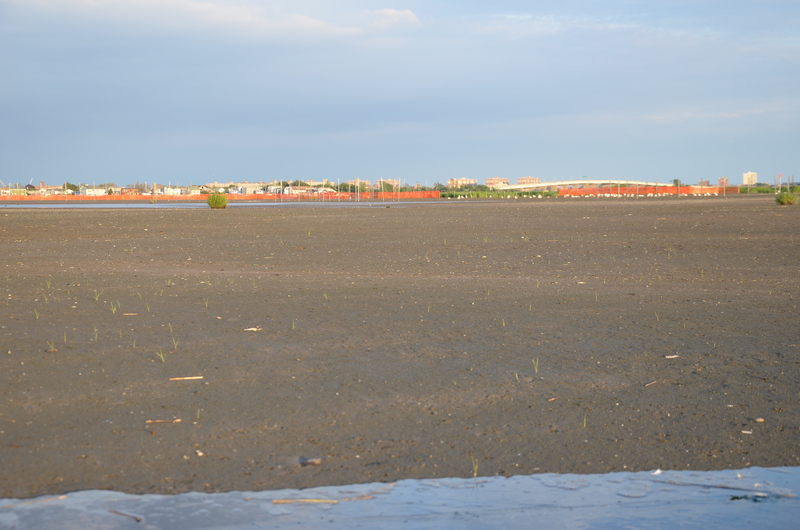 This history is important to understand as we move to a new conversation on the bay which is the deep portions of the bay, often called borrow pits or borrow areas, which can be as deep as 60 foot and which were created when those areas were dredged to fill in adjacent upland areas such as JFK airport, New Howard Beach , Or Floyd Bennett Field . 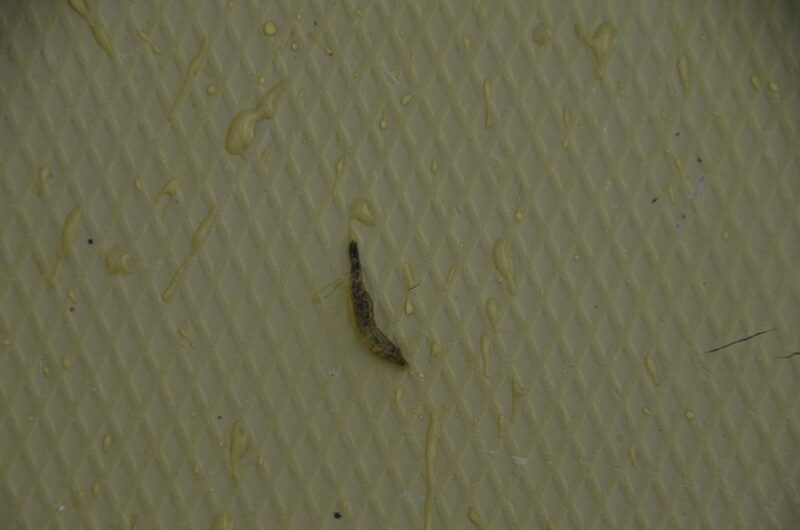 Lately there have been many in the academic area , and the agencies as well, who point to these areas and note the occasional low dissolved oxygen periods ( usually short periods of time during the high heat periods in the summer) as well as the benthic habitat present ( some areas soft mud) and see a “dead” or “low value area” . There have been some who support filling in these areas with massive amounts of fill ( that is another topic as some of that discussion focused on contaminated fill) and think that the result will be a much more productive marine environment. To many of the active local groups such as the Ecowatcher’s this is in a word…Horrifying! it appears to shows a lack of understanding of the VALUE of these areas. First lets talk VOLUME. Many academics see the bay , incorrectly, as a one dimensional area, such as it is portrayed on the map. You have land, marsh and then water areas. This fails to understand the massive cubic volume that the deep areas contain. These areas in essence multiply many times over the size of the park. They are noted for the presence of massive schools of fish at different times of the year. The different schools of fish, from Menhaden ( bunker) ,to Striped bass, weak fish, Blue fish all are noted , again by locals, in different depths of these “holes”. These deep areas have created a habitat opportunity for millions of fish. 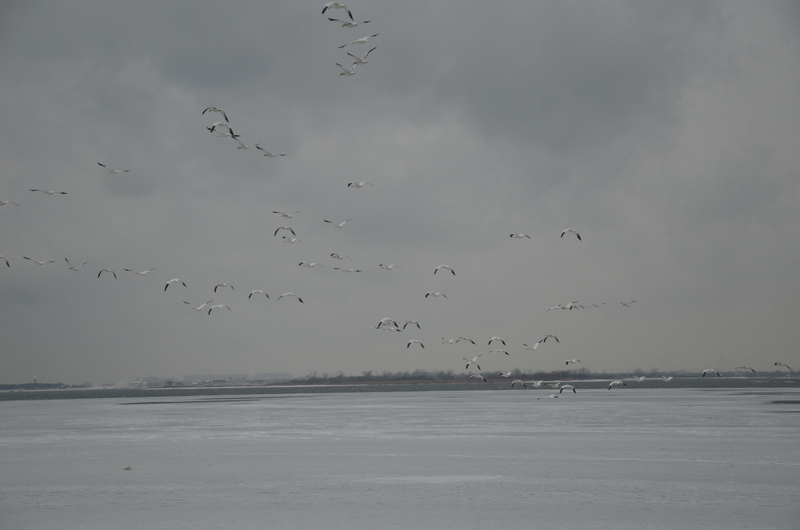 It is one reason why Jamaica Bay is noted for its tremendous fish life in both diversity and volume. This would not be possible without these deep areas. Second lets talk talk Heat and Temperature. These areas act as “Heat Sinks” in that they absorb the high heat that occurs during heat waves in the summer when we see, in the shallow areas , water temperatures approaching 86 degrees ( f) . When that occurs in the shallow areas we see hydrogen sulfide conditions from the off gassing of the ulva and a big exit of marine life from those areas. In contrast the deep areas seem to present a live able habitat for many of the smaller species of fish ( that do not exit out to the ocean when the tide drops) and in these areas we see water temperatures that are much cooler. The bottom line is that while not natural these deep areas of the bay are a tremendous benefit to the marine life of the bay and have created a situation where the bay has much more volume then if it were shallow and that volume provides both habitat and heat absorption value that is critical. This is recognized by local groups like the Ecowatchers and must be both understood and recognized by the “experts” in both academia and the agencies if they are going to fully understand what is occurring in Jamaica Bay. Recent Cold Snap Freezes Jamaica Bay. Great meeting last night of the Jamaica Bay Task Force. 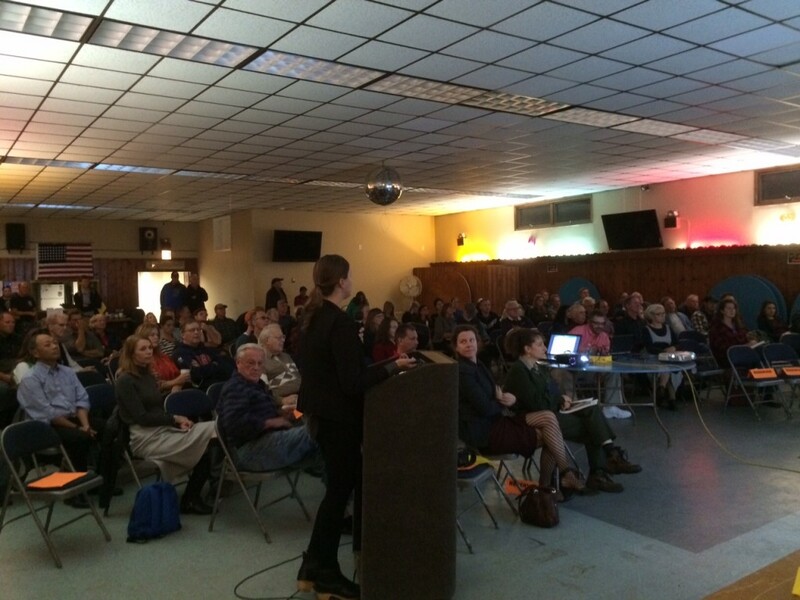 Full house turned out to hear Six presentations about great projects going on in Jamaica Bay. Below is a brief summary of those presentations with a link to the power point. First up was Don Riepe from the American Littoral Society. Don discussed the clean up efforts that his team undertook over the summer including the great work done by his restoration Corps. This was a group of young folks who worked as a group around the bay under Don’s direction conducting cleanups ,planting spartina, and installing Osprey Nests. See full presentation HERE. Next up was Bill Young discussing Ecological Restoration at the Wild life refuge in which tens of thousands of new native tree species are being planted. 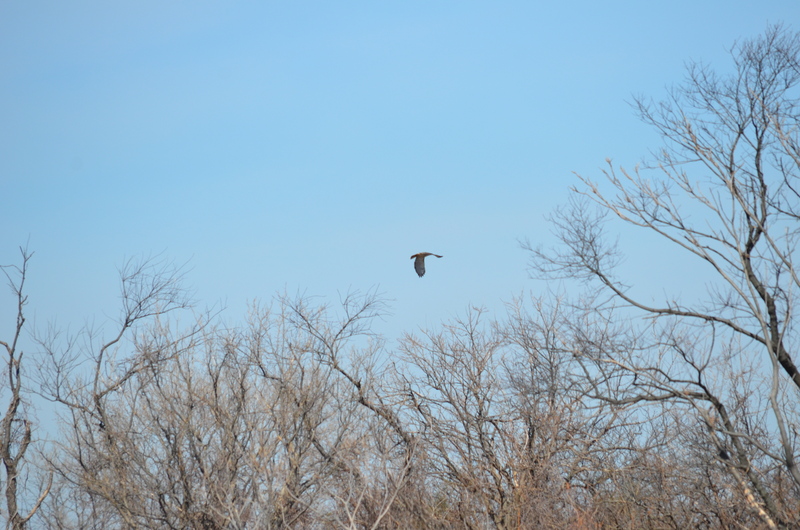 It will be a huge benefit to the park and to the bird species in particular. 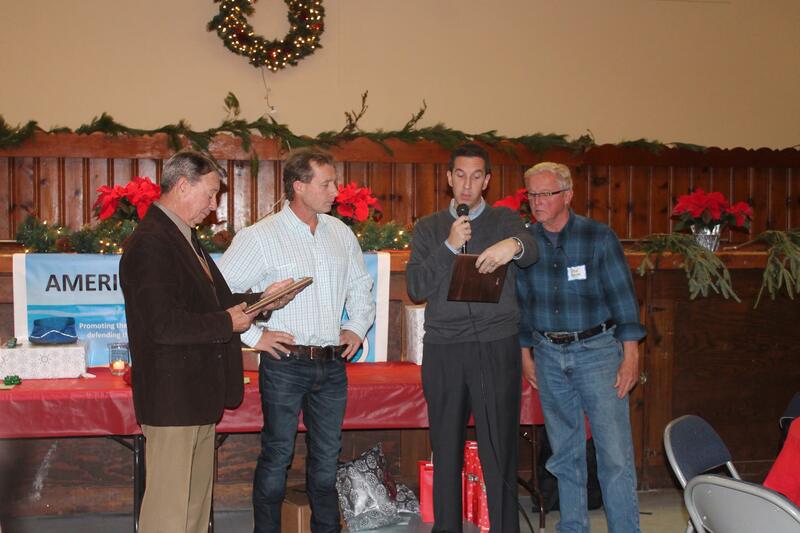 In addition Bill discussed numerous projects around the bay that he has been involved with and that have made a huge impact on the Habitat of the Bay. Bill led a very enthusiastic and interesting presentation and the full discussion can be viewed here. Mayor DeBlasio announces that the city will put an additional seven million dollars to ensure the Sunset Cove project will proceed and to close the funding Gap. The Jamaica Bay Eccowatcher’s are extremely pleased to announce that the tremendous efforts that they have led to see the funding gap closed have been successful… the Mayor has heard us and is stepping up to ensure that this critical and exciting environmental project will be funded. This project went out for bid in May and the bid proposals all came back far in excess of the 7 million dollars that had been secured for the project. The bids were all double that amount coming in at close to 14 million dollars. 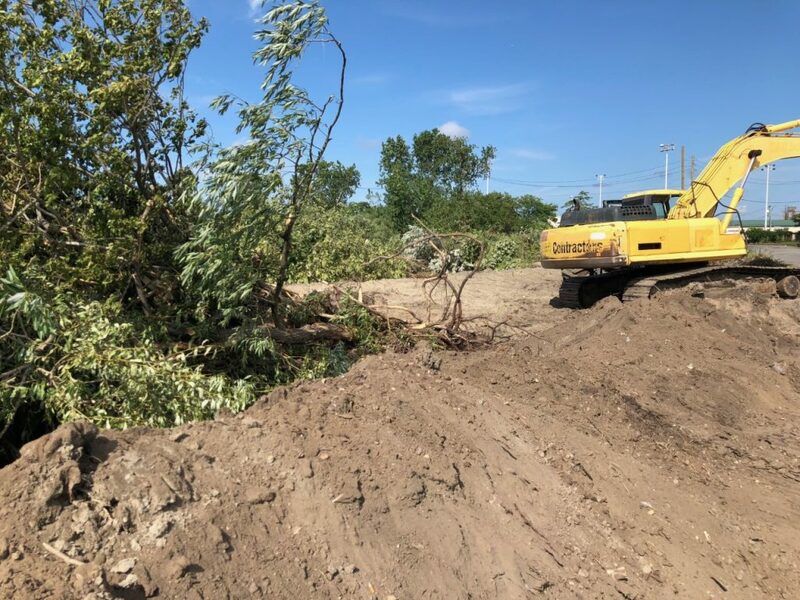 The project, which will see a restored wetland and tidal area, a maritime forest and a protective dune that will double as a walking trail, was in jeopardy and immediate action needed. The Ecowatcher’s immediately reached out to Borough President Melinda Katz, Assemblywoman Stacy Amato, State Senator Joe Addabbo and Councilman Eric Ulrich. These elected officials all helped to make the case to the Mayors team that the largest and most exciting environmental project about to take place in the city had to see the additional funds procured . Deputy Mayor Alicia Glen was critical to this effort and the Mayors office of Resiliency, led by Dan Zarilli, helped to identify additional funds in short order to ensure that the bid process would not have to be duplicated and valuable time lost. This additional funding will also ensure that the fully funded phase two portion of the project can proceed as well. 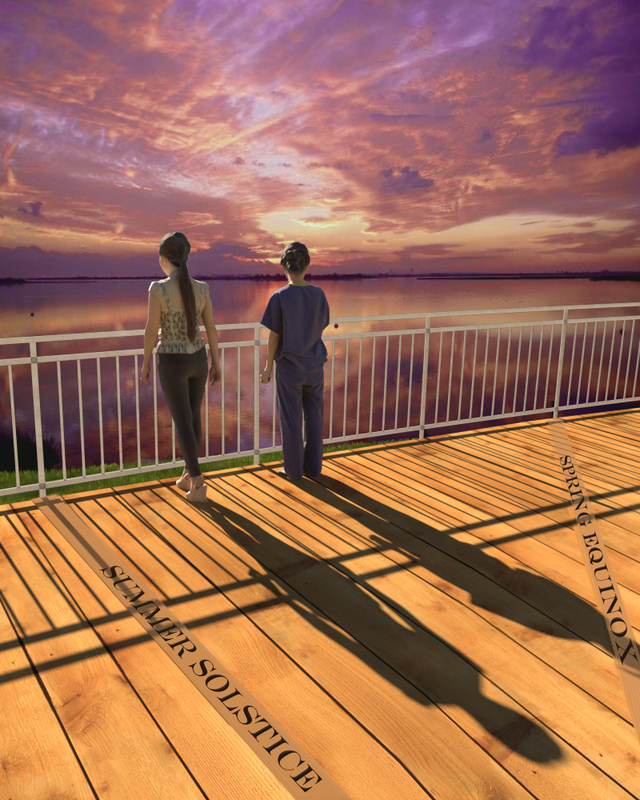 That project , in the final stages of design, will then see a unique boardwalk built out of the salvaged Rockaway boardwalk lumber that will allow for an interactive experience as visitors walk out over the wetlands and will also include an eco dock that will allow for visiting school children to conduct oyster studies in the cove. West Pond Breach is finally filled! Great to report that the breach to the west pond has been finally filled . Additional construction is ongoing to protect the shoreline perimeter before it will be open to the public. This is a great step forward in our ongoing recovery from Hurricane sandy. The repair will once again allow for the west pond to be a critical fresh water water source and also allow visitors to experience the unique and popular loop trail with its fantastic views of fresh water , salt water environments and of course spectacular views of the NYC skyline. 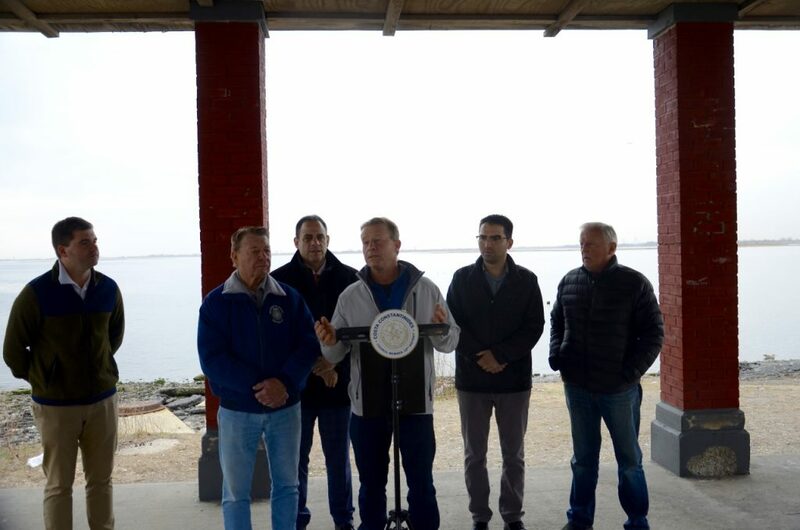 The JAMAICA BAY ECOWATHER’S led this effort calling for its repair only days after Hurricane Sandy and petitioned both our elected officials and NPS to get this addressed. National Parks Superintendent Jen Neresian did an outstanding job in procuring funding and making this happen! SIGN THE PETITION TO SAVE MENHADEN !! 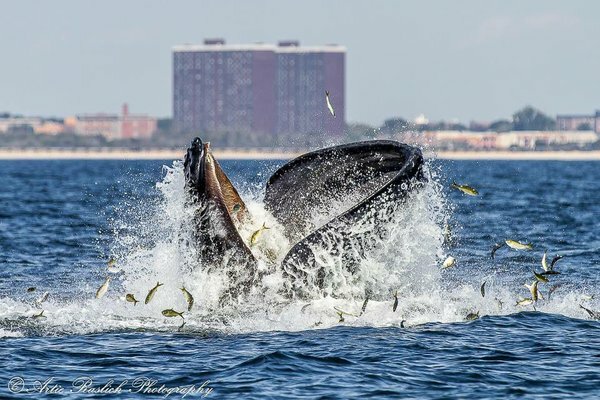 Our cleaner waters coupled with the large numbers of Menhaden ( known locally as Bunker) are the reason we have been seeing such an increase in large Marine Life such as Whales and dolphins. The Menhaden are the most important single species in the sea and have been targeted by large corporations such as Omega Protein. Take action to protect them. 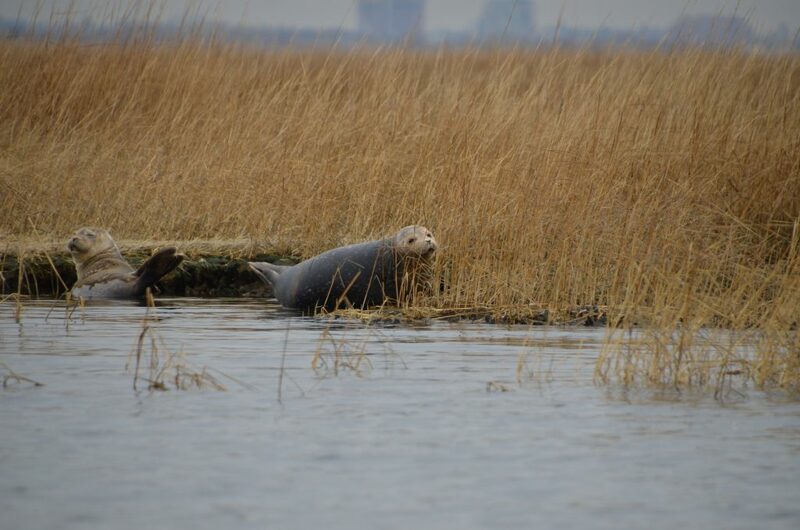 GREAT NEWS THE JAMAICA BAY BILL HAS BEEN SIGNED INTO LAW !! GREAT NEWS–JAMAICA BAY BILL IS SIGNED BY GOVERNOR !! The Jamaica Bay Ecowatchers have been working extremely hard to see that the legislation that they helped author, that would extend out for five more years the protection to the waters of Jamaica Bay, would be passed into law. We are very happy to notify everyone that the bill was signed by Governor Cuomo late yesterday and it is now indeed the law of the land!!. 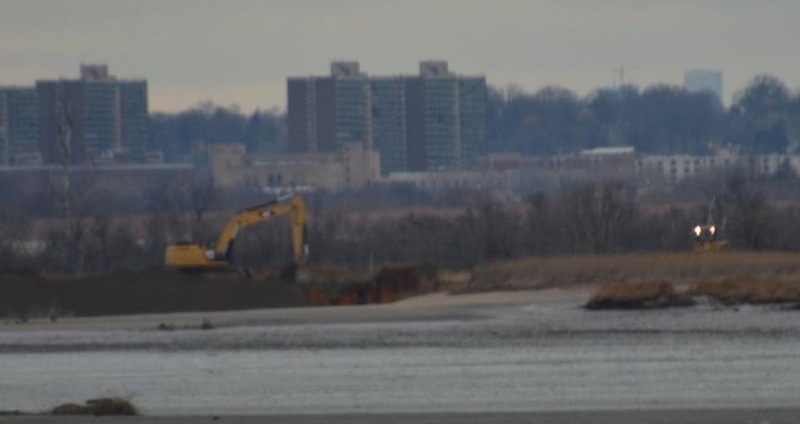 The Jamaica Bay Ecowatcher’s are extremely pleased to learn that Governor Cuomo has signed the Jamaica Bay Borrow Pit Bill which will ensure the Bay is Protected from plans to fill its deeper portions with Contaminated fill ! Assemblyman Phil Goldfeder and Senator Joe Addabbo championed this effort and pushed hard to ensure its passage. 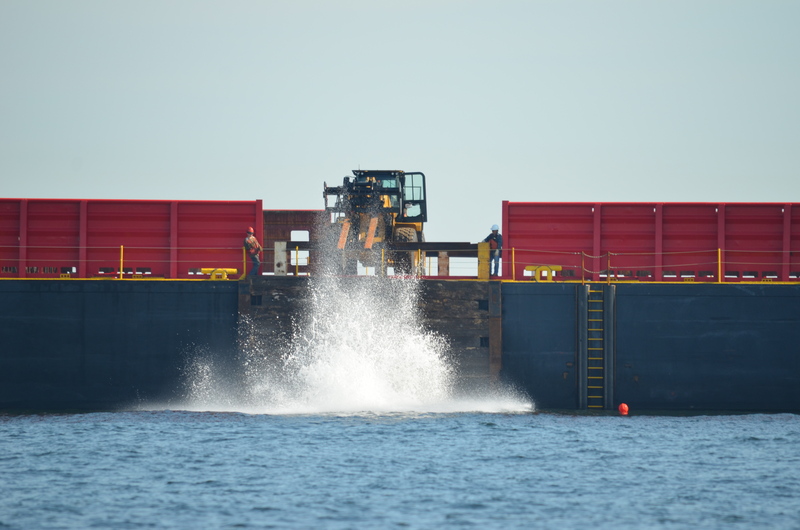 The bill closes a loop hole that allowed for dredge material to be placed in the waters of the bay that would not be approved for open ocean placement due to its contaminated nature. This loop hole coupled with the expensive nature of disposing contaminated fill created a financial incentive for agencies tasked with getting rid of this type of material to look to the deep areas of the bay as attractive alternatives. In recent years they have even used inaccurate scientific basis, such as the deep areas of the bay are devoid of life, to make it seem that it would be a type of restoration effort. 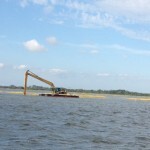 Environmental organizations have scoffed at such proposals noting the immense fish and marine life found in these deep areas and pointing out the fact that the dredge material contained PCB’s and heavy metals, not the type of material one would consider putting into a critical estuary. 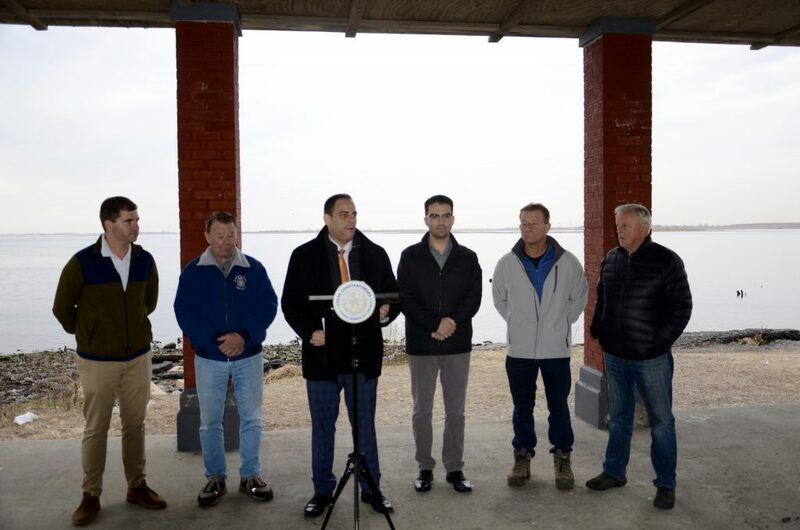 It is fitting that this will be the final legislative effort of Assemblyman Goldfeder who was a true champion of Jamaica Bay and the efforts to see it protected and restored for future generations. We are extremely pleased to see Phil’s replacement Assemblywoman Elect Stacey Pheffer Amato immediately jump into this fight calling in to Albany in the last few weeks urging the Governor to sign this bill and make it law. She is going to be a great advocate for the Bay and has already been out to tour the bay with the Ecowatchers looking to understand the various projects and challenges that we are involved with. Going forward with great supporters like Senator Addabbo and Assemblywoman Pheffer we feel extremely confident that Jamaica Bay will continue to see great things happening!! The west pond repair is well underway in the effort to restore this fresh water pond. 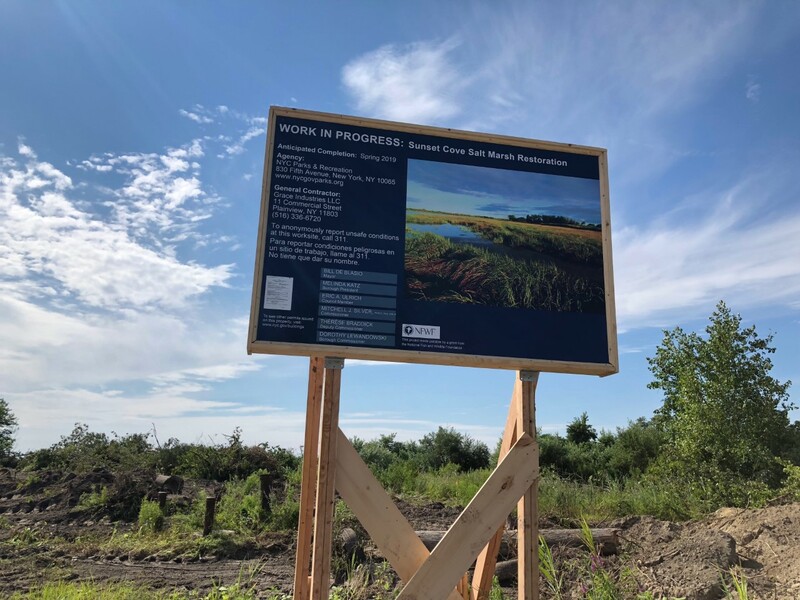 The project will restore one of the premiere experiences of the wildlife refuge …the loop trail which allows visitors to circle the fresh water pond while enjoying the spectacular views of Jamaica Bay, the fresh water pond, and the Manhattan skyline in the distance. These photos show progress to date and the large breach already partly filled in with construction continuing . When completed the repairs will also include a water control valve to allow the pond to be drained in the future when needed. Next up was NPS Superintendent Jen Neresian who began by addressing the concerns that were highlighted in the first presentation and She told the crowd that they were in the process of hiring an outreach person to reach out to the Hindu Community in order to educate residents of the negative impact of not taking away the ceremonial debris. In addition she stated that NPS would have a greater presence in these areas going forward. Jens entire presentation can be viewed here. Dans Full presentation can be found here. Fourth Presentation of the night was given by John Mcloughlin of the NYC DEP on that agencies large scale oyster project at the head of the bay. This Project seeks to discover if oyster spat from oysters hanging in large scales and suspended by Buoys would settle on substrate dispersed on the bottom below. That substrate was made up of both clam shells as well as crushed recycled porcelain toilets. This is the largest oyster project to take place in the bay to date and will give enormous data when it is concluded. Hopes are it could lead the way to numerous oyster reef creations in areas that have been identified thru modeling as ideal for spat settlement. The final Presentation of the night was given by Dan Falt of the ACOE on the REformulation plan for Rockaway and Jamaica Bay to create storm resilience in the event of future storm events. Dan concentrated on the Surge Barrier that is proposed for Jamaica Bay adjacent to the Gil Hodges Bridge. The ACOE has extended its comment period to December 2nd for those looking to weigh in. The Science and Resilience Institute at Jamaica Bay, with Princeton University, wants to understand how flood protection programs can best support the needs and values of your local New York and Jamaica Bay neighborhood. 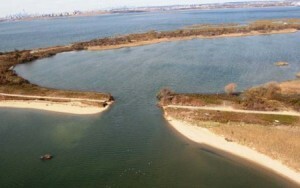 The Jamaica Bay Ecowatchers had worked with the New York State DEC to see that the Williams Rockaway Pipeline project would require offset mitigation in the form of funding for supplemental material to be placed at the designated Rockaway Artificial reef and in the form of wetlands creation at Sunset cove. The Ecowatchers conducted dive surveillance of the reef sites and were very encouraged with what we observed. 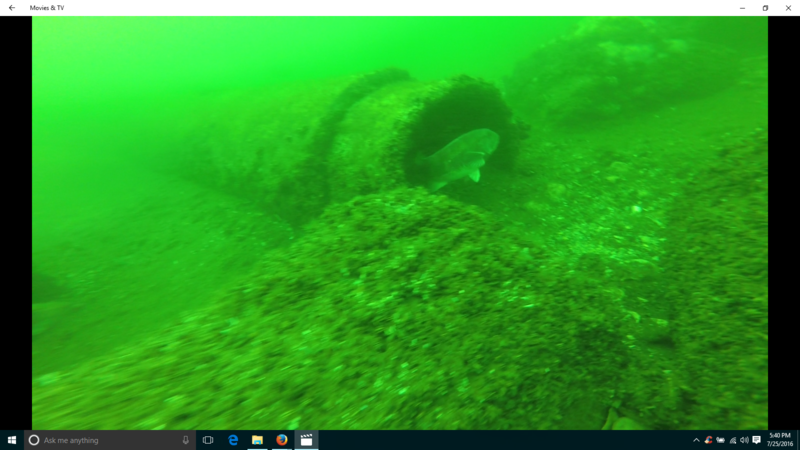 The reef material , 24 inch concrete tubes, were already covered in mussels and corral and the areas inhabited by large schools of fish including Tautog, sea bass, Fluke, small bait balls, and lobsters. This is only 8 months after the material was placed and the transformation is really amazing to see. There was an episode of Hydrogen Sulfide impacted water quality in Jamaica Bay over the last few days that resulted in possible die off or impact to shrimp in that area . 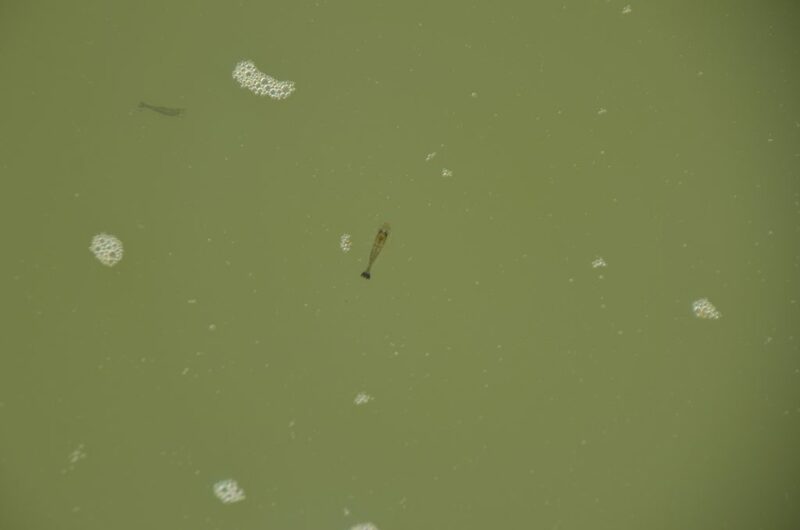 In the photos below you can clearly see the green colored water that stands out and then you can see a large number of birds feeding on the shrimp that were alive but swimming very slowly on the surface of the water. The shrimp seemed to be impacted by this water as they were swimming slowly on the surface and you could easily reach in and pick them up—both not normally observed behavior. 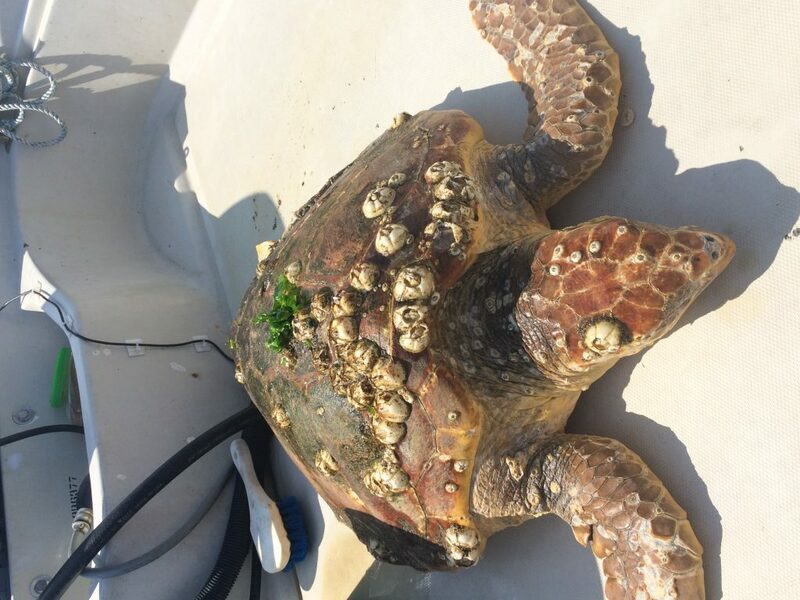 A local fisherman and member of the Ecowatchers discovered a large dead sea turtle floating in Pumpkin Patch Channel today. It appears to have been healthy but to have sustained some type of boat or jet ski strike to its shell. 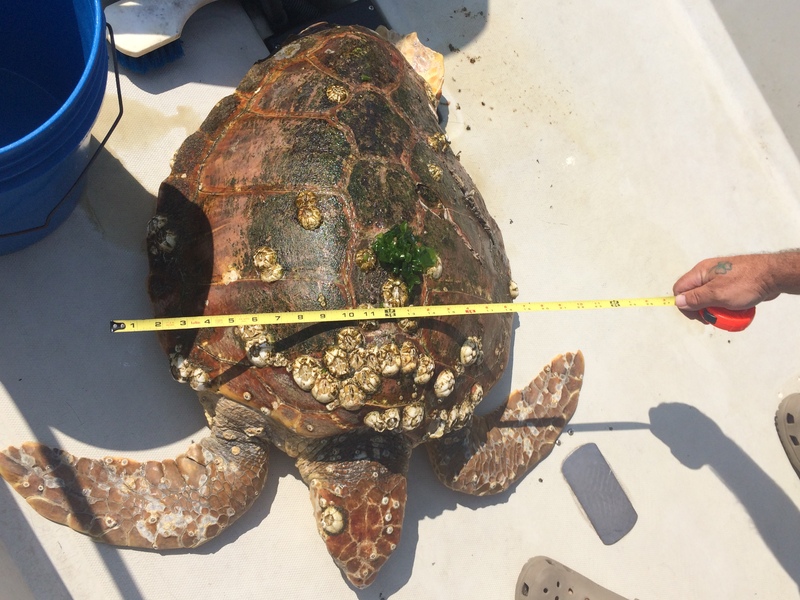 The turtle was quite large and measured 32 inches long bu 23 inches wide, The Ecowatchers secured the turtle and notified the Riverhead Foundation which sent a team to collect the trutle for a necropsy. 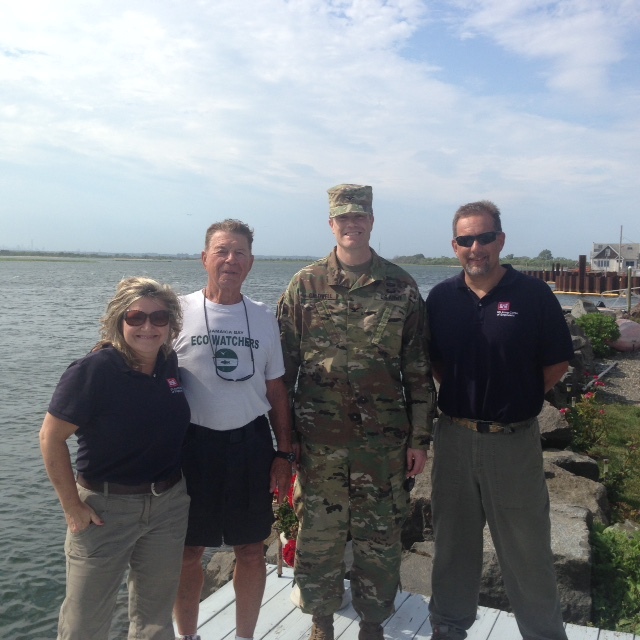 Colonel Caldwell Commanding officer of the New York District of the Army Corps of Engineers along with Lisa Baron and Pete Webbler from the ACOE and Dan Mundy of the Jamaica Bay Ecowatcher’s. 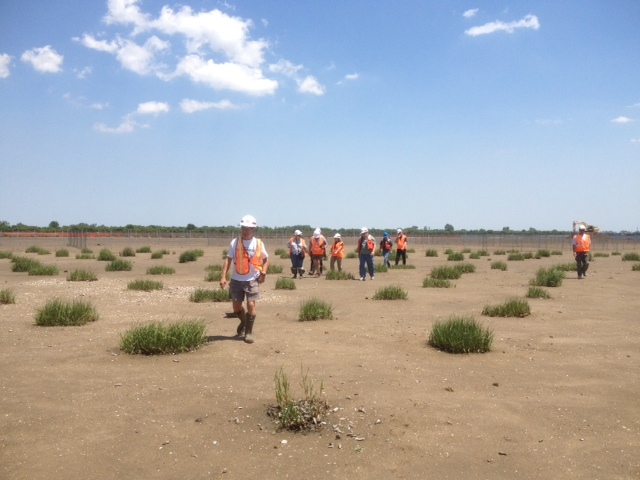 Colonel Caldwell toured Jamaica Bay with the Ecowatchers reviewing the numerous wetland island projects that the corps has spearheaded as well as the site of the proposed surge barrier gate. The tour included site visits to possible future corps projects that have been identified. The fifth presentation of the night was the much awaited Army Corps of Engineers Reformulation Study focusing on the back bay -Jamaica Bay Protection. When we had reached out to Dan and the Corps initially they had expected that he they would be at a point that would allow for a full presentation of this proposal. Particularly in light of the fact that it has been delayed from the initial proposed time frame. However due to internal discussions still underway about key elements of the plan Dan was not allowed to present a final preferred alternative that they had reached. To his credit Dan attempted to discuss the plan without going into full details. Basically the Corps will be choosing the alternative to build a surge barrier/sea gate. 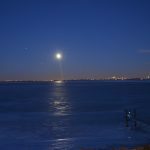 It will be proposed to be placed either just east of the Marine Parkway Bridge ( going form Floydd bennet field to the rockaway sea wall) or West of the marine parkway bridge going from Manhattan beach , near Kingsborough Community College, across to Breezy point. The Ecowatchers made the point, along with others, that they were concerned that all available modeling documents were not yet out and that they would be critical to understanding this proposal on water and marine life quality in Jamaica Bay. Also that there needed to be an adequate amount of time to allow for comments and concerns to be registered. SPRING ARRIVES IN JAMAICA BAY !! SUNSET COVE PHASE 2-BOARDWALK AND MARINE SCIENCE ACCESS MOVING FORWARD !! “When completed, Sunset Cove will present a unique visitor experience that is unmatched anywhere in this area. 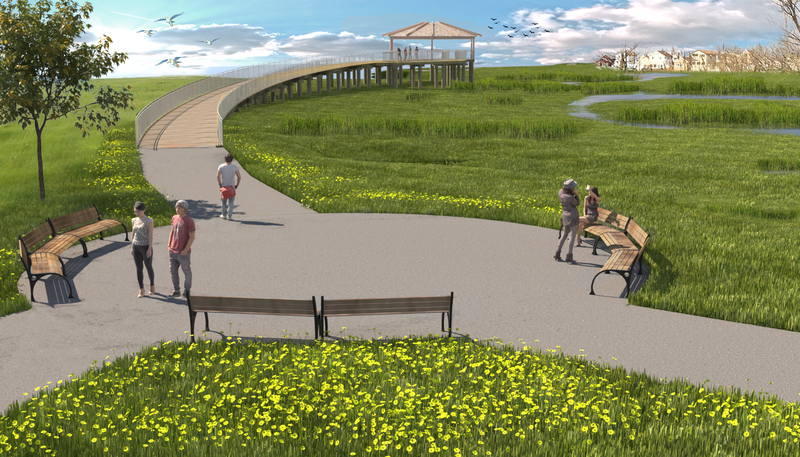 It will allow visitors to traverse out across and over the wetlands all while taking in the magnificent view of Jamaica bay and the Manhattan skyline. In addition, the project will provide opportunities for local schools to engage in marine science,” Mundy, Jr. said. 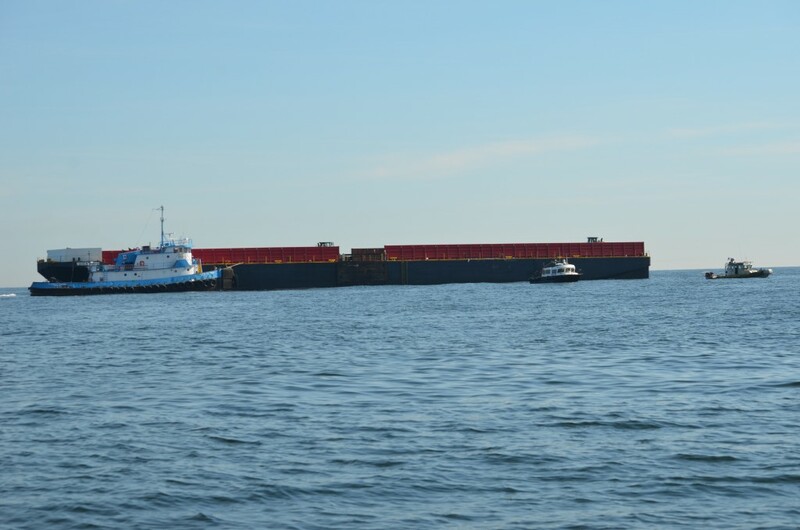 These photos capture the deployment of new sections of the artificial reef 1.6 nautical miles off the coast of Rockaway. The ongoing civic efforts of the Jamaica Bay Ecowatchers’ (JBEW) have been met with more great success recently, in the form of underway additions to the Rockaway Reef, a man-made underwater reef structure that lies 1.6 nautical miles off the coast of Rockaway. A project dating back to the ‘60s, the Rockaway Reef is a submerged linear network of concrete-coated steel piping; it functions similarly to naturally occurring reef formations in that over time it becomes an invaluable habitat teaming with diverse marine life. 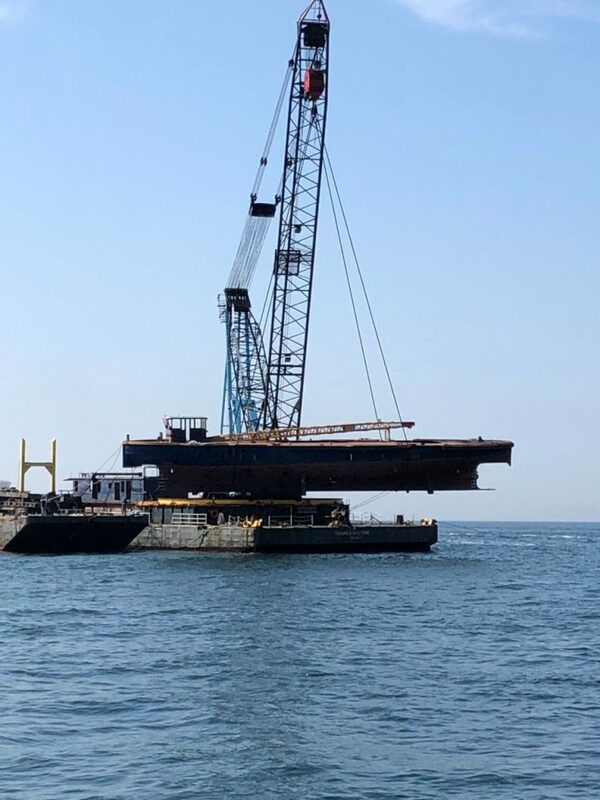 Over 450 new sections of this faux-rock are to be deployed off the coast of Rockaway, which will produce 16 miniature reefs in the project’s Designated Reef Zone. The New York State Department of Environmental Conservation (DEC) has already begun to place new pieces, each 2 feet in diameter and about 15 feet long, onto the ocean floor where they will eventually become covered in northern coral (Astrangia poculata) and inhabited by dozens of species of fish and crustaceans. Thousands of tons of rock, concrete, and steel, some of which is actually repurposed material from demolished structures like the old West Side Elevated Highway, have been installed here over the past few decades and make-up the reef as it is now. “The most current permit had sunset in 1989, resulting in no new material being added to the reef, and recent reports had indicated much of the previously placed material had silted or collapsed, degrading the habitat created,” according to a statement released by the DEC. What does still exist of these older reef sections are considered (by the DEC) to be “Essential Fish Habitat,” supporting finfish such as tautog, fluke, black sea bass and scup. The presence of these organisms also has positive economic implications, as the project areas become prime for sport and commercial fishing, as well as recreational diving, which boosts local small businesses. 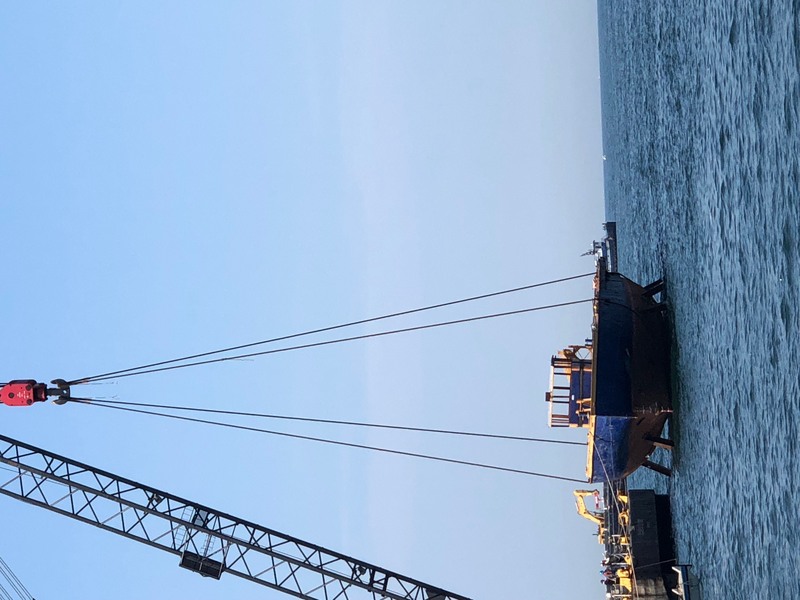 The Rockaway Reef is one of 11 sites managed by the DEC under their Artificial Reef Program—with two in the Long Island Sound, two in the Great South Bay, and six others in the Atlantic Ocean off the south shore of Long Island. It is Williams, the natural gas company associated with the Rockaway Delivery Lateral Pipeline Project, who is paying for the $1.6 million revival of Rockaway’s iteration of the project. Their newly implemented Rockaway Lateral pipeline, which received much contestation during its planning stages and construction, is linked to Williams’ major Transco pipeline, a 10,200-mile interstate transmission pipeline system extending from South Texas to New York City. 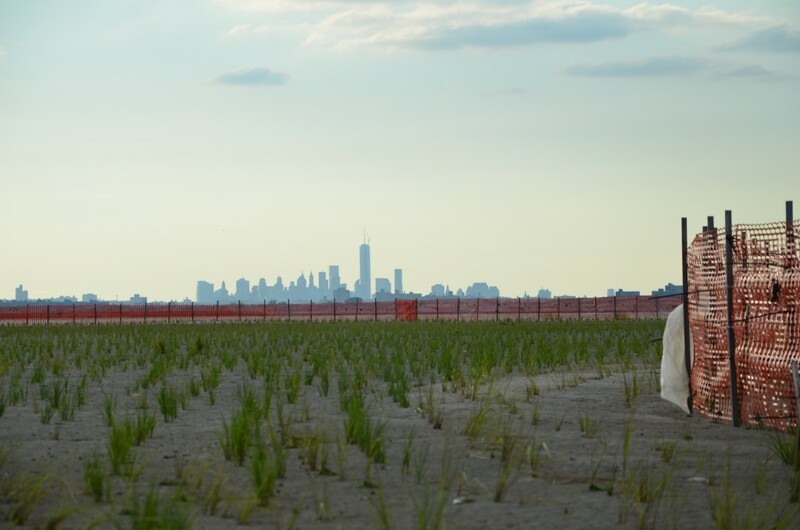 It connects to a previously existing Lower New York Bay Lateral pipeline, which runs parallel to the coast, and continues through Fort Tilden/Riis Park then up Flatbush Avenue in Brooklyn, with a metering and regulating facility at Floyd Bennett Field. Rockaway Lateral has commenced with service as of this past May. But while Williams is providing the funding for Rockaway’s reef project, it was Dan Mundy and Dan Mundy Jr. of the JBEW along with the Broad Channel Civic Association (BCCA) who had a strong hand in influencing them to do this. Initially opposed to the Rockaway Lateral but faced with an intense bureaucratic process should they have decided to fully pursue their resistance via the Federal Energy Regulatory Commission (FERC) as interveners, the JBEW instead came up with a more constructive approach which pushed for a certain amount of offset mitigation on the part of the corporation proposing the pipeline. 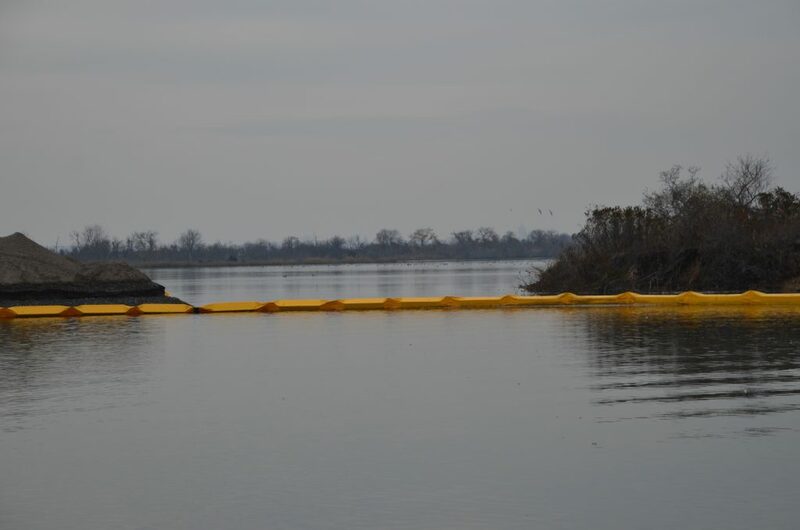 As part of this stakeholder “intervention,” the Rockaway Reef project was to be cited as a potentially compromised resource resulting from the pipeline’s construction, which eventually led to the decision to reactivate this project in particular as a required condition. The offices of both Assemblymember Goldfeder and Senator Schumer were vital political forces that converted the JBEW’s offset mitigation idea into a required condition of the project mandated by the DEC.
“We lobbied hard to ensure that this pipeline project would see an environmental ‘give back’ in the form of a $500,000 wetlands restoration project in Jamaica Bay (at the Sunset Cove site) and a $1.6 million reef replenishment project…” wrote the JBEW in a post on their website. And this has been the case, as in addition to the recent and more forthcoming reef activity, plans and preparation for Sunset Cove’s restoration have been in progress as well—and are moving forward. That project passed one of the final steps in the approval process earlier this month when it was unanimously favored by Community Board 14. It is scheduled to begin construction in June of 2016. 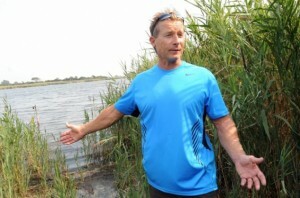 “At the end of the day, I believe that this is an example of how sometimes conflicting interests, environmental groups and corporate interests, can find common ground to allow a necessary project to go forward while ensuring that any impacts of such project are offset with environmental give backs,” explained Mundy Jr. in an email to The Wave. 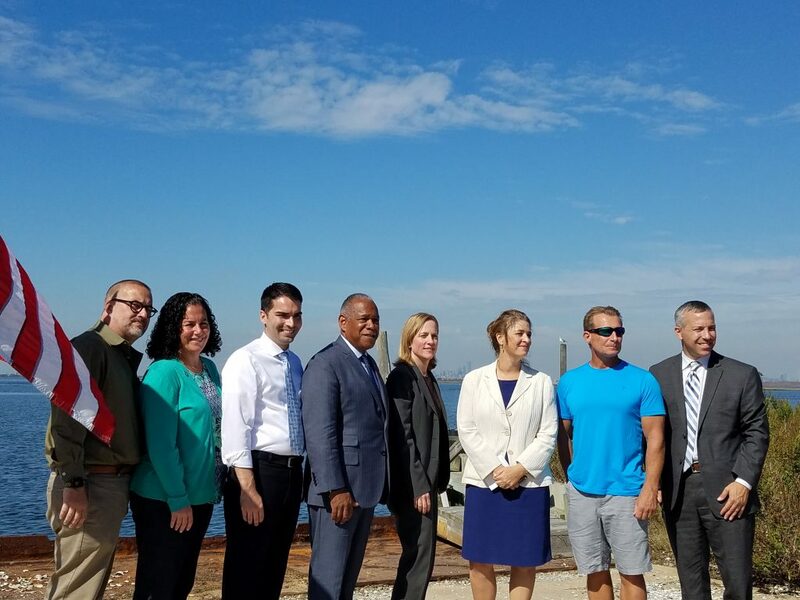 “When completed this will result in 16 new artificial reef sections spread around the designated reef area which will be a tremendous enhancement to this amazing marine habitat and a new wetlands created in Jamaica Bay which will help to sequester and offset carbon while playing host to a large and varied number of bird and marine species. SUNSET COVE PROJECT MOVES FORWARD ! 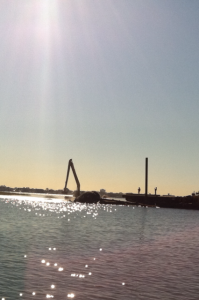 ARTIFICIAL REEF CONSTRUCTION COMPLETED ON ROCKAWAY REEF !!! 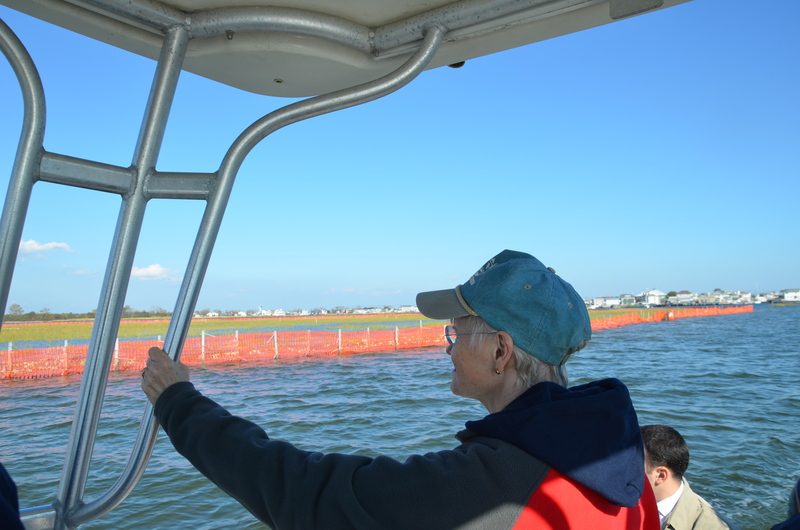 The Jamaica Bay Ecowatchers led the effort to have Two critical environmental projects funded thru required offset mitigation from the Transco Williams Rockaway Pipeline Project. We lobbied hard to ensure that this pipeline project would see an environmental “give back” in the form of a $500,000 wetlands restoration project in Jamaica Bay (at the Sunset Cove location) and a 1.6 Million dollar Reef Replenishment Project that will see 16 new mini reefs created in the Designated Reef Zone two miles off of the Rockaway coast. The existing Reef is a remarkable ecological resource but has seen no new material placed there in over 25 years. This addition, and the wetland project , will be a huge boost to the local marine waters and shoreline habitat. We could not have accomplished this without the involvement and advocacy of Assemblyman Goldfeder and Senator Schumer. In addition the NYS DEC is to be commended for their great efforts in fast tracking this permit process that spanned the state and federal levels. Finally it is encouraging to see the Trancso Williams corporation live up to their goal of being environmentally conscious and involved and agreeing to see an environmental benefit funded thru their project. * First presentation up was RULERS BAR AND BLACKWALL ISLAND RESTORATION PROJECT UPDATE-BY Elizabeth Manclarke of the American Littoral Society. Elizabeth Updated everyone on the efforts made in the last year in planting the islands with Spartina Altenflora– see her full presentation here. FISH AND WILDLIFE was the final topic of the night and the first presentation was by Dan Mundy on current trends of fin fish populations in Jamaica Bay based on surveys of local fisherman. This presentation can be seen in the original one posted or here towards the end. 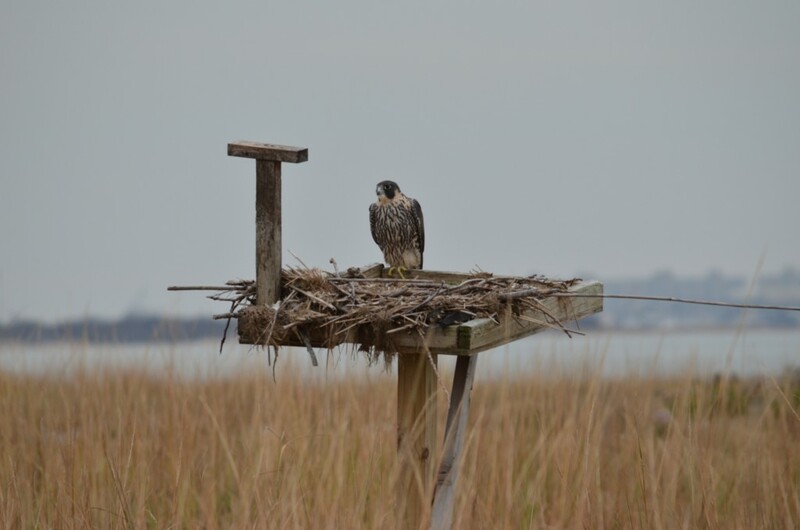 RECORD NUMBER OF NESTING OSPREY IN JAMAICA BAY!! 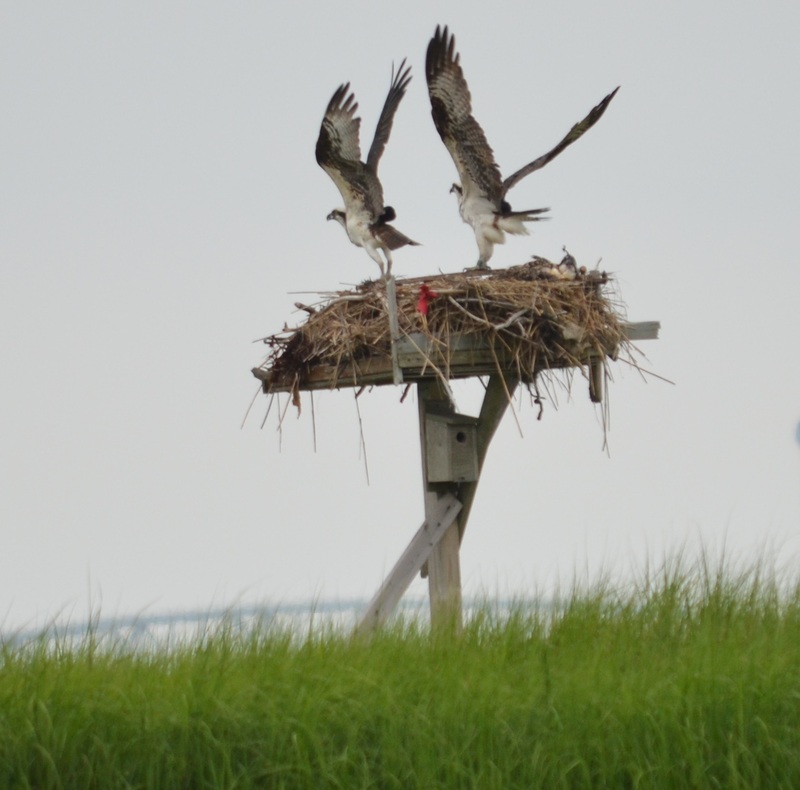 This year the number of pairs of Osprey nesting in Jamaica Bay has hit a new record high. The Littoral Society has just conducted their 2015 survey and has concluded that this year their are 26 pairs of nesting osprey with chicks in Jamaica Bay ! This is great news and speaks to the health of the bay! Senator Schumer calls for funding for Gateway and to fix the West Pond. 3) NYC DEP presentation ,by Keith Mahoney, discussed the large nitrogen reductions that the bay is now experiencing as a result of the Nitrogen Agreement which mandated upgrades to the four waste treatment plants that discharge into Jamaica bay. 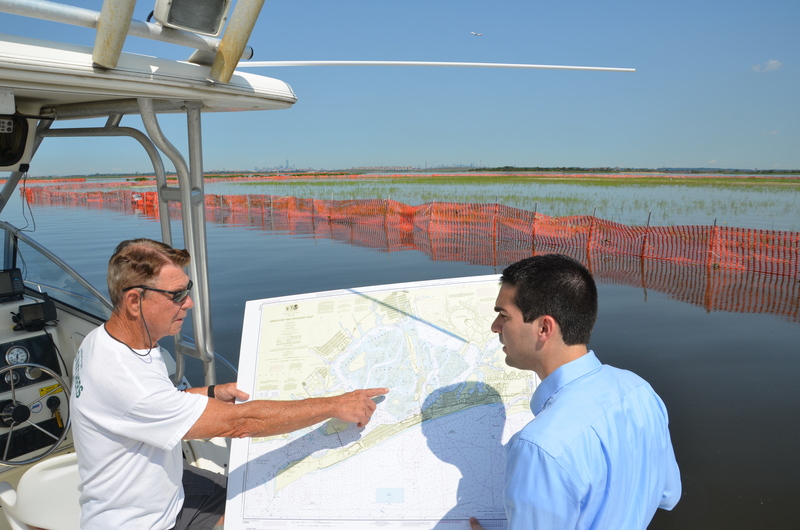 Great progress that is already making an impact on the water quality of the bay. GREAT VIDEO ON THE IMPACT TO JAMAICA BAY FROM HURRICANE SANDY IN TERMS OF MARINE DEBRIS AND DERELICT VESSELS. SINCE THIS MOVIE WAS PRODUCED THE ECOWATCHERS HAVE WORKED WITH THE NATIONAL PARKS SERVICE AND THE LITTORAL SOCIETY TO SEEK A SOLUTION. LAST FALL THE ARMY CORPS OF ENGINEERS AGREED TO ASSIST AND GREAT PROGRESS HAS BEEN MADE WITH MORE REMOVALS TO COME THIS SPRING. 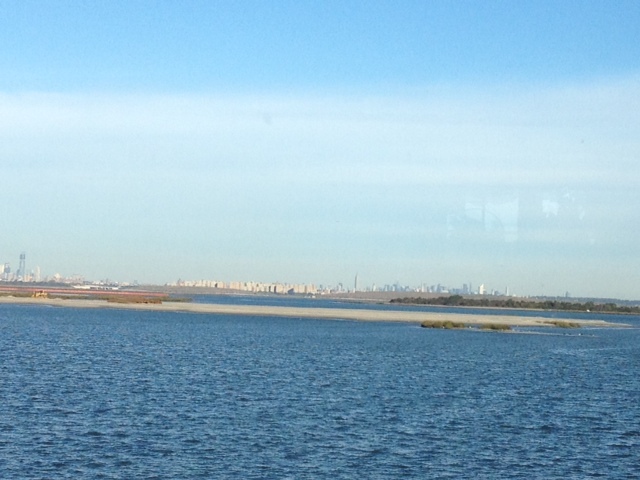 and coastal ecosystems in the NYC region, and beyond. As Co Chair for the stakeholder board we are extremely pleased with the choice of Adam Parris as the first Executive Director of the Science and Resilience Institute at Jamaica Bay. Adam is extremely qualified and we look forward to working with him to ensure that all aspects of work by the new Science Center are done in coordination with the very active stakeholder members that have been working around the bay for over 20 years ! The Science and Resilience institute is becoming closer to a reality as the consortium of Academic Institutions has chosen its first director and will announce the winner within the next two weeks. The Ecowatchers will be serving on the institute board as co chair in the capacity of Stakeholder Representative. On Friday December 12th a seminar was held at Brooklyn College and there were a number of presentations to address what will be the formative document that begins the process of laying out some of the history and impacts to Jamaica Bay as well as possible goals that the institution will adopt. The Ecowatchers presented ( presentation can be seen here.) a brief overview of our background and work in the bay, a response to questions posed from the board regarding the initial guiding document they are working on as well as a recommendation as to where the new institution should focus in the bay. Our view is that the new science center should seek to avoid the urge to merely produce reports but to seek to get directly involved with some of the ongoing, as well as planned, ecological projects planned for the bay and to produce studies and reports that revolve around these projects. This would truly help to make the bay and all those who live around it more resilient going forward in the threat of sea level rise and global climate change. We have coined a phrase that we feel should be a guiding principle of the Science and Resilience Center and that is –“Resilience through restoration “. We will seek to report back directly to the stakeholders of this bay thru the medium of the Jamaica Bay Task Force meetings to ensure that ALL of those who have been working for decades in the bay will continue to have their voice heard in any decisions of significance that affect the bay. 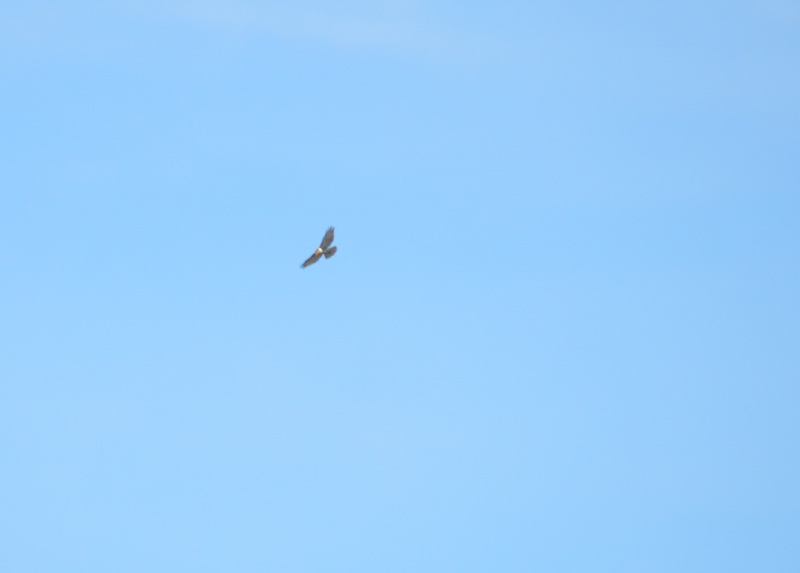 Unusual number of Peregrine Falcons out and about on Jamaica Bay Today !! 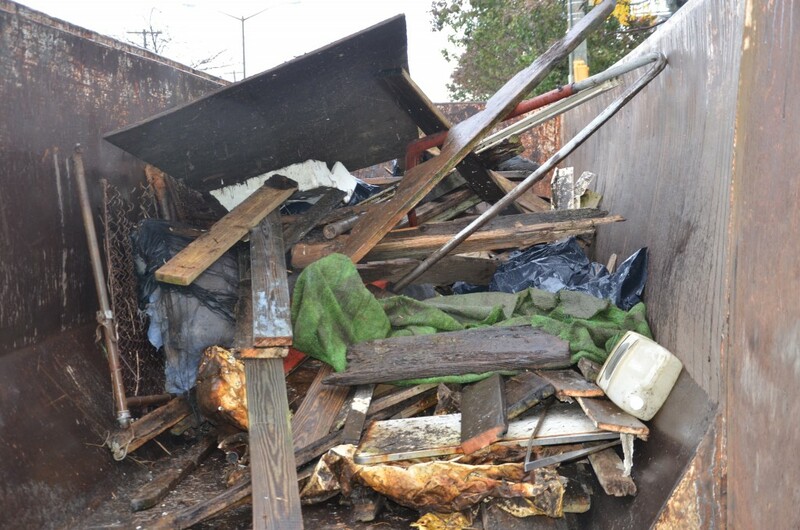 Ecowatchers organize Hurricane Debris Cleanup–Team up with NYC Build it Back, Amerian Littoral Society and NYC Parks and Recreation.!! 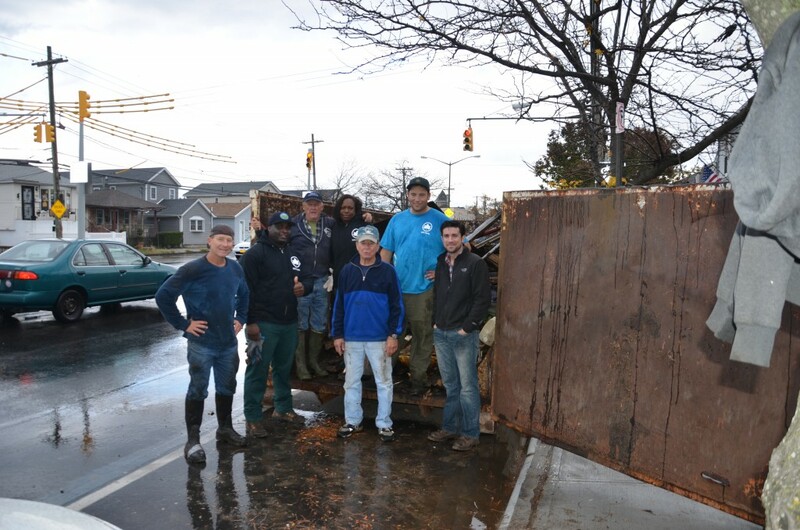 The Ecowatchers teamed up with NYC Build it Back , the American Littoral Society and the NYC parks and Recreation to clean up storm debris that has been damaging the wetland shores of Broad Channel since Hurricane Sandy. 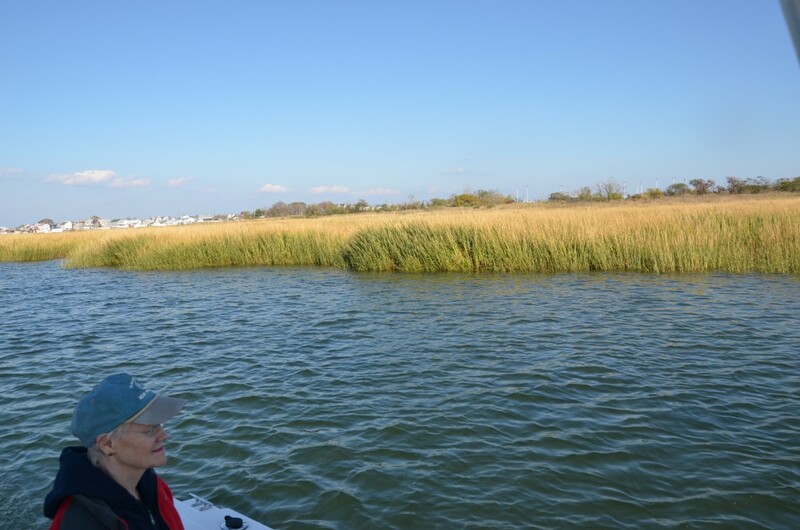 DEP COMMISSIONER EMILY LLOYD TOURS JAMAICA BAY ! 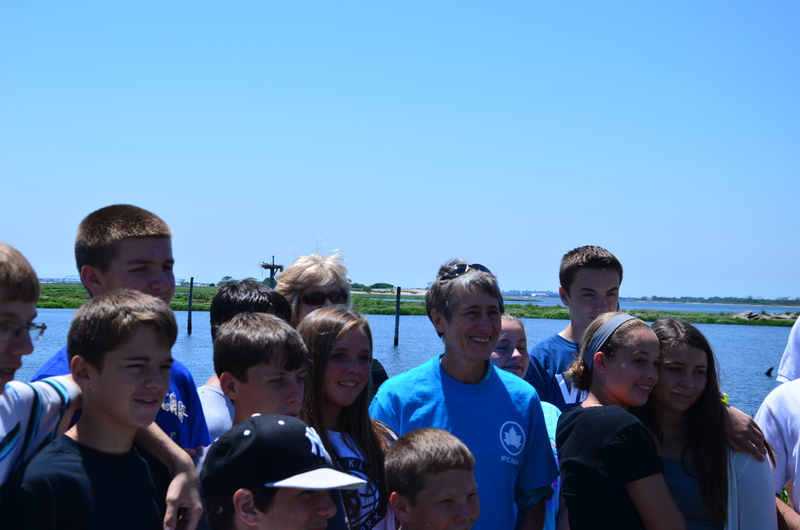 Commissioner Lloyd took time out of her busy schedule to tour Jamaica Bay today with the Ecowatchers. The recently created wetland islands of Rulers Bar and Black wall island were on the list of places to see along with Sunset Cove. All of these projects involved DEP funding and logistical assistance. Great to see Commissioner Lloyd has set Jamaica Bay as a high priority for this administration!! Jamaica Bay Task Force Summary !! Great Meeting of the Jamaica Bay Task Force last night !! West Pond Update by NPS Superintendent Jen Neresian- The superintendent reported that the planning process is on track to meet the timeline previously created which will see an additional meeting held in mid November and then a finalized plan to be declared by late Winter. Jen reported that they have had a very successful scoping process and have heard loud and clear that the loop trail is critical to the experience that visitors seek when visiting this part of the park and that it will have a high priority in the final plan. 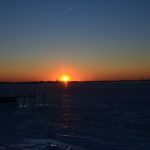 Jamaica Bay Science and Resiliency Center Update–By Peter Ventura Update on the progress to date on the science center and on recent efforts to select a permanent director. Peter discussed the efforts to date , thru the many public meetings, to establish a proper outreach to the many neighborhoods that surround the bay and the progress the various participating universities have made in drawing up the framework agreement for this center. His full presentation can be viewed here. There will be a brief Q & A after each session. NYC Councilman Ulrich tours Jamaica Bay and surveys the recently created wetlands as well as the remnants of Hurricane Sandy in the form of Marine Debris that is still located throughout the bay!! 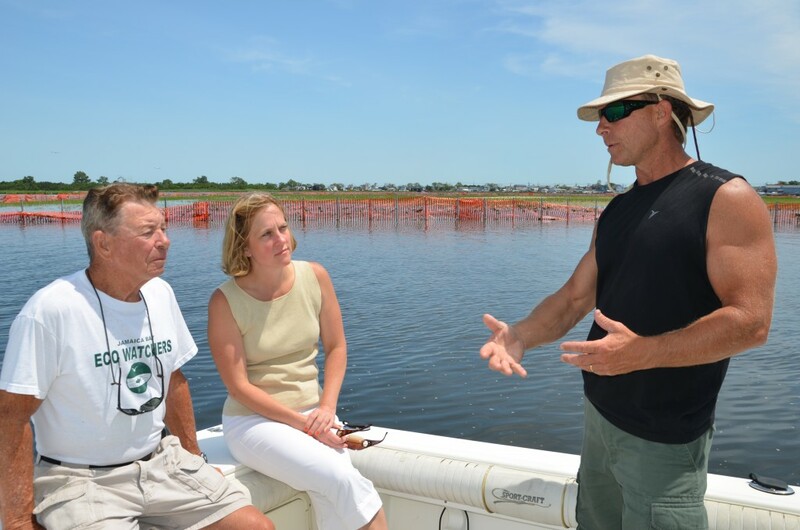 It was great to see the Queens Borough President Melinda Katz taking time out of her busy schedule to tour the wetlands and islands of Jamaica Bay. Since taking office she has shown a keen interest in helping to preserve and protect Jamaica Bay. The Jamaica Bay Ecowatchers ferried the Borough President to recently restored wetland islands in the bay and gave her an update on the numerous projects underway in the bay. see addtional photos from the day HERE. Sunset Cove to receive funding thru Department of Interior Resiliency Grants!! 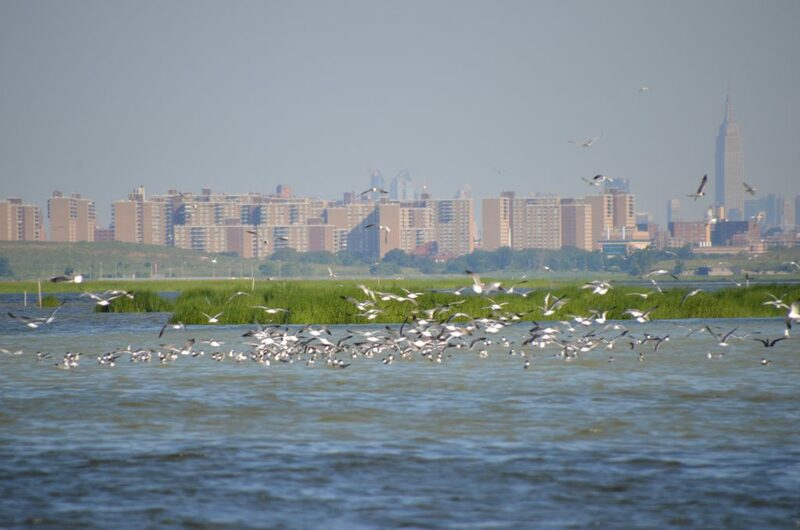 Big news for Jamaica Bay today as Secretary of the interior Sally Jewel flew into NYC to announce 102 million dollars for 13 projects in 11 northeast states to fund projects to make shorelines more resilient in the face of climate change. The largest funded project was the Sunset cove wetlands restoration project which will receive $4,085,000 to restore the shoreline of the southern portion of Broad Channel island. The project will see the creation of wetlands along the shoreline, a rock and oyster revetment barrier , a dune berm with a walking trail and an upland forest. BLACKWALL ISLAND WETLAND PLANTING PROJECT !! 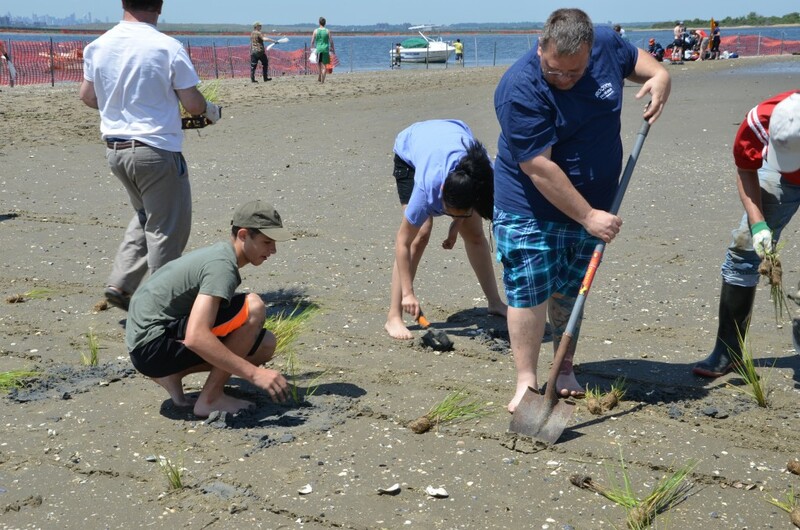 Assemblyman Phil Goldfeder had his whole office out planting on the new wetland island in Jamaica Bay ! The Jamaica Bay Ecowatchers and the American Littoral Society teamed up for another great day of restoration work in Jamaica Bay. Over 70 volunteers were ferried out to the recently created Blackwall Island to plant over 5000 plants in a single day !! This island is the second island to be restored thru the local groups coordinated volunteer approach !! You can see more photos of the day Here . Great day with the Sony Environmental Team out in Jamaica Bay Today !! The Group from Sony came out to help with the planting of Spartina Plants on Rulers Bar Island. The island was restored last year and today was an effort at replanting select areas that saw sand dunes pile up over the winter and bury some of the wetland plants. It was a great day and the team from Sony planted over 5000 plants on the island! This will be a huge help in stabilizing the shoreline edge of this critical wetlands island. 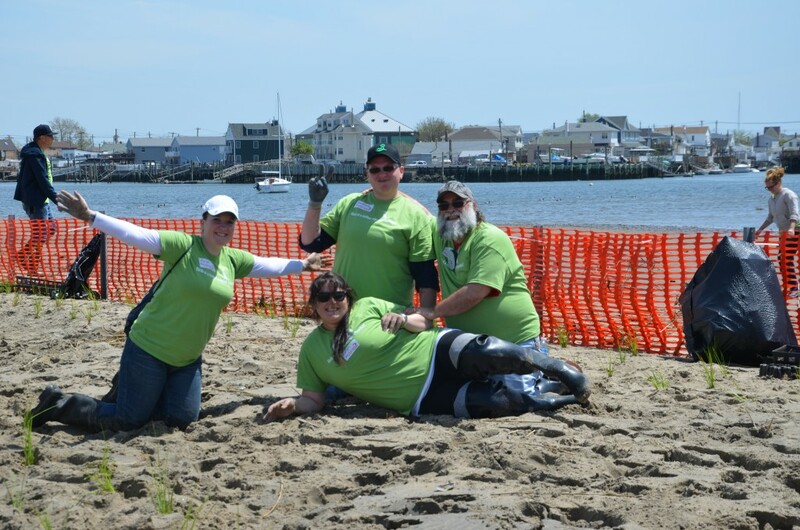 Tremendous enthusiasm and effort was on display and the Jamaica Bay Ecowatchers and the Littoral Society extend our deep thanks to this group for all of their efforts they put forth. There is a large PHOTO LINK HERE to the days work. 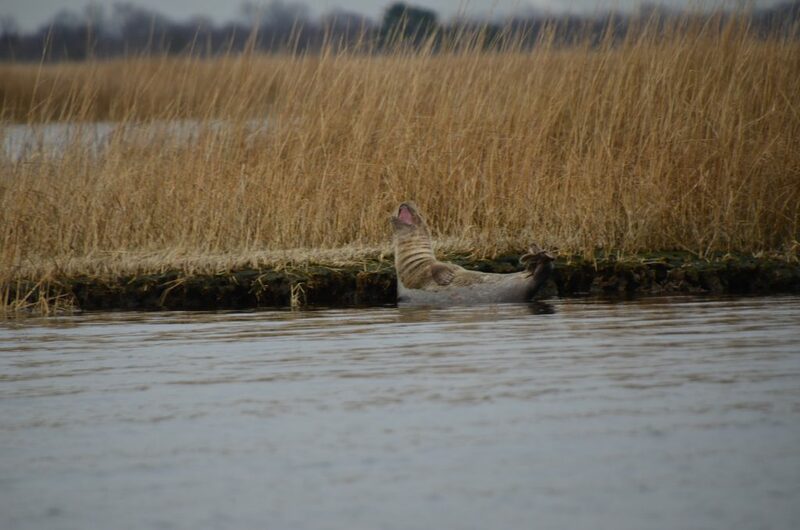 Local Theory on Salt Marsh is Finally Accepted !! 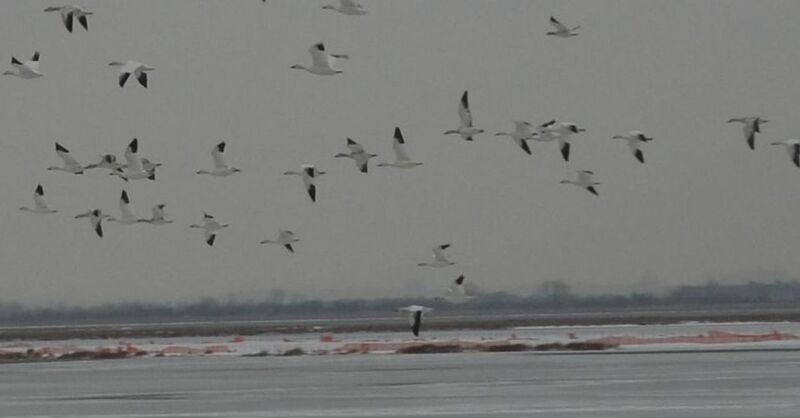 For years ( since 2000 ) the Jamaica Bay Ecowatchers have submitted that the primary cause of the salt water marsh loss in Jamaica Bay was the tremendous increase in nitrogen loading ( from 18,000 pounds a day to 50,000 pounds a day ) that occurred when the previous practice of ocean dumping of the waste treatment sludge was halted and the city of New York began processing the sludge at waste treatment plants where the discharge from the process was piped into the bay and was extremely high in nitrogen. Agencies and Scientists alike disagreed with this theory and spoke of impacts such as jet ski waves and dredging as possible main causes. The science has been coming in and it has been slowly changing their minds and now we have ( see the attached article here) an agreement at the state DEC level that we have been correct and this correlation of nitgoen spiking and marsh loss is not a coincidence. Once again proving the invaluable impact that local environmentalists play in these discussions. 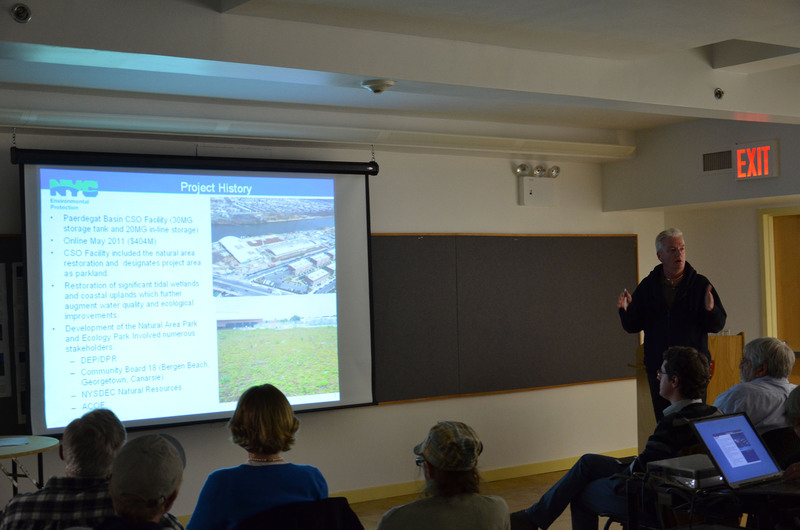 2) NYCDEP Paerdegat Basin Natural Area Park update–John Mclaughlin-gave an interesting presentation on the restoration project that has been years in the works and only recently completed at Paerdegat Basin. The area has both a masssive CSO holding tank that can hold up to 50 million gallons of rain water as well as a large restoration park that surrounds it. The tanks hold rainwater that in the past would have caused sewage spills into Jamaica Bay and now allow it be held until after the rain event and then processed and treated. The area is now used for those who would like to enjoy the walking trails along the restored shore or thru the recently created maritime forest as well as those who now can enjoy kayaking the waters of the creek. Overall an excellent project and one that is already producing a positive impact on the waters of Jamaica Bay. See Dave Avrins full powerpoint presentation HERE. Great turnout for the Earth day Cleanup in Broad Channel On April 26th !! 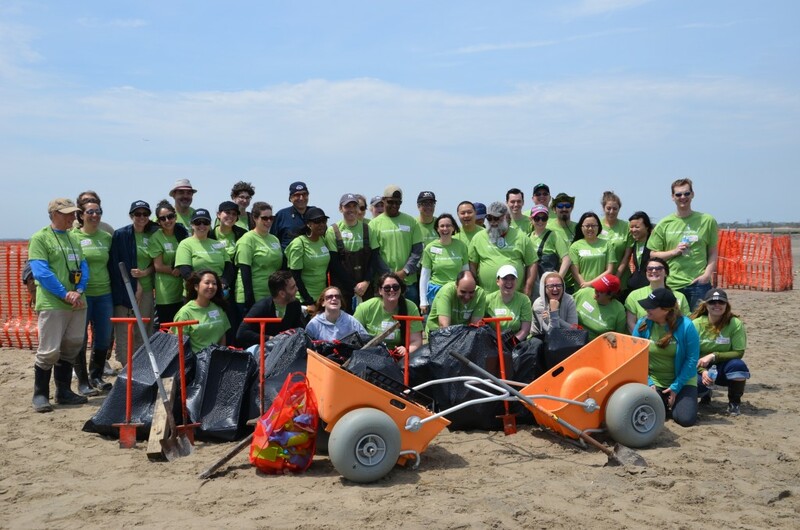 The event saw the Jamaica Bay Ecowatchers, the American Littoral Society, Broad Channel Civic Association, the NYC Parks Dept and the National Parks Service- team up to clean the shoreline at the southern end of Broad Channel Island. This area is immediately adjacent to a large wetland area as well as the Sunset Cove area which is designated to be a future restoration site. The Turnout was great including the boy scouts, (282) and a west point cadet team along with local families and their children. The shoreline was cleaned up and even large debris was removed and the area looks Great!! 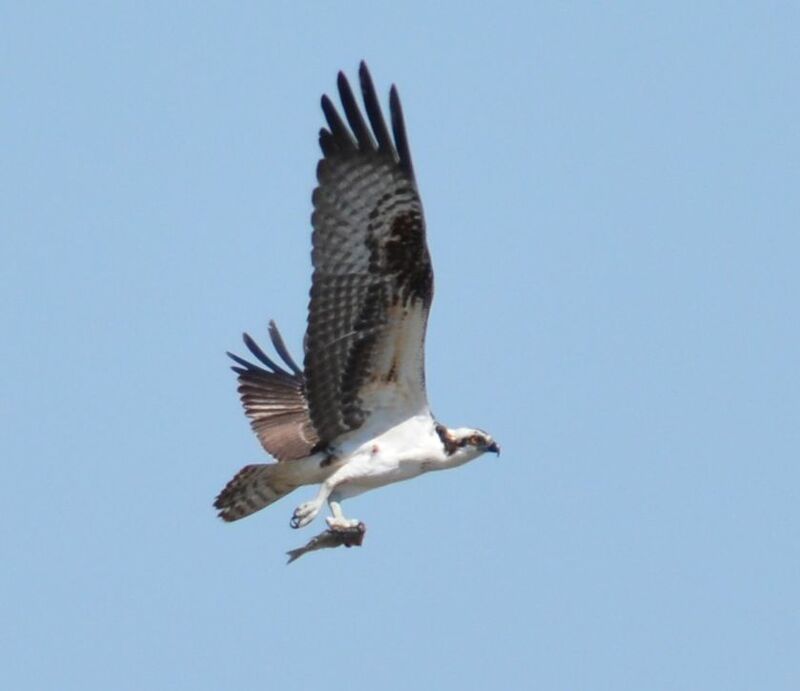 Jamaica Bay Osprey Returns !! HURRICANE SANDY MARINE DEBRIS THREATENS JAMAICA BAY WETLANDS!! Disturbing presentation on the impact of Hurricane Sandy Storm Debris on the shoreline, islands and wetlands of Jamaica Bay !!! Perhaps most disturbing is the fact that no effort to address this critical issue has been made to date !! 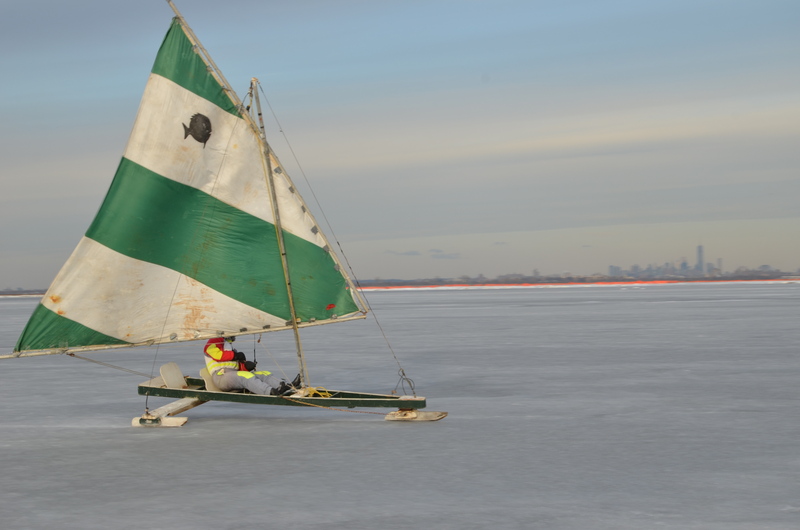 Members of Jamaica Bay Ecowatchers hike across a frozen Jamaica Bay to the recently created and planted Rulers Bar Island !! The Ecowatchers have been working with the Senators office to seek to obtain funding for the Sunset Cove project and we are grateful that he is pushing the Federal Government to provide those funds!! 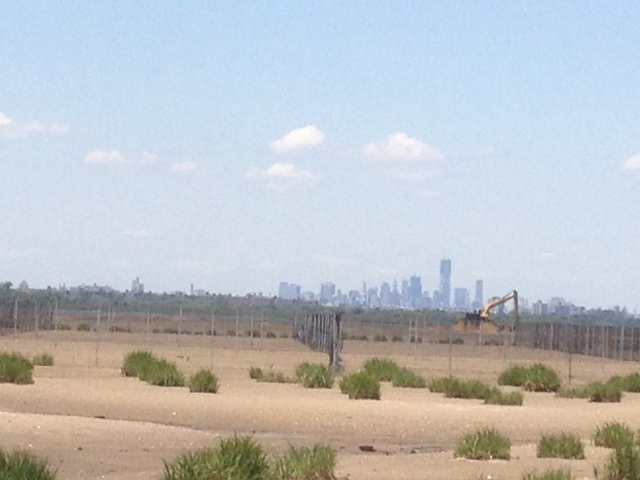 Assemblyman Goldfeder passes bill in Assembly to protect Jamaica Bay !!!!! 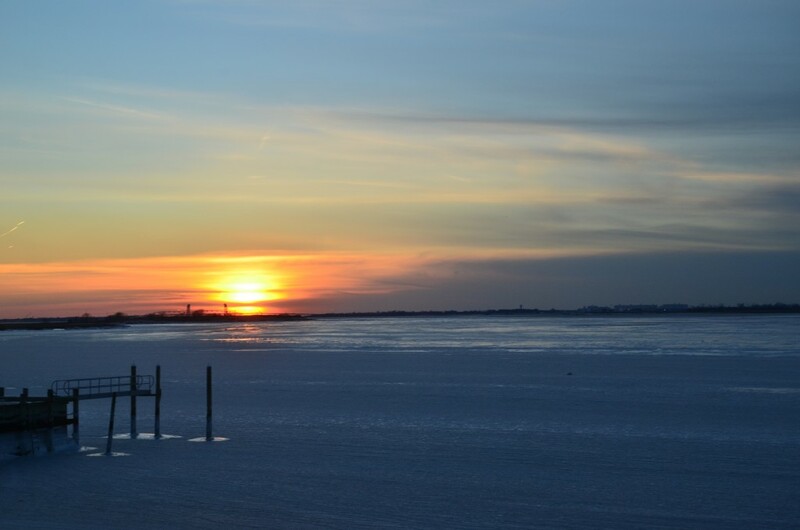 Record breaking temperatures have frozen Jamaica bay see more photos HERE of the frozen bay. 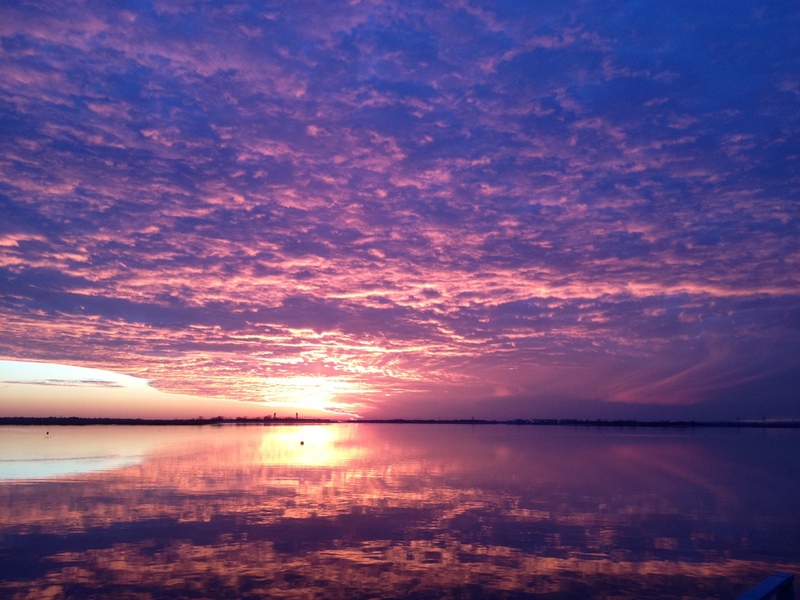 The Christmas 2013 sunset on Jamaica Bay is just another example of the unique beauty of this Bay!! ECOWATCHER’S ACT QUICKLY TO CONFRONT PORT AUTHORITY POLICY ON SHOOTING SNOWY OWLS!! 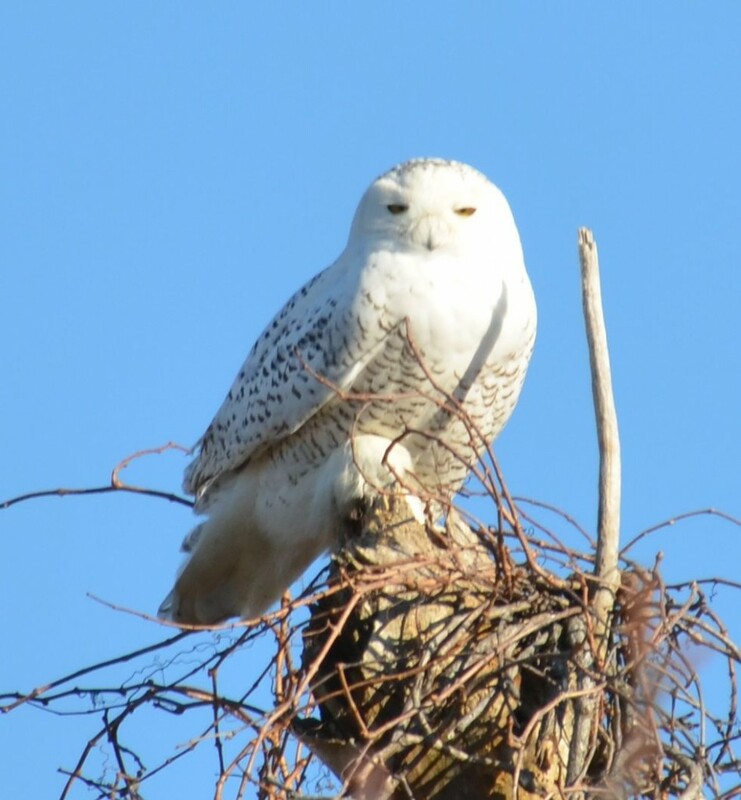 On December 10th the NY/NJ Port Authority announced a new protocol for bird abatement at Kennedy airport in which they would shoot snowy owls found on airport grounds . 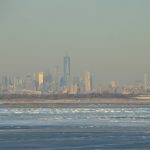 On December 11th the Ecowatchers met with 25 members of the FAA and Port Authority on the separate topic of air traffic noise and flight patterns over Jamaica Bay in a meeting set up by Assemblyman Goldfeder. 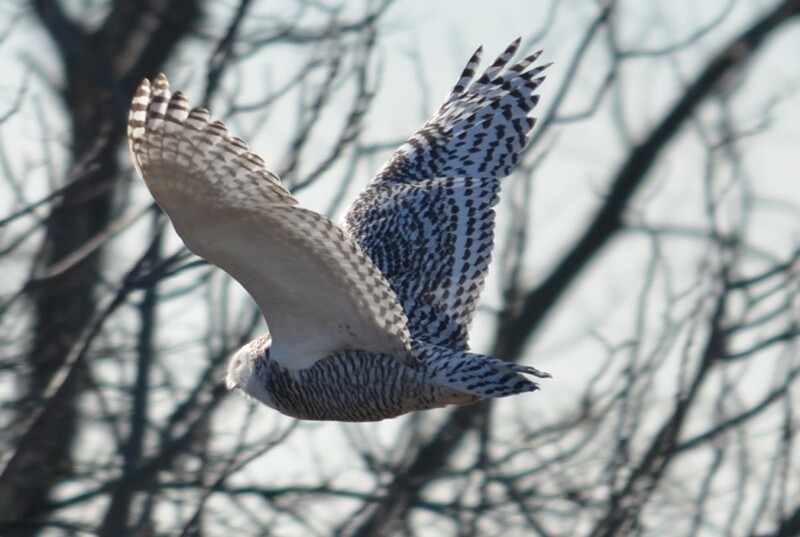 The Port Authority was confronted at the conclusion of that meeting with questions on this new policy regarding the Killing of snowy owls! They were challenged to emulate Bostons Logan airport where a catch and release policy was used. Immediately after the meeting a social media and online campaign was begun with our many allies to have this policy rescinded. We are pleased to announce that within 24 hours the port authority agreed to end this policy of killing the owls and institute one of catch and release. 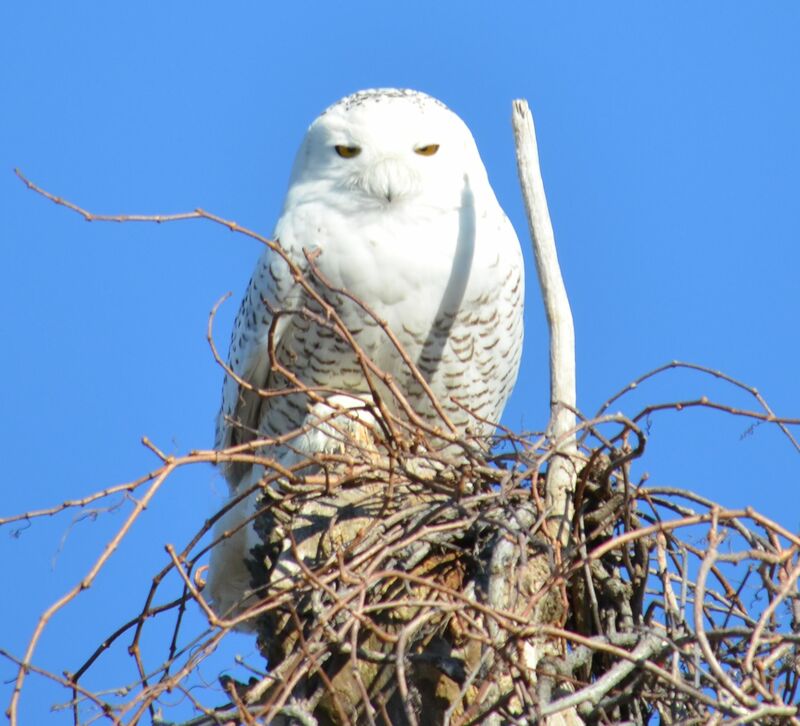 A big win for environmentalists and the beautiful snowy owls!! Ecowatchers presented award at Littoral Society Dinner!! It was a great night and a big thanks to Don Riepe, Elizabeth Manclarke and the crew at ALS for hosting a fantastic event!! 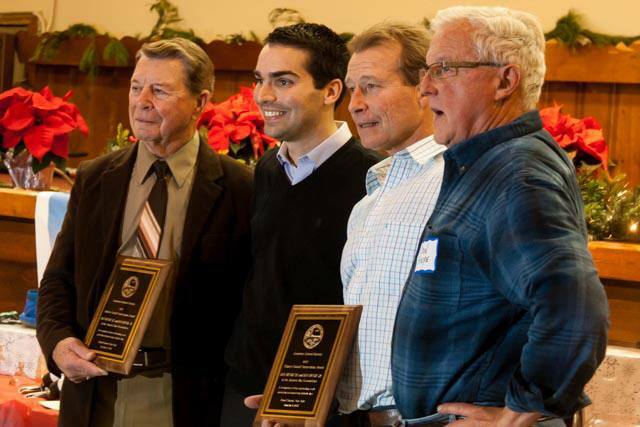 The American Littoral Society held their annual holiday fundraiser on Sunday, December 8th, in which Dan Mundy Sr. and Dan Mundy Jr. of the Jamaica Bay Ecowatchers were honored with the first-ever Citizen’s Coastal Conservation Award in recognition of their outstanding work preserving and protecting Jamaica Bay. Assemblyman, Phil Goldfeder presented the award and Councilman Eric Ulrich addressed the crowd of more than 140 guests at the American Legion Hall in Broad Channel. Among some of the guests were friends and supporters of the Ecowatchers and the American Littoral Society’s Northeast Chapter and Venetia Lannon, Regional Director of NYS DEC, Lilo Stainton of the NY/NJ Harbor Coalition, Nancy Barthold from the NYC Dept. 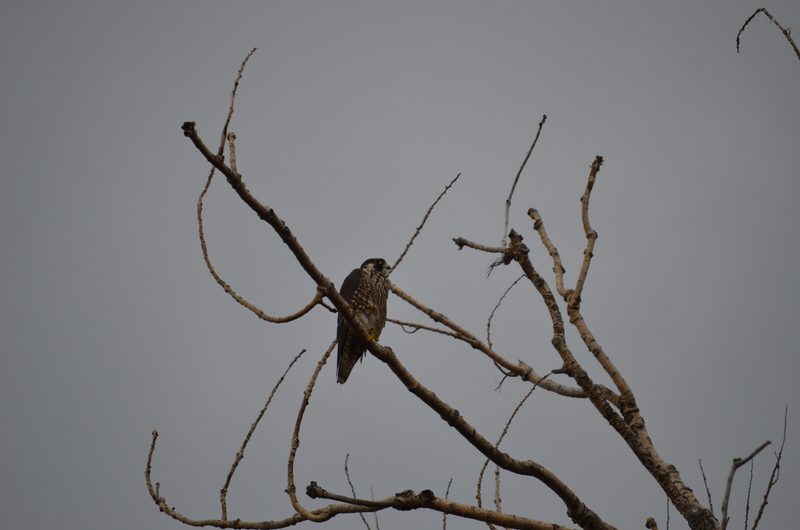 of Parks and Recreation¦ and members of NYC Audubon, National Park Service, Nature Conservancy and CUNY. The evening was a celebration of a long year rebuilding as a community post-Sandy and that was best illustrated by filmmaker Dan Hendrick, who showed a sneak preview of his upcoming documentary film “Jamaica Bay Lives.” The preview featured pre and post-Sandy interviews with Dan Mundy Sr., Dan Mundy Jr. and Don Riepe, Chapter Director of ALS’ Northeast Chapter. 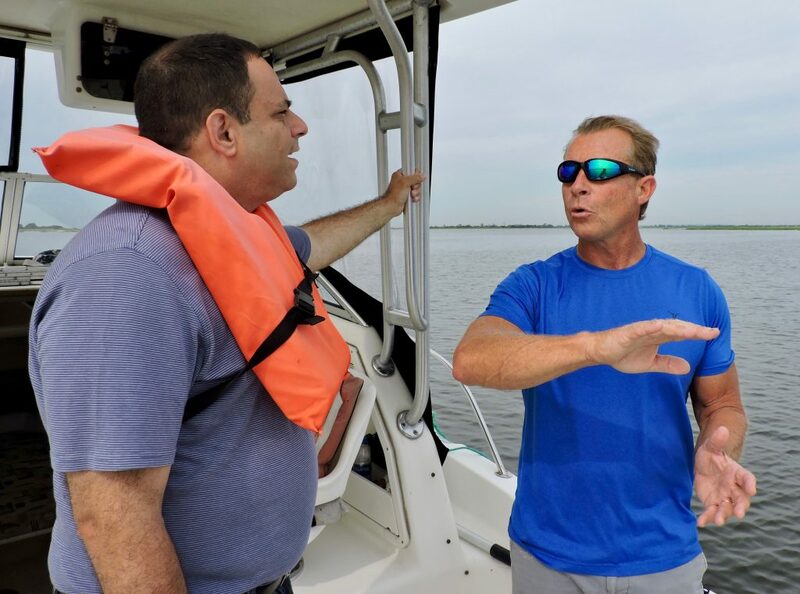 Broad Channel boat captains, local youth from ALS’ Restoration Corps program and community members were also honored for volunteering their boats and labor as part of the Marsh Restoration Initiative, the first-ever community led restoration effort in a National Park. The Marsh Restoration Initiative is co-led by the Ecowatchers and ALS and resulted in the restoration of two badly degraded salt marsh islands in Jamaica Bay,Rulers Bar and Blackwall, which will continue to be maintained and monitored over the next several years. 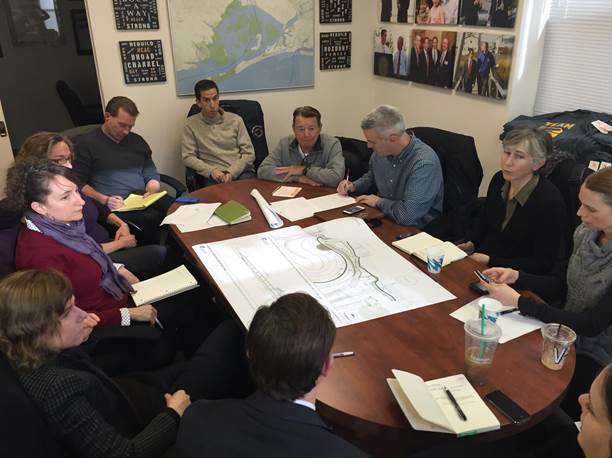 Update on Last nights Jamaica Bay Task Force Meeting! 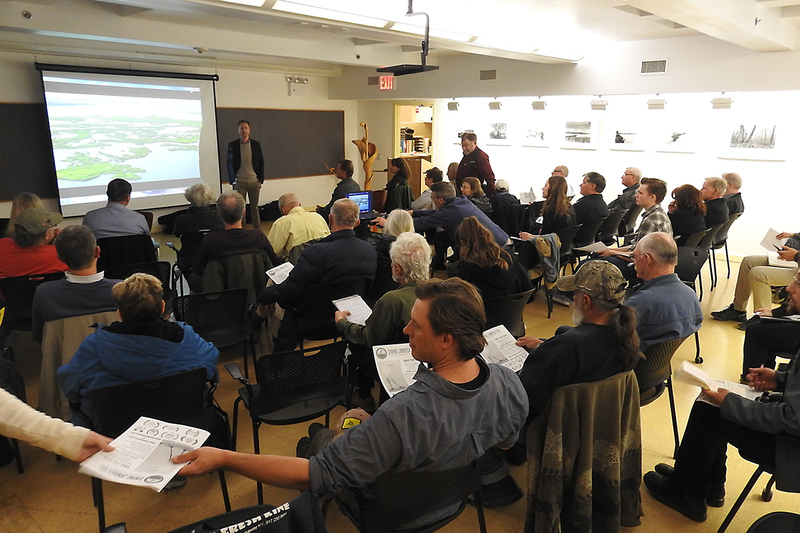 Tonight’s Jamaica Bay Task Force meeting saw a packed room of environmentalists and bay enthusiasts gather at the wildlife refuge to hear a number of interesting presentations and discussions highlighting the intense focus that now surrounds Jamaica Bay. The Resounding theme was that there is a lot of positive funding and plans coming down the pike for Jamaica Bay and that it is good news but that it is CRITICAL that the local groups be kept in the loop as the history in this bay has been that the identification of problems , the advocacy to fix them, and the best concepts to address them have often come from the local groups that are out and about on the bay everyday. The case was made by attendees that the issue was critical and the pace to date was to slow and that there was concern that the time table could jeopardize the projects funding. Dave indicated that the park was committed to addressing this and would work to ensure that once an acceptable action was decided on that it would be implemented. Dave then touched on the Marine Debris issue. 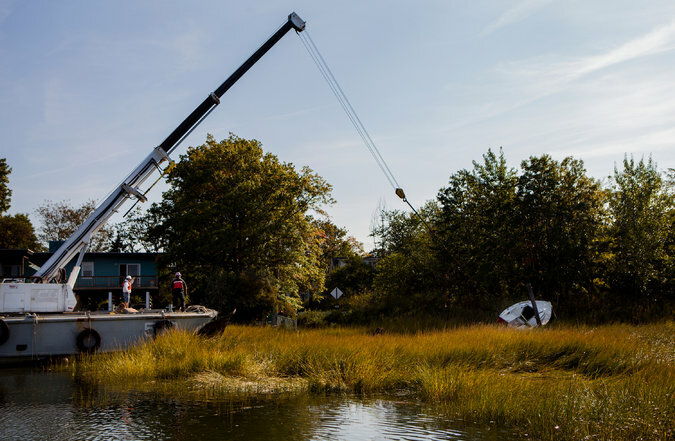 Since Sandy hundreds of destroyed boats , floats and marine debris has been deposited on the shoreline and islands of Jamaica Bay. The Littoral Society has spent many hours documenting this and has procured a grant in order to fund the removal of this debris but obtaining a permit from the NPS has taken so long that it has threatened to eliminate this possibility as the grant has time constraints. It was pointed out to Dave that hundreds of boats were removed in the past thru the volunteer efforts of the Ecowatchers and the Littoral Society but at this time the lack of a permit from NPS has put this program on hold. Dave indicated that the NPS was holding internal discussions at this time and were hoping to move soon on this issue. New NPS Superintendent—Jen Neresian the new Superintendent of Gateway introduced herself to the crowd and gave a brief history of her service in the NPS. She has worked in a number of the National Parks throughout the different geographical regions of the country. She recognizes that she is coming to Gateway at a very exciting time as the newly minted collaboration between the city of New York and the Department of the Interior has created a number of interesting developments including the new Science and Resiliency Center as well as the Conservancy. She readily grasped the often opined fact pointed out by local environmentalists that this park, entirely impacted by development and manmade activities, must be managed in a different way than those parks of a larger size and more remote location such as Yellowstone or Yosemite. It was encouraging to hear her energy and outlook for the future of this park and we look forward to working with her on the number of upcoming restoration projects that we are looking at. Note the last slide on the presentation has email contacts for those who would like to submit comments! The Jamaica Bay Symposium held over a two day period, October 18 and 18, at Kingsborough Community College was a fantastic success and presented a number of presentations over the two days that addressed Jamaica Bay issues as well as Global concerns in the age of sea level rise and global warming. 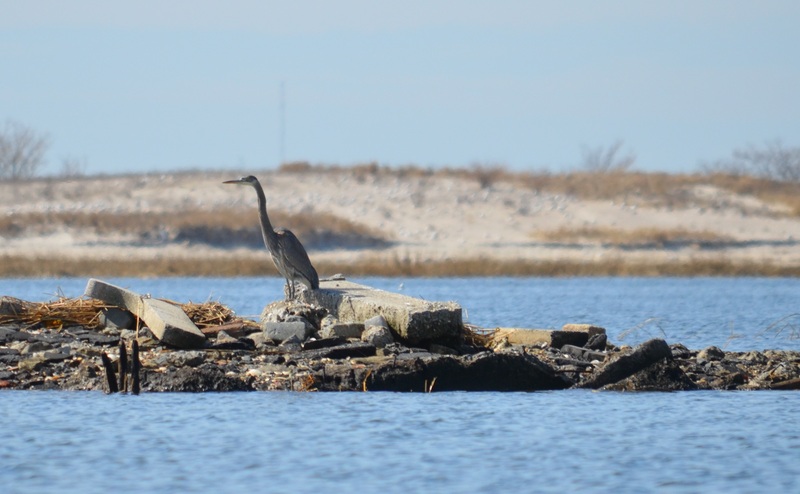 The Jamaica Bay Ecowatchers and the Littoral Society teamed up to give a presentation on their recent efforts to coordinate the reconstruction and planting of the two wetland islands of Rulers Bar And Blackwall island in Jamaica Bay. The full presentation can be seen here. In addition the entire two day series of presentations can be viewed here. The amount of interest in Jamaica Bay at this time is tremendous and it is great to see after so many years of struggle by the various environmental groups to have it recognized for the unparalleled urban ecological asset that it truly is !! 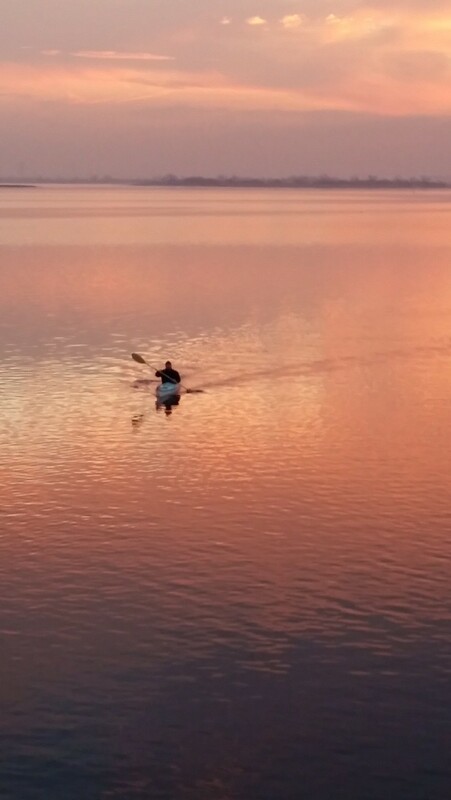 PBS NOVA Documentary —-aired last night and featured the Jamaica Bay Ecowatchers and their efforts to restore the wetlands of Jamaica Bay and the fact that in addition to the critical ecological role that they play in this Estuary ,these wetlands also play an important role in their ability to dissipate storm energy. 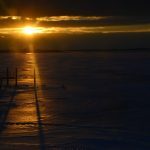 The one hour documentary discussed efforts around the world to combat rising sea levels and it devoted extensive time to Jamaica Bay with some great video of the bay and recent restoration projects. You can view the entire video here. Jamaica Bay Resieliency Center and Jamaica Bay/Rockaway Park Conservancy Creations Announced!!!! Today there were two big announcements at a press Conference Hosted By the National Parks Service and NYC Today. 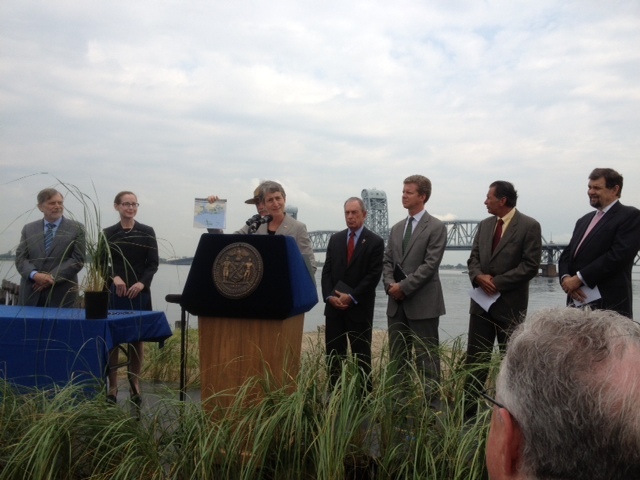 Mayor Bloomberg and Secretary of the Interior Sally Jewell announced the Creation of a world class science center –the Jamaica Bay Resiliency Center that will be focused on climate change and ecological issues affecting the bay . The Resiliency center will be located with in the Gateway Park Lands on Jamaica Bay most probably at Floydd Bennet Field and will for the first time collate all studies being conducted in the bay and look to create guidance for future projects needed within the bay. The Conservancy will be headed by Tom Secunda who will look to bring new opportunities for the park in terms of linking the adjacent city and state parks to Gateway and to identify corporate and philanthropic sponsors to help fund park upgrades. The Jamaica Bay Ecowatchers feel that both of these concepts can be very positive developments for the bay IF the very involved local stakeholders and environmental groups who have been active for so long in working to preserve the bay are included in planning for the parks future AND IF the primary focus remains protecting the natural beauty and ecology of the bays waters and lands. 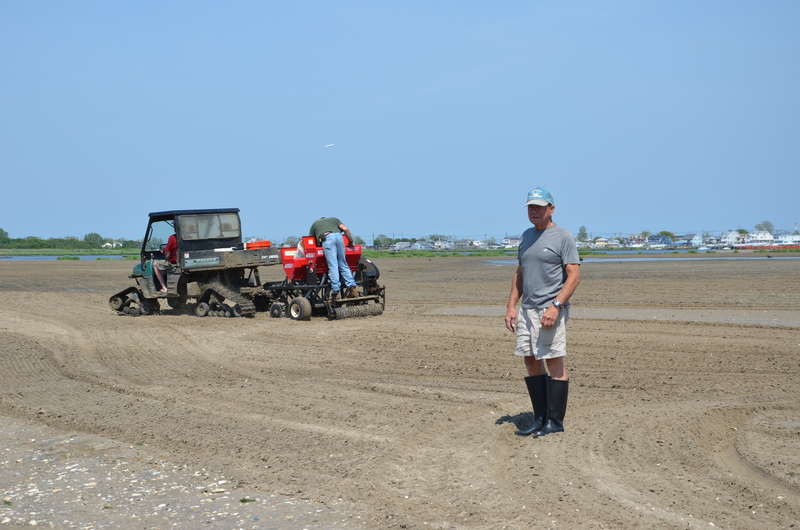 All 86,000 spartina plugs have been planted ! !–and already in the photos below you can see the great progress in bringing this wetland island back to its former presence. Click on the link below to see more photos from July 24th!! The Ecowatchers have long advocated the planting of plugs as the primary restoration method as it seems to be the most productive and the one most likely to guarantee success. It is early yet to determine but this island which was entirely planted with spartina plugs on two foot centers seems to be thriving. The growth rate is remarkable to date. Below is a photo and link to additional photos of Black wall island which is immediately adjacent to Rulers and where another method was employed which was seeding. So far the growth rate,as you will see, is notably less and yet we will know more within the next few months. The seeding method is cheaper but may not ultimately be as successful—-Time will tell!!!! 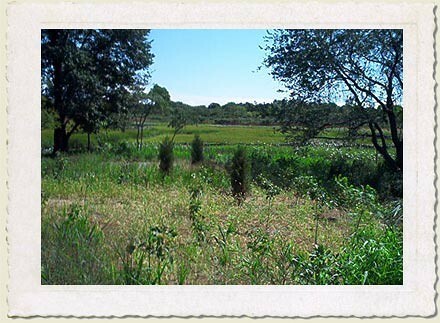 Wetlands Project Update–Seeding Black Wall Island!! 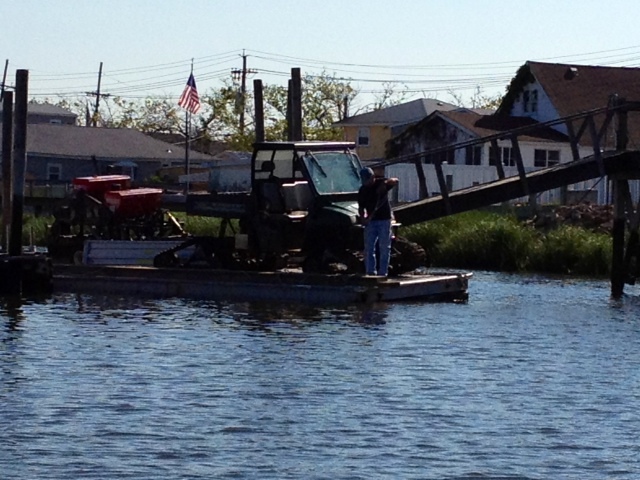 The Jamaica Bay Ecowatchers transported the heavy equipment needed for the seeding operation at Black wall island. Below is the equipment barely fitting onto the dock/ makeshift barge used for the process. Dan Mundy Standing in front of seeding process underway on Black wall island ! Restoring Rulers Bar Wetlands Island!! Great progress today in the effort to restore Rulers Bar Wetlands island with over 160 volunteers !! 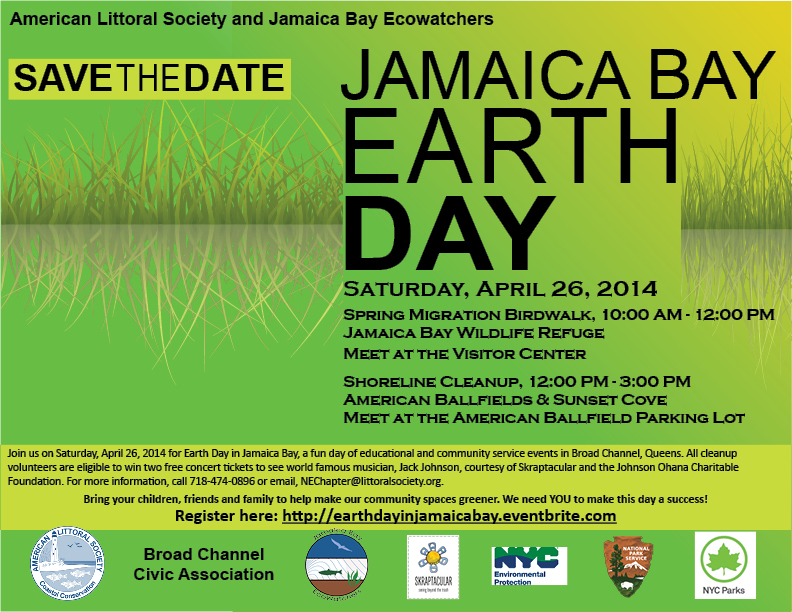 This is a coordinated effort between the Jamaica Bay Ecowatchers and the American Littoral Society. Thanks to the team of volunteers who came out and to the boat captains of the six vessels that ferried the large group out to the island. 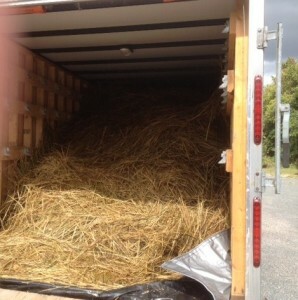 This was no small feat and took alot of coordination and hard work. No doubt it appears worth it as the hundred and sixty volunteers planted thousands of plugs before the rising tides forced us off the island !! A great day was had by all!! 1) Barbara Brown of the Eastern Queens Alliance presented a startling presentation of the Port Authority’s plans to expand the 4L/22 R runway and in the process cut down over 700 trees in the adjacent idlewild park. This is not a proposal to expand the runway into the bay, we have so far defeated that outrageous proposal last year, but it is a plan to widen and lengthen these runways. It is hard to comprehend that the Port Authority can continue to operate without any attempts to engage the envrionmental and neighborhood groups that are so active and visible. They continue to be the single biggest threat to the health of the this National Park !! 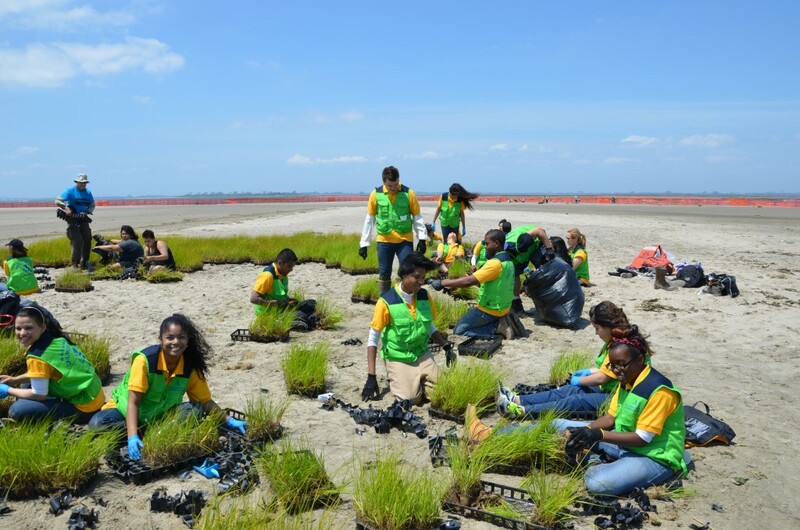 2) Rulers Black Wall restoration project has been a very big success to date in not only recreating these critical wetland island but in the huge numbers of young people who have participated in this community planting project! We are truly creating the next generation of environmentalists with this type of volunteer involvement! 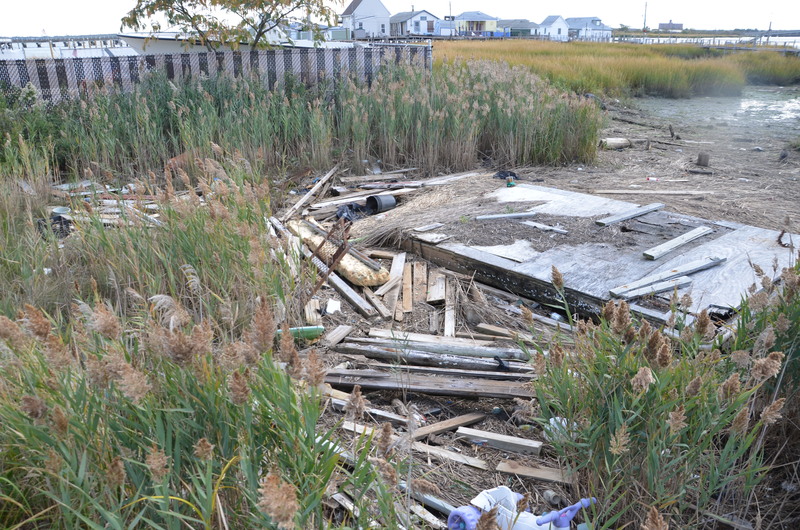 3) Elizabeth Manclark’s presentation on Hurricane Sandy Storm debris that is throughout the bay was a call to arms. 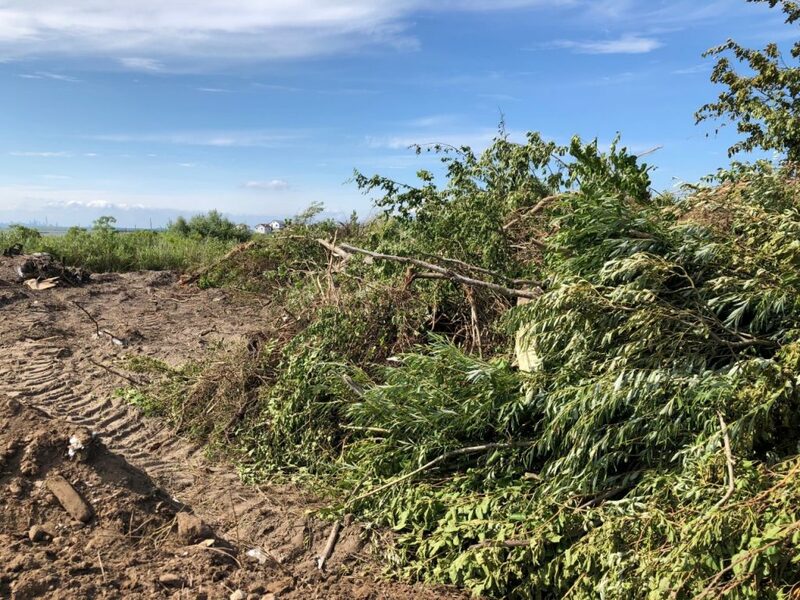 It is now over 7 months since the storm and we need a plan from the National Parks Service on how they plan on removing this debirs which is not only an eyesore but also an environmental threat. 5) Gateway update by Dave Avrin of the NPS- indicated that the Sandy appropriations bill has allocated funding which will help to not only repair the damage caused by Hurricane Sandy but to also create some huge new opportunities for the park. There were many who want to see these repairs and projects start soon and according to Dave the funding is mandated to be spent within three years. Hopefully that will preclude the “study it to death” concerns of many. PLANTING SPARTINA AT RULERS BAR BEGINS!!!! 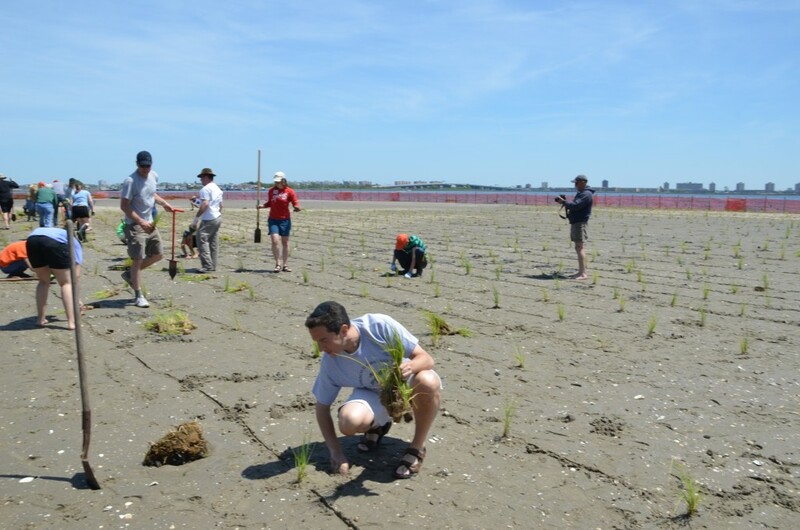 Today the Jamaica Bay Ecowatchers began planting the spartina plants on Rulers Bar Island which will grow into a productive wetlands marsh. The day was a huge success with a great group of volunteers who worked hard at planting the thousands of spartina plugs on the island which was created last year. We will continue with this effort this up comming weekend , May 25,and 26th. 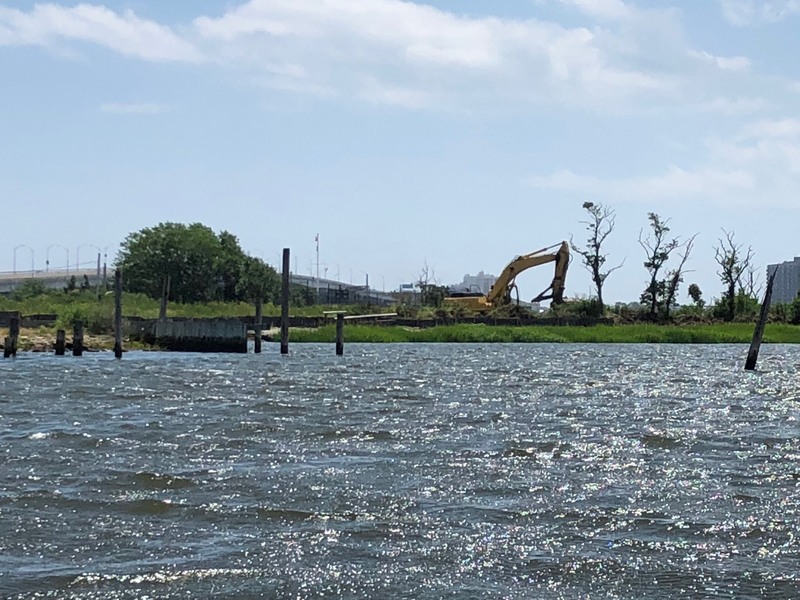 Working with our partners at the American Littoral Society we are working to restore the 12 acres that was formerly a wetlands island and which was lost over the years due to the high levels of nitrogen loading that the bay experienced. 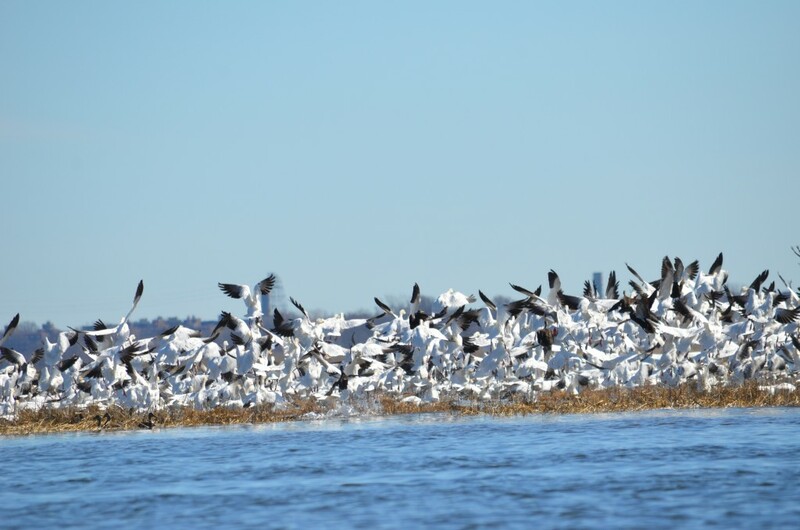 NYC is now greatly reducing that nitrogen loading and these restored wetland marsh islands will help to keep Jamaica Bay one of the most important estuaries on the east coast!! 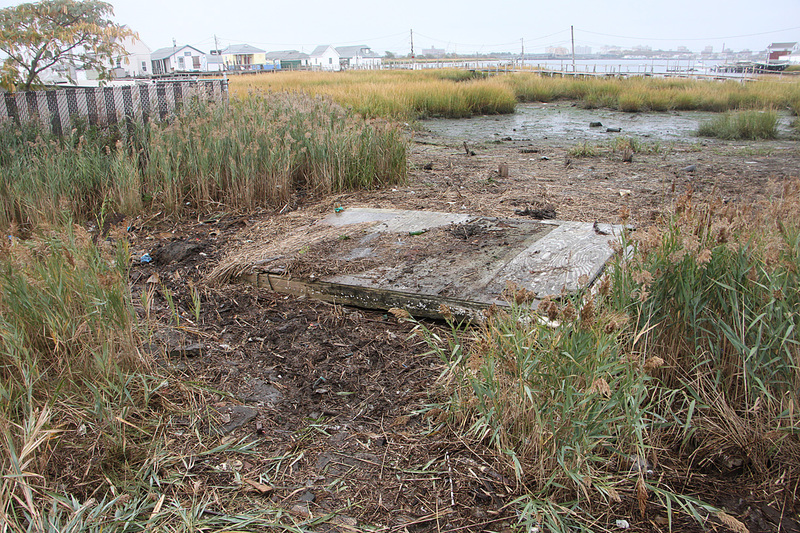 Governor Cuomo helps fund Wetlands Restoration in Jamaica Bay! 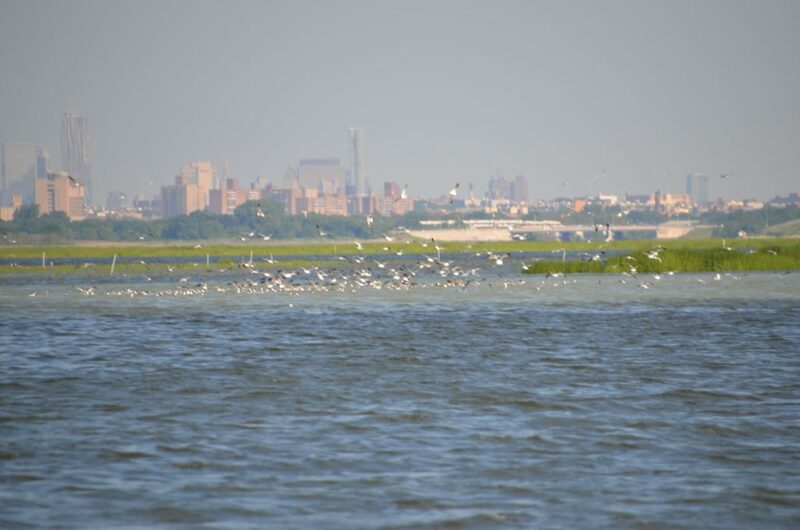 The governor released a press release today that highlighted the states financial support for Wetlands restoration in Jamaica Bay and cited the Jamaica Bay Ecowatchers as critical partners in this process. The following is a link to a recent profile story that ran on the Eco Ocean Website. We thank Mike Misner for his tireless efforts to protect our ocean resources as well as the very flattering coverage! Spring will be here soon and we are planning now for the next phase of the Rulers/ Black wall project and that is planting Spartina plugs on the recently created islands. Below is a link for those who would like to register to volunteer. Dates and times will be posted as we get into the spring but we are looking to create a database of volunteers we may be able to count on when we get ready to start. The planting is a great day out on the bay and enables you to have a great story to tell in years to come of how you played a direct role in in helping to save Jamaica Bay !! Volunteer HERE . A standing room only crowd gathered tonight to hear from a panel of agency heads as to their response to Hurricane Sandy and the impact the storm had to their agencies and particularly to Jamaica Bay. The meeting was a great forum for discussions and questions as to how the ecology and infrastructure of the park fared during and after the storm. The first speaker was NYC DEP Commissioner Carter Strickland and he spoke of the great challenge the DEP faced in keeping the waste water treatment plants running in the face of such a huge storm surge. The Commissioner stated that in a relatively short time the DEP was able to get all of their plants up and running and at the time of the meeting was able to state that all plants surrounding the bay were up to full treatment capacity. This is in stark contrast to adjacent municipalities that have had their sewage treatment plants down for months. Questions were asked as to whether the DEP would be taking additional steps moving forward to take additional steps to prepare for future possible storm events and the commissioner indicated that it was a process already underway. Linda Canzanelli Superindentent of Gateway spoke next (her power point is available here. ) There was a great deal of interest as to how and when the parks service would fix the west pond. The good news is that the passage of the Sandy Supplemental bill should ensure funding is available for the needed repairs. Linda spoke of the tremendous damage that was found throughout the park and how Floydd Bennett Field was used as a staging area for much of the FEMA relief effort and how they used the parking field at RIIS park to assist in debris removal. She noted ,as did all of the speakers, how the natural areas seemed to fare much better in some respects than the man made structures. Lenny Houston and Dan Falt of the US Army Corps gave an interesting presentation of a number of projects the corps has underway, how the restoration projects fared during the storm and some of the projects, such as beach replenishment that they will be undertaking as a result of the Sandy Supplemental Bill . Their presenation can be viewed here. The final speaker of the night was Vennetia Lannon the NYS DEC Region 2 director. She revealed the various reponses that her agency was involved in as a result of the storm . From pumping out oil tanks for residents in distress to monitoring air quality in various areas to creating expedited permit process for homeowners seeking to make emergency repairs the agency was fully focused on the storm and its aftermath. Venettia’s presentation can be viewed here. 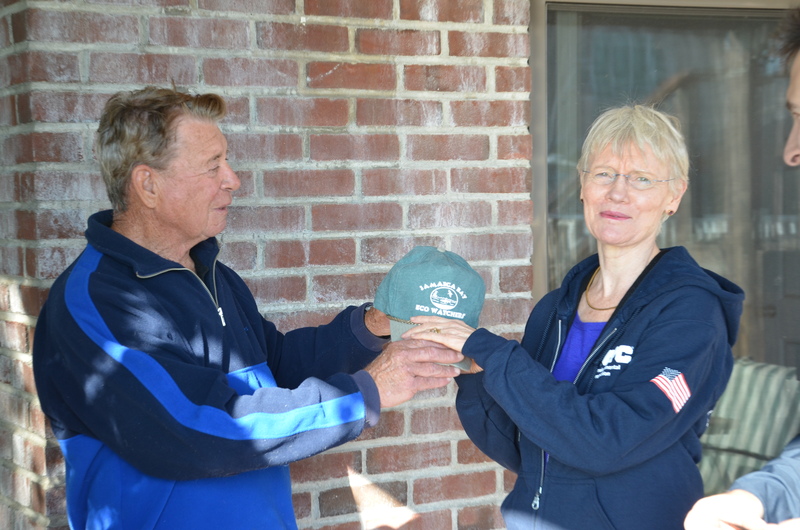 Jamaica Bay Ecowatchers receive Honorary award from Rockaway Greybeard’s for their continued work in protecting Jamaica Bay. 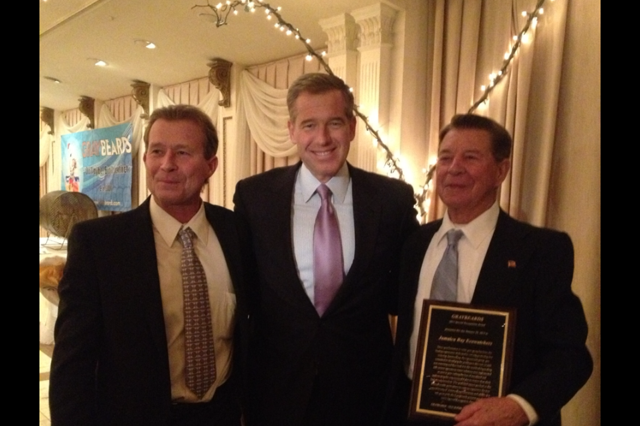 The award was presented by Bryan Williams senior anchorman at channel 4 news. 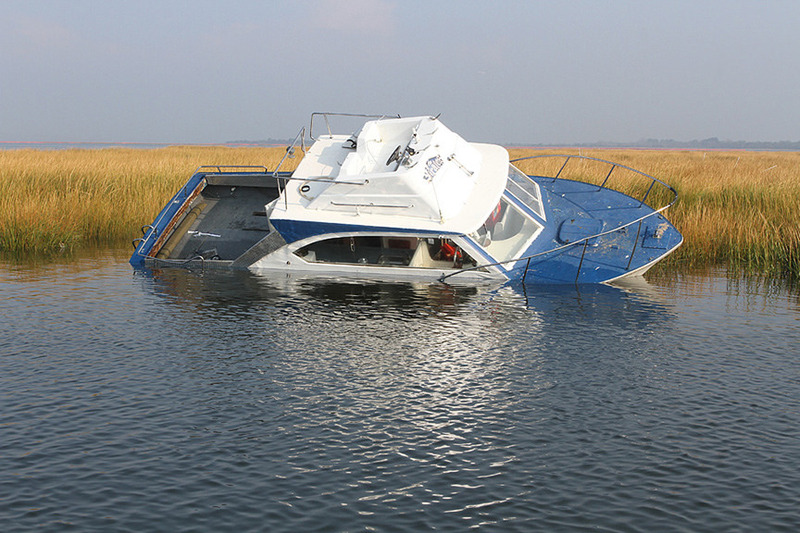 Super Storm Sandy has had a tremendous impact on the entire Northeast and Jamaica Bay and the immediate surrounding communities were perhaps ground zero in terms of its direct hit. Every member of our organization has suffered severe damage to their homes and businesses in the shape of several feet of tidal flooding. In some cases these homes have been knocked down or floated away. We are all working hard and making progress every day and to an individual have all indicated that they would rather live no where else. The Bay has taken a huge hit as well. Fuel oil and debris were deposited in large volumes into the bay during and immediately after the storm. Thanks to the large tidal rise that occurs inJamaicaBay, 5-6 feet twice a day, the fuel oil sheens have dissipated and the waters seem to appear much clearer and cleaner to the eye. The debris in large part has been deposited on the three islands of the bay as well as along the shoreline all throughout the bay. In addition, and perhaps most upsetting, was the breaching of both east and west ponds in which large portions of the retaining berms have been washed away and the fresh water released. This has resulted in both ponds becoming part of the salt waters of the bay. The fantastic product of the visionary Robert Moses, of large fresh water ponds situated within the middle of a salt water estuary, has been wiped out over night. 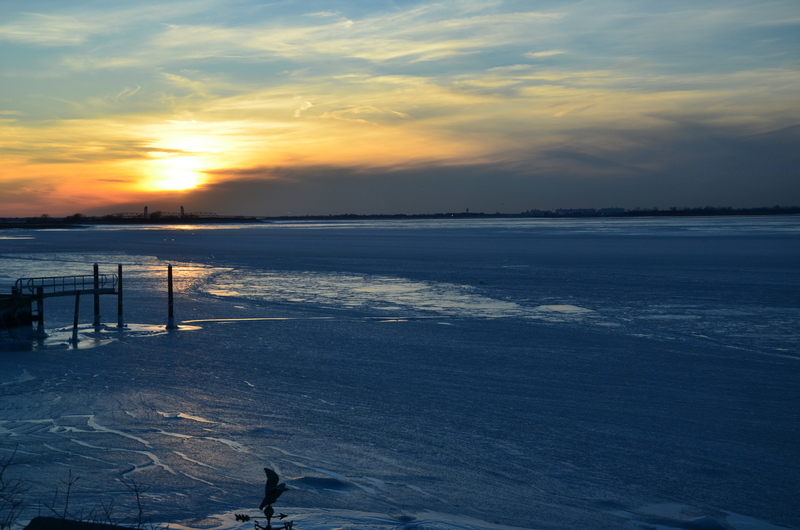 We are planning for a Jamaica Bay Task Force meeting in mid January and will release the date once the particulars and speakers have been arranged. We look forward to hearing from the National Parks Service as to their overall assessment of damages to the Jamaica Bay Unit and their plans in moving forward. Funding will be absolutely necessary and we are eager to hear how the secretary of the interior will fund this recovery effort of the “Jewel” of this national park and we stand willing to assist in lobbying our elected officials to assist this effort. 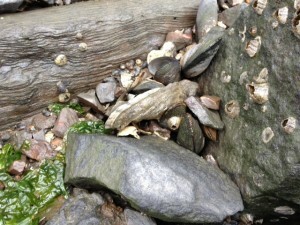 Oysters Discovered Growing in Jamaica Bay !!!!!! Members of the Ecowatchers have discovered at least 15 oysters, perhaps even more, growing in Shad Creek about one half mile from the location of an oyster cage test location. It appears that the oyster spat, from those oyster stored in the cages , has settled at the end of the creek on various types of substrate, including stone, brick wood and even fiberglass, and grown for a period of time that appears to be at least two years in some cases. 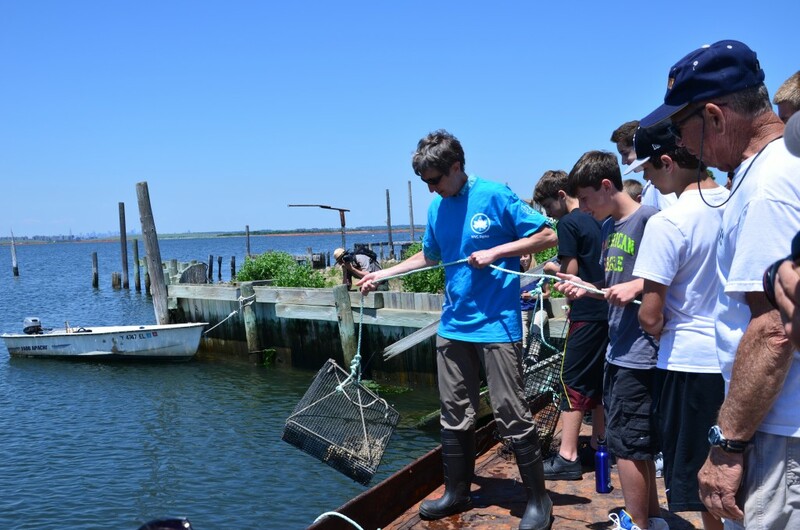 This is a huge development and is to date the first documented cases of oysters reproducing in Jamaica Bay. 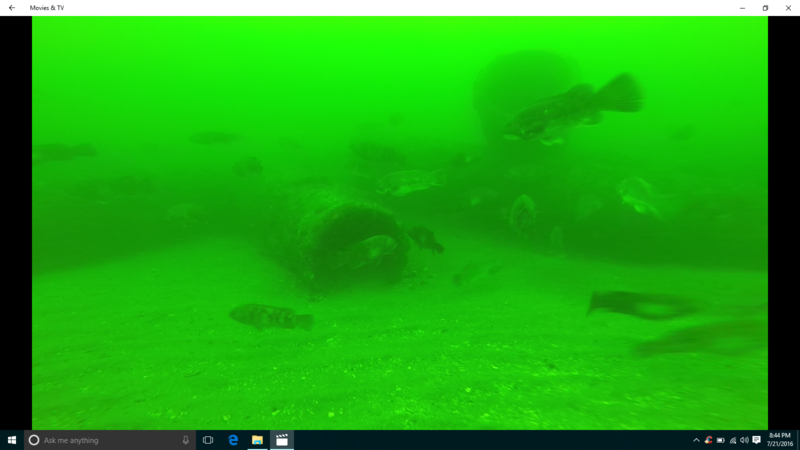 The discovery was made by Richie Lair as he was observing the bottom area ,adjacent to the support poles for the local fishing club. Considering the small size of the cages this amount of recruitment and survival rate appears to be extremely encouraging. Additional photos here. Rulers Bar Island Restoration–Sand Placement Completed! !–Ready for Planting !! Black wall and Rulers Bar Restoration Project has just now seen the completion of Phase 1-Sand Placement and is ready for Phase 2 planting and seeding during the spring 2013 season. OIL SPILL IN JAMAICA BAY !!!! On the afternoon of Thursday September 27th there was an oil spill involving the waters of Paerdegat Basin, a tributary of Jamaica Bay. This spill occurred from a construction operation that National Grid was conducting in which they were attempting to fill an old 20 inch unused gas main with concrete slurry in an attempt to fill it. The gas main ran underneath Paerdegat basin terminating at the corner of Seaview Avenue and Paerdegat avenue north. As the slurry was admitted into the pipe from the Bergen avenue side of the basin it traveled east thru the pipe and pushed a liquid material called “gas condensate” out of the pipe ahead of the slurry mix causing it to spill out onto the street at Seaview avenue and into an adjacent storm drain. This drain carried the product out onto the waters of Paerdegat basin. While an oil spill of any kind is a concern this situation presented a much more compelling concern. Apparently this type of gas condensate was taking out of use many years ago due to its very high PCB concentrate. This oil spill has much more serious contamination overtones as it now involves a PCB release. PCB’s are a hazardous cancer causing compound that does not break down in a natural setting. The big question will be has National Grid ,in addition to spilling 1200 gallons of oil , created a toxic mess in the shoreline sediment ? This is very upsetting as Paerdegat basin , long one of the worst water quality areas of the Bay, has recently seen hundreds of millions of dollars in upgrades to the CSO retention center and the shoreline restoration. The DEC is monitoring the situation and overseeing the cleanup. Substantial fines should be forthcoming for this harmful impact that National Grid has created. September 25 Seed Harvest Completed !!!!! Mission Accomplished!!! !–The trailer shown here is loaded with the harvested seed heads from the two weeks worth of effort to collect enough spartina stalk to be able to obtain a net volume of 225 pounds of seed for next springs planting. This was a tough job and coordinated by the Ecowatchers and the Littoral Society in which volunteers spent hours using sickles to cut and and package the stalks. Under the pressure of a two week window of opportunity before the seed is no longer viable this was a critical component of the project to create the two salt marsh islands and it is a credit to all of the volunteers who came out that we reached our goal !!!! Big Thanks to all and hope to see you all at the planting sessions next spring !! 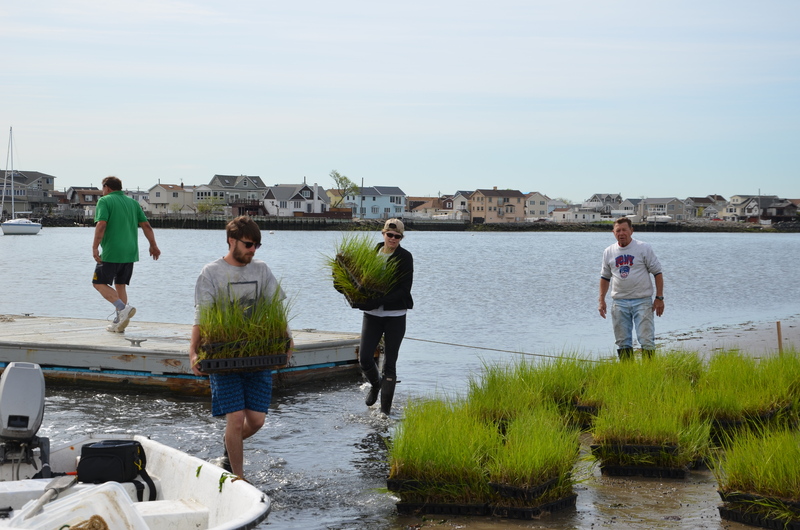 After receiving word from marine biologists with the ACOE that the spartina seed within Jamaica Bay was ready for harvest the Ecowatchers and their volunteers set out to collect seed which will be ultimately be used for next years planting at Black Wall Marsh and Rulers Bar Marsh. 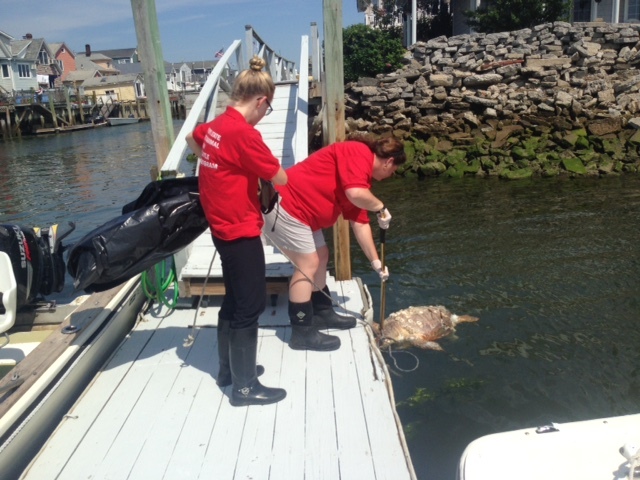 This effort was coordinated with the American Littoral Society and will be ongoing for the next two weeks. THe goal is the collection of 25o pounds of seed. It was a great start and we hope to have continued good weather for the remainder of the harvesting period. At 9 am today pumping of sand onto Black Wall Island began. 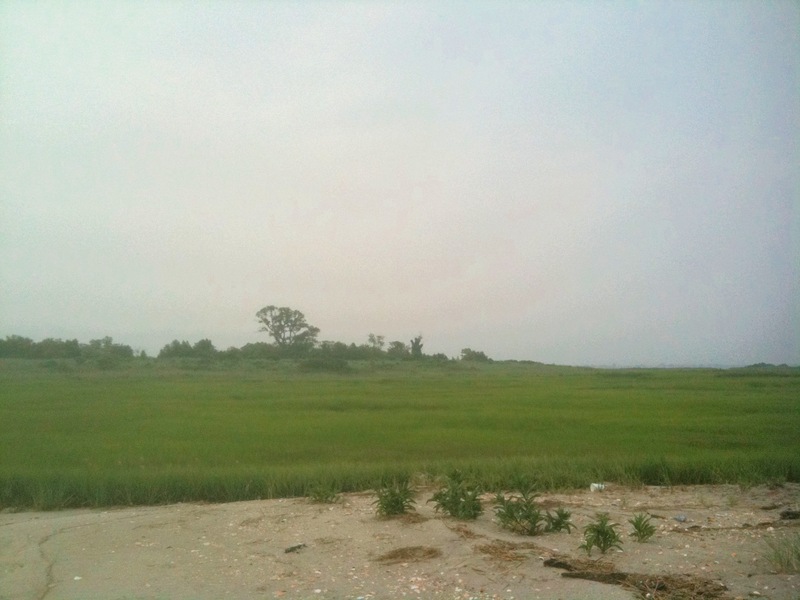 This is an effort to create 22 acres of restored wetlands in the heart of Jamaica Bay. Army Corps prepares to start pumping sand at Black Wall Marsh Project !! 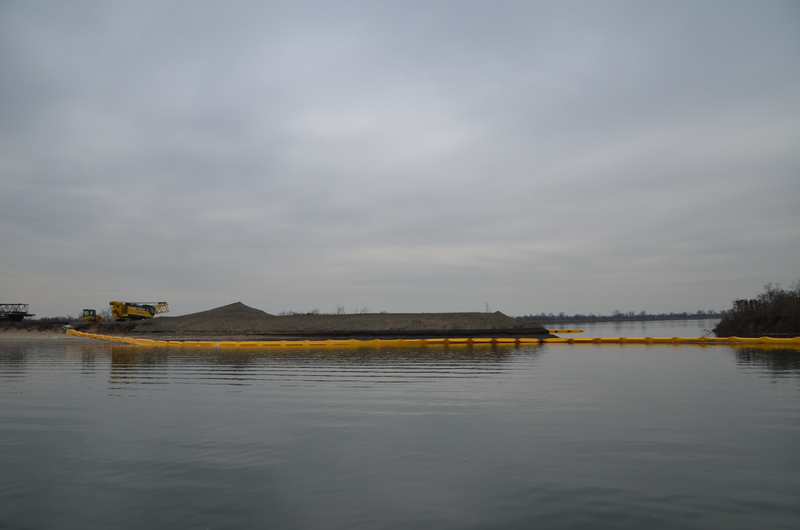 Army Corps Contractors are now working to place dredging equipment at Black Wall Marsh for the next phase of Wetlands Restoration in Jamaica Bay. This Project will see 22 acres created at Black wall and 12 acres of wetlands created at the adjacent island of Rulers Bar . These two once healthy areas have been reduced to small fragmented marsh “Hummocks”. Once the pipeline is in place sand will start flowing to create the proper elevation base for next years planting. 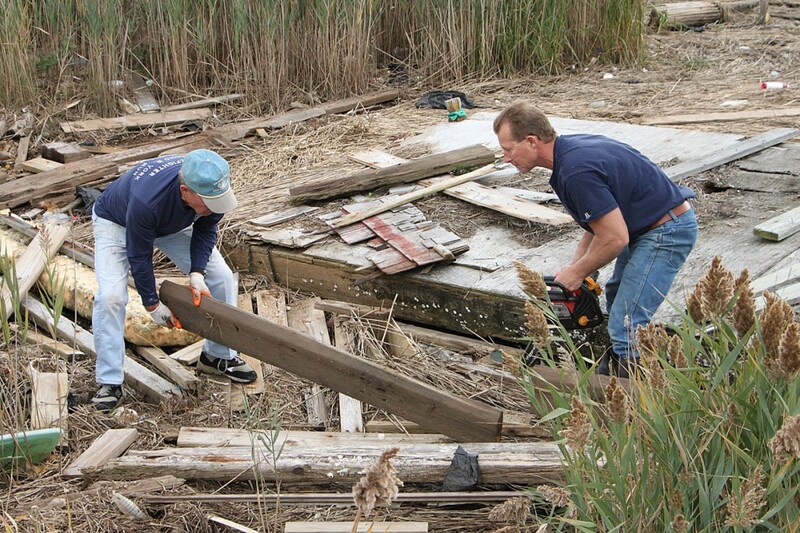 Next Jamaica Bay Wetlands Marsh Restoration Project needs Community Volunteers !! 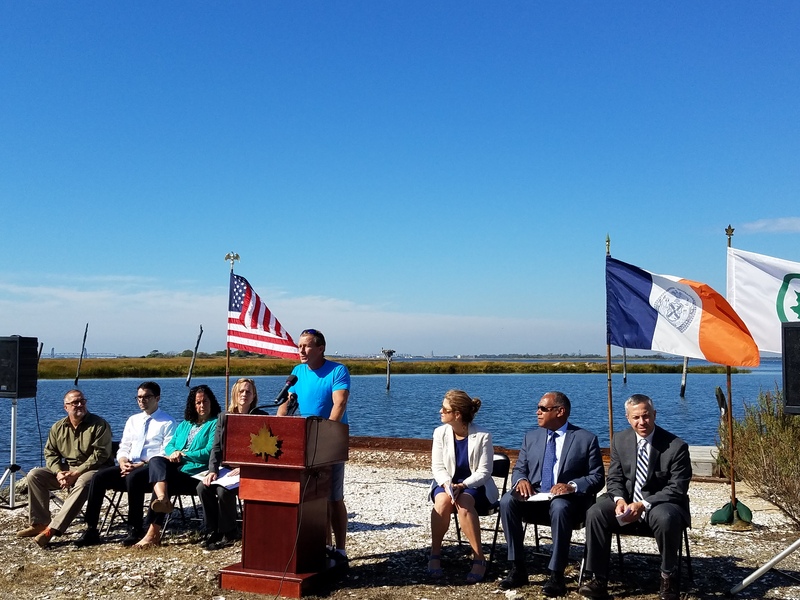 NYC and NPS announce colloborative agreement to manage Jamaica Bay and adjacent city and state parks in order to create one “seamless” park experience. The goal is to create a Conservancy which will draw in Donor Philanthropist’s who will fund numerous upgrades and projects in the park. The Central Park Conservancy and the Golden Gate Bridge Park are two notable examples that are being pointed to as models for this plan. The Ecowatchers have been involved with the initial discussions and plans on this concept and feel that if enacted with local stakeholder input could lead to a world class park that would help to protect Jamacia Bay for future generations and would provide funding for the various restoration projects needed. You can read more about this exciting development here. On May 31st members of the Army Corps led a tour of the yellow bar marsh restoration project that is nearing completion. Present were members of the Jamaica Bay Ecowatchers,the American Littoral Society, National Parks Service, NYS DEC, and the NYC DEP. The progress to date is very impressive and the 45 acres of restored wetlands will be a huge boost for the ecology of the bay. 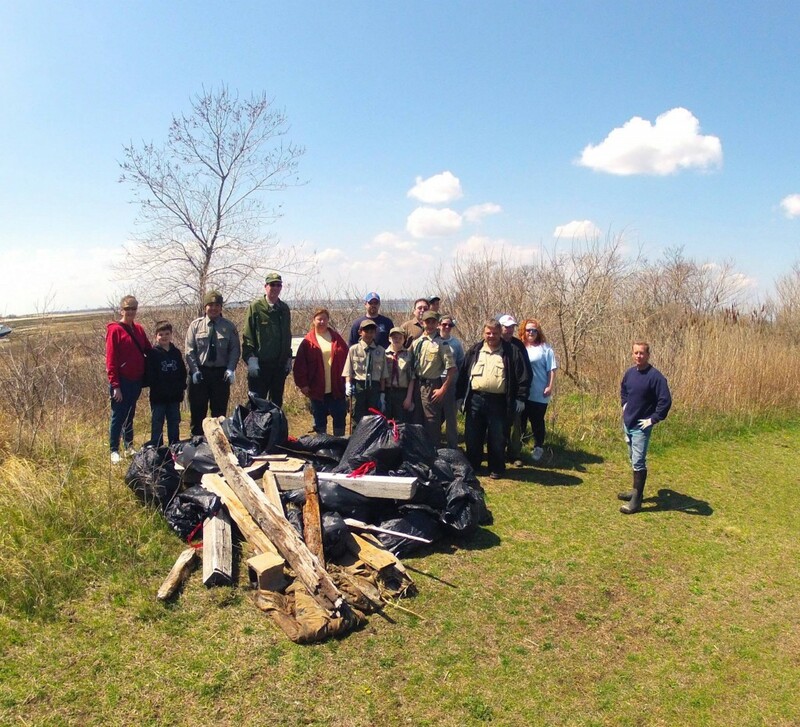 This had been a great example of a colloboration of government agencies and local environmental groups all working together to achieve a common goal. The staff of the Federal Energy Regulatory Commission (FERC or Commission) will prepare an environmental impact statement (EIS) that will discuss the environmental impacts of the Rockaway Delivery Lateral Project involving construction and operation of facilities by Transcontinental Gas Pipe Line Company, LLC (Transco) in Queens andKings Counties,New York. The Commission will use this EIS in its decision-making process to determine whether the project is in the public convenience and necessity.This notice announces the opening of the scoping process the Commission will use to gather input from the public and interested agencies on the project. Your input will help the Commission staff determine what issues they need to evaluate in the EIS. Please note that the scoping period will close on June 25, 2012. The Jamaica Bay Ecowatchers (JBEW), on April 27th, received a very prestigious 2012 National Environmental Quality Award from the Environmental Protection Agency at A reception held at its headquarters in Manhattan.Each year in April, the EPA honors a select number of individuals and organizations in all of its regions nationally. The nominating categories are non-profit organizations, environmental or community groups, business and industry, environmental education, media, and federal, state, local or tribal government or agency- for their efforts to improve the environment.New York’s 9th congressional district falls into EPA Region 2 which includes New York, New Jersey, Puerto Rico, and the Virgin Islands. The JBEW were nominated by Congressman Bob Turner in February citing their tireless efforts” to protect the quality and integrity of our environment”.This year marks the first time in ten years that a community group from the 9th congressional district has won this prestigious award. According to the EPA, to be selected for the award the group or individual must significantly contribute to improving environmental quality during the prior year. They must also demonstrate a high level in the award category, create unique or location -specific benefits, and produce results that are sustainable or reproducible, or increase public involvement in environmental action.The JBEW were founded by its president Dan Mundy in 1998 with a mission to preserve, protect, enhance and restore the 25,000 acres encompassing Jamaica bay, the largest open natural space in New York City.In accepting the award Dan Mundy thanked Congressman Turner “for the outstanding job in reaching out to the community and environmental groups around the bay to try and find out the needs of the bay and what he can do to help”. The Ecowatchers have worked to help Assemblyman Phil Goldfeder craft legislation which would prohibit the dumping of contaminated material into the “borrow pits” of Jamaica Bay. 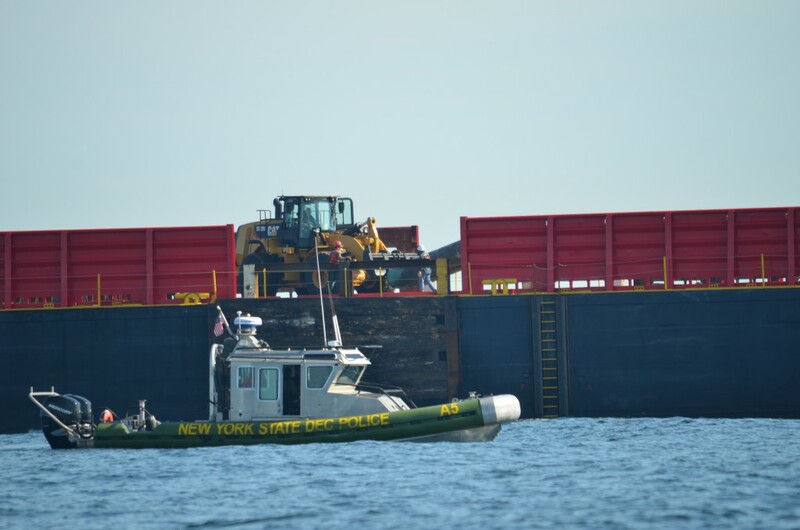 This legislation, if passed, would ensure the end to a thirty year ongoing battle by environmentalists to prohbit the Port Authority from using a loophole in current regulations to place the contaminated fill from the NY/NJ harbor deepening projects into the deep area of Jamaica Bay . This contaminated material is prohibited ,due to its contamination, from being placed in federally regulated waters but the loophole currently allows its placement in state controlled waters. The Port Authority has safe alternatives for the placement of this fill but in an effort to save money has proposed to use the waters of Jamacia Bay. This is a hard to comprehend when you consider that Jamaica Bay,a national park, has been noted as an Estuary of National Significance and one of the most important migratory flyovers on the east coast. In addition it is a nursery for hundreds of species of fish and reptiles and this plan would see the contaminants work there way into the food chain where it would ultimatley be consumed by the many people who feed on the fish they catch in this area. 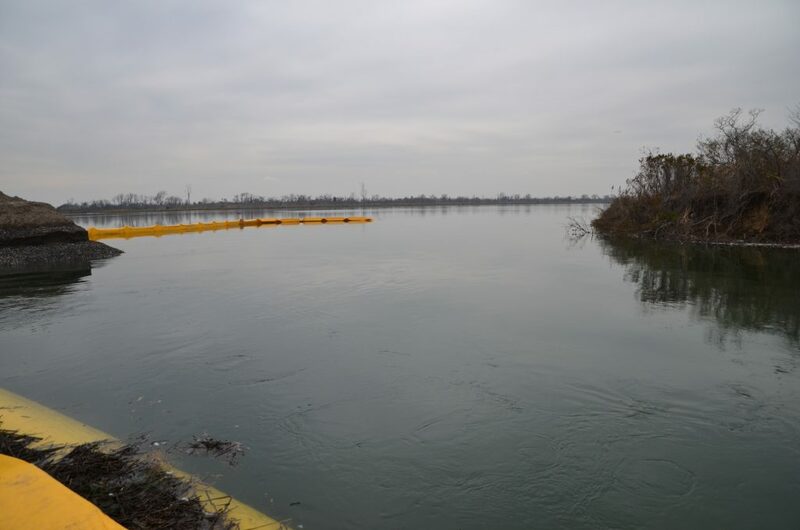 Environmentalists who have reviewed the proposals to use the borrow pits are convinced that this will lead to Jamaica Bay becoming another “love canal” and we believe that this legislation will prohibit these types of proposals once and for all. You can read more about the legislation here. 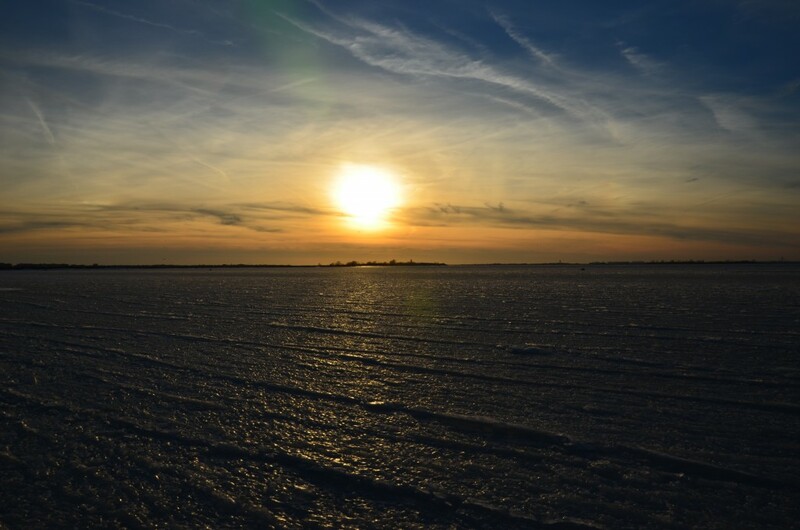 The Jamaica Bay Wildlife Refuge has often been called the “Crown Jewel” of this National Park and the reason for this are the two freshwater ponds that the visionary Robert Moses had built over 50 years ago. The West pond is extremely accessible to visitors with the walking trail that rings its perimeter and provides stunning views of the many varied bird species that are drawn to its fresh water supply as well as breathtaking scenes of the bays wetlands with the manhattan skyscrapers as a backdrop. This irreplaceable resource is now threatened. The drain pipe for the pond ruptured this winter. 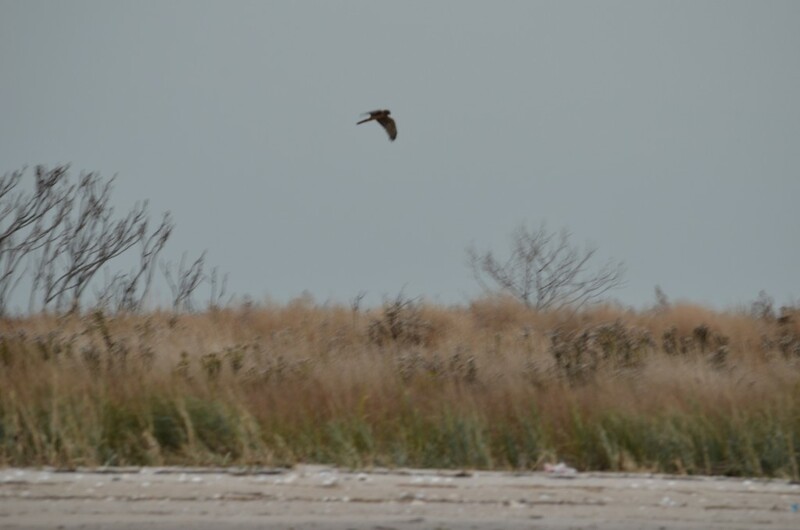 The Jamaica Bay Ecowatchers were the first to note and report this. The pipe remained broken for a few weeks and in that time the salt water of the bay filled the pond to the point where the salinity rate of the pond is the same as the bay–in effect eliminating it as a fresh water source for the thousands of shore and migratory birds. This situation must be immediately corrected by fixing the broken pipe and draining out much of the salt water to allow for fresh water to refill this area. At this time the National Parks Service has no funding to correct this situation and the Ecowatchers are asking concerned residents to call Senator Schumer and Senator Gillibrands office to request assistance. 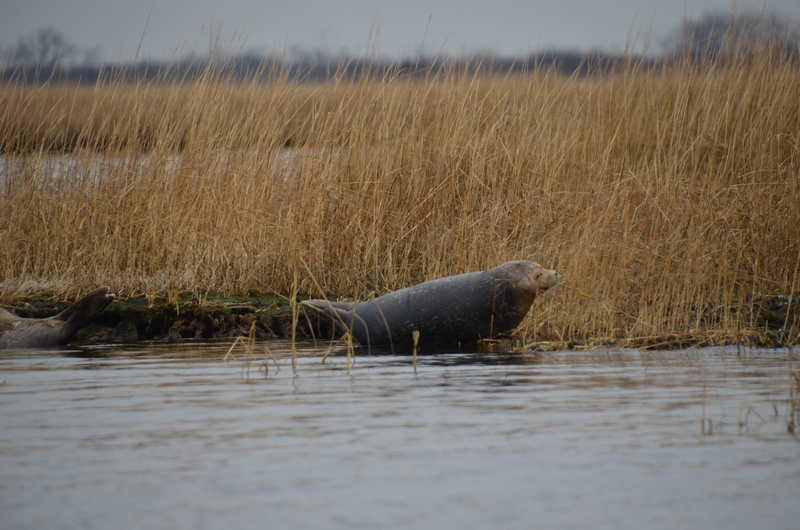 The Jamaica Bay Ecowatchers have filed with the Federal Energy Regulatory Commission- FERC- as an interested party to the Rockaway pipeline and this results in notification by FERC to our organization for all documents and updates filed for this project. Listed below are the numerous links that individuals can use to find out more information on this proposal. The April 24th Open House will be from 7-9 p.m. at the Knights of Columbus 333 Beach 90th Street, Far Rockaway, New York, 11693. April 25th Open House will be from 7-9 p.m. at the Aviator Sports Complex, located within Floyd Bennett Field. The proposed natural gas pipeline that has been in the headlines lately has raised a number of concerns. This pipeline is described as necessary to augment gas supplies to both Brooklyn needs as well as that of Rockaway and Breezy Point residents. The proposed pipeline will tap into the Transco Williams Pipeline that runs parallel to Rockaway and is under the sea floor about two and a half miles off shore. The new line will run perpendicular to the existing line and come ashore in Rockaway near Fort Tilden and then run under the sea bed of Jamaica Bay exiting on the Brooklyn side where it will run north to a hanger in Floyyd Bennet Field, which is part of Gateway National Park. Here one line will continue north up Flatbush Avenue and another smaller line will return to supply Rockaway and Breezy point. 1) Why has there been no opportunity offered on the part of the National Park Service for the public, and the very involved environmental groups working in the area to be made aware of this plan and to hold meetings and comment on its merits before it was made an act of congress. 2) During the various meetings that residents were asked to attend in which they were put into groups and asked for input in developing a vision for the park why was no mention made by the NPS that a portion of the parkland was going to be “alienated” and given over to a corporation . 3) How does this particular situation impact the future decisions for this National Park? If a portion of the park can be given over to, in this case, a large corporation without any notice or input what future changes will be made to the park lands with similar lack of public participation. 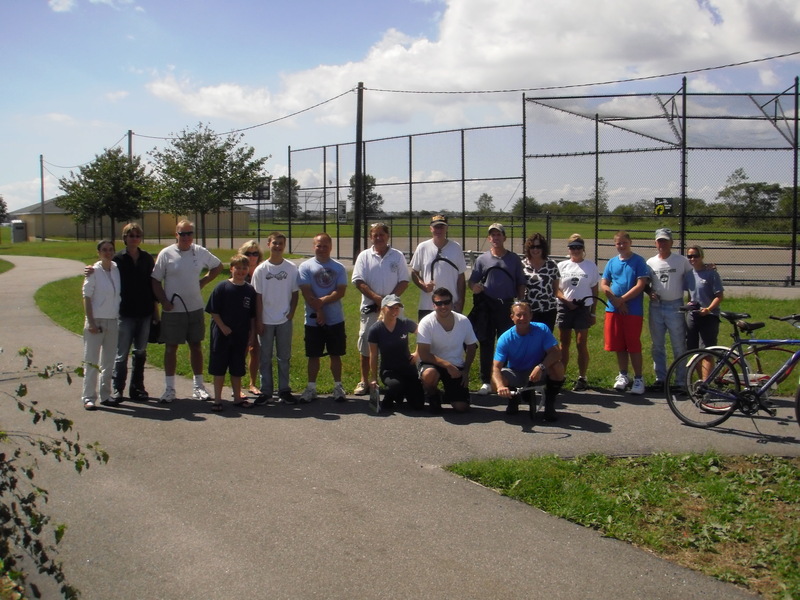 4) If funds will be made available to Gateway National Recreation Area (GNRA), which encompasses Staten Island and New Jersey lands, will those funds be spent at Floyyd Bennet Field, which is desperately in need of funding for improvements? Or will those funds be spent at the other areas within GNRA? Will the funding go directly to Park improvements ie bike paths, restoration projects, other projects that will increase the visitor experience or will it go into Personnel expenses, salaries, etc in which case no changes will be noticed at the park. 5) While the portion of the pipeline that runs under the bay will not disturb the bay bottom due to the HDD –Horizontal Directional Drilling, process that will be used this is not true for the over two miles of ocean bottom which will be ripped open to form a trench to bury that pipeline in the ocean. How much Environmental impact will that have and will it impact the “critical habitat, as described by the State DEC, of the Rockaway Reef. 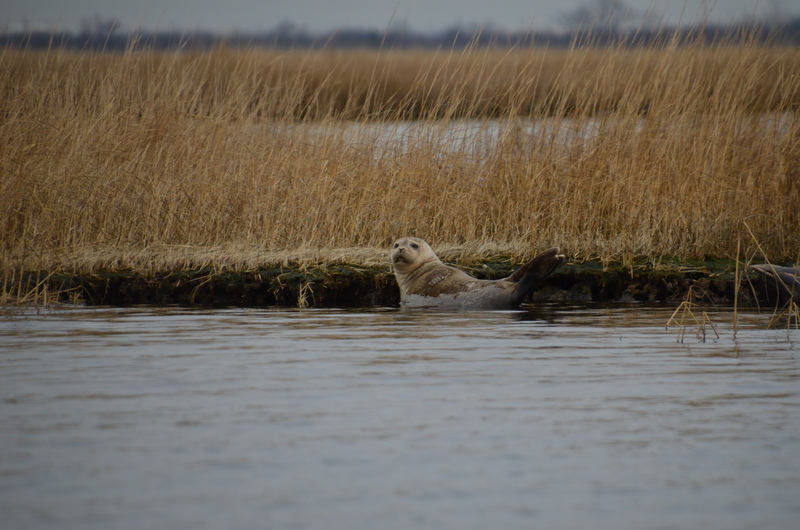 Many more questions will be raised and this is now slated to be a topic at the April 4th JAMAICA BAY TASKFORCE MEETING to be held at the wildlife refuge on Crossbay Blvd . NYC has developed a “WETLANDS STRATEGY DOCUMENT” to lay out a compehensive plan to achieve the goal of “no net loss” of wetlands within the city limits. This plan is a result of the NYC wetlands transfer taskforce work and one in which the Ecowatchers participated and supported. The Wetland Strategy concept is one which will see NYC leading the nation in terms of long term protection of its natural resources. You can see our submitted comments here. 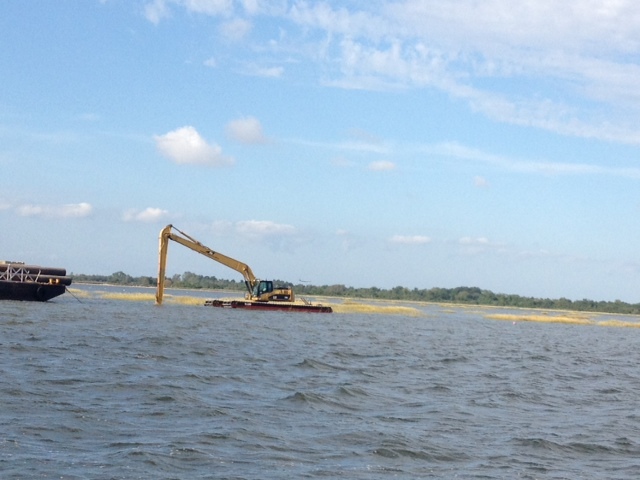 Pumping begins at Yellow Bar Marsh Project ! 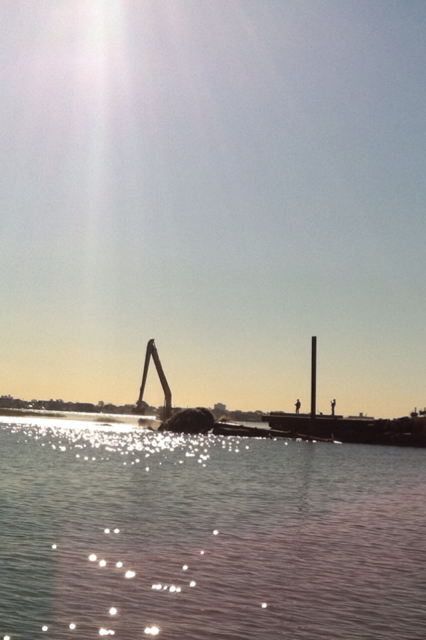 Today at 3:50 pm the Dredge Vessel “ Dodge Island” arrived in Jamaica Bay with a hold full of clean sand, that had been obtained from the open ocean Ambrose channel approach area off the coast of Rockaway, and hooked up to the Pumping Barge that is currently located in Jamaica Bay just off of beach 127 street in rockaway beach. 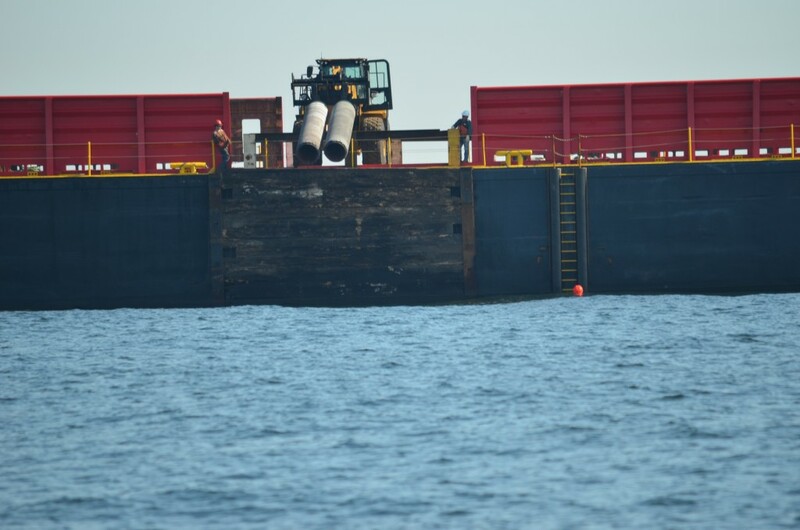 The sand in the hold of this vessel in now being pumped over one mile thru the 30 inch submerged pipeline that is depositing it on the northern section of yellow bar marsh island. 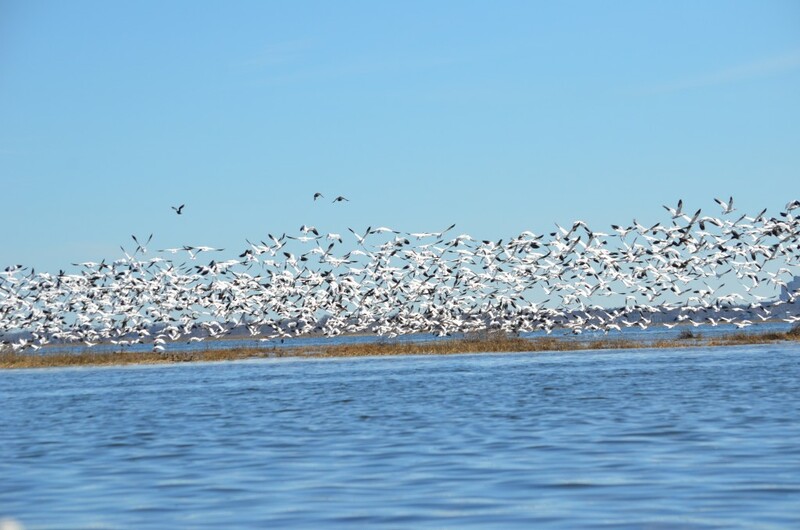 The Army Corps of Engineers are spearheading this 16 million dollar project to restore over 42 acres of wetlands to this critical area that has seen a huge salt marsh loss over the last decade. The Corps are working with the NYC DEP, the National Parks Service and the NYS DEC. 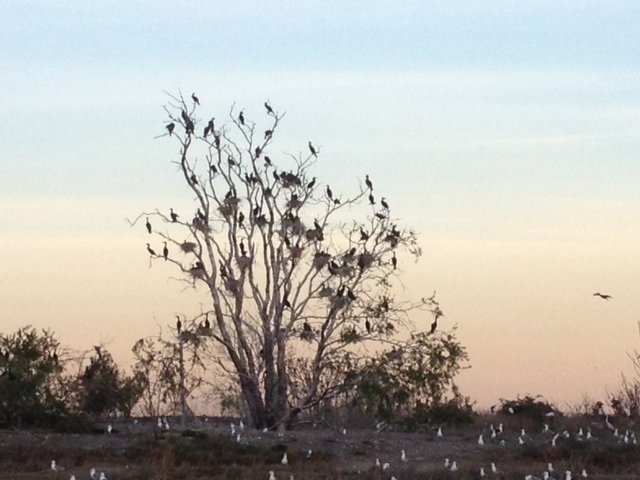 The results of the collobaritive effort will have a huge impact on the health of this bay! The Ecowatchers have worked to bring our newly elected Congressman, Bob Turner, and State Assemblyman, Philip Goldfeder, up to speed on this critical effort and are pleased that both have pledged their support to this project as well as the overall protection and preservation of the bay and will be working with us to continue these highly successful restoration efforts! The Yellow Bar Project was featured on NY 1 and can be viewed here. The Jamaica Bay Ecowatchers attended and offered comments at last nights meeting of Community Board 18 which addressed the latest plans for the four sparrows marsh area. The meeting was specically focusing on the ULURP request for the new plan to develop the area adjacent to the four sparrows marsh area . This would be the site of the current Toys r Us on Flatbush avenue. For those not aware the Four Sparrows marsh area it is an area of extremely critical ecological value consisting of 65acres of salt water marslands and upland tree area. Last year NYC EDC (Economic Development Corporation) rolled out a plan to pave over and develop this area that was NYC parkland . 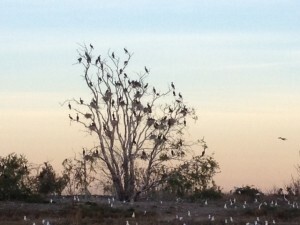 Many of us assumed that this area could not be developed as it was protected under the “forever wild” statue –as all of the city parklands are supposed to be. While the city itself had designated this area parkland and even placed a forever wild sign on it they came up with the very disingenious scheme that stated that because the area was never “officially” mapped as forever wild that it was unfortunately not protected. This created a huge opposition that seemed to be going nowhere until Senator Carl Kruger was indicted for corruption and a portion of it involved his actions in pushing for the development at the Four sparrows site. Last nights meeting saw EDC display a much scaled down version of development that for the most part left the four sparrows area alone except for a 60 foot wide area that will run from flatbush area back to the water which will be used for ” some parking but mostly as a buffer area with trees and plants” according to EDC. The meeting was well attended by members of the environmental community. The Ecowatchers spoke of the huge loss of critical salt water marsh that Jamaica Bay has experienced, and that how currently we are working hard to procure funding to continue the marsh restoration efforts underway and that it was very difficult to understand the previous plan to destroy one of the last large tracts of healthy wetlands area of the bay. 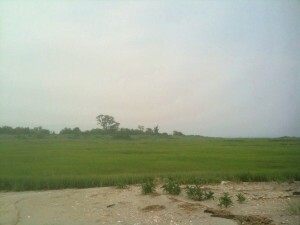 We expressed our appreciation for the new plan that would basically leave almost all of the four sparrows marsh area untouched but we suggested that community board 18 should with hold any further support for any development at the adjaccent area until they were able to secure the “official” designation for the four sparrows area as protected and “forever wild”. It seemed the board is intent on protecting the remaining four sparrows marsh area and hopefully they will follow thru on their promises to ensure it is officially protected. Lets hope that they are sucessful before another devious politician sets his sights on it.